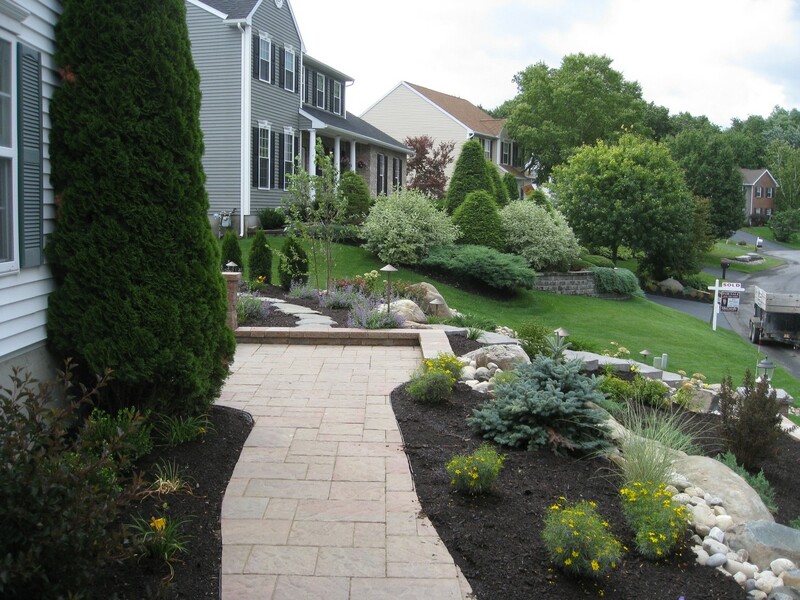 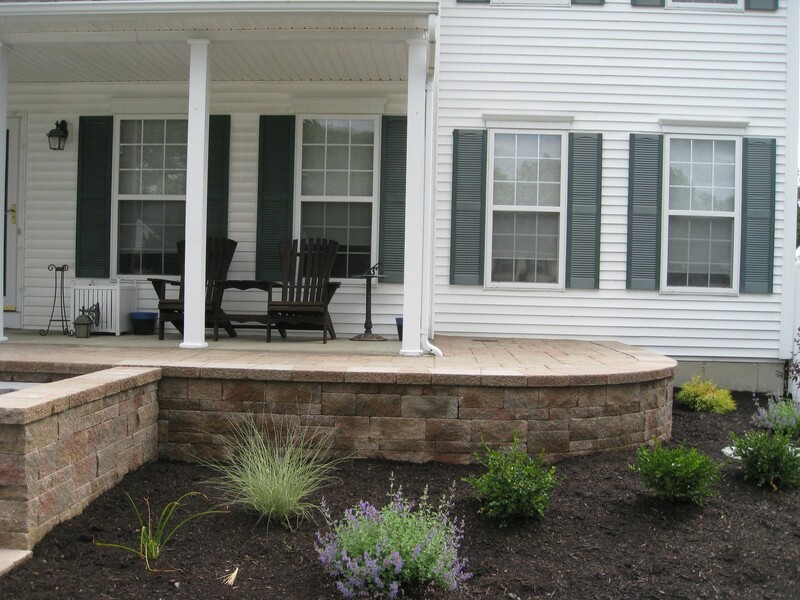 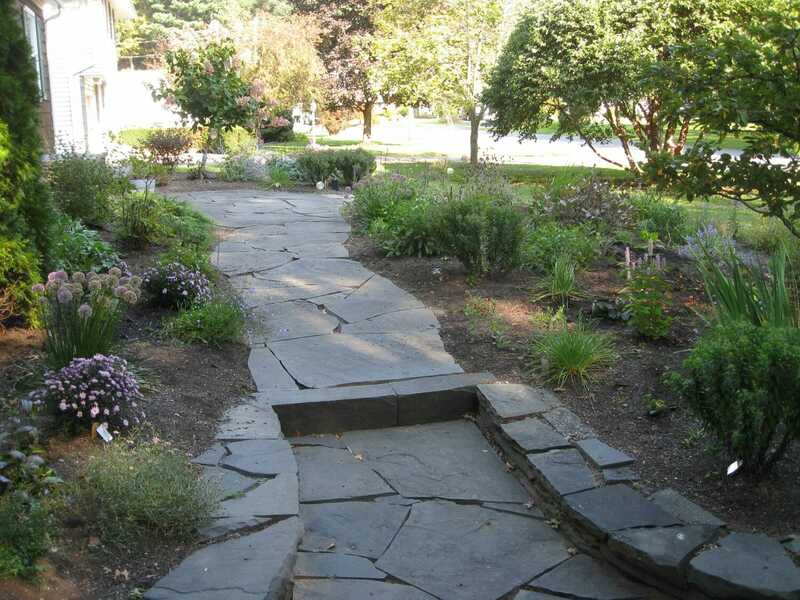 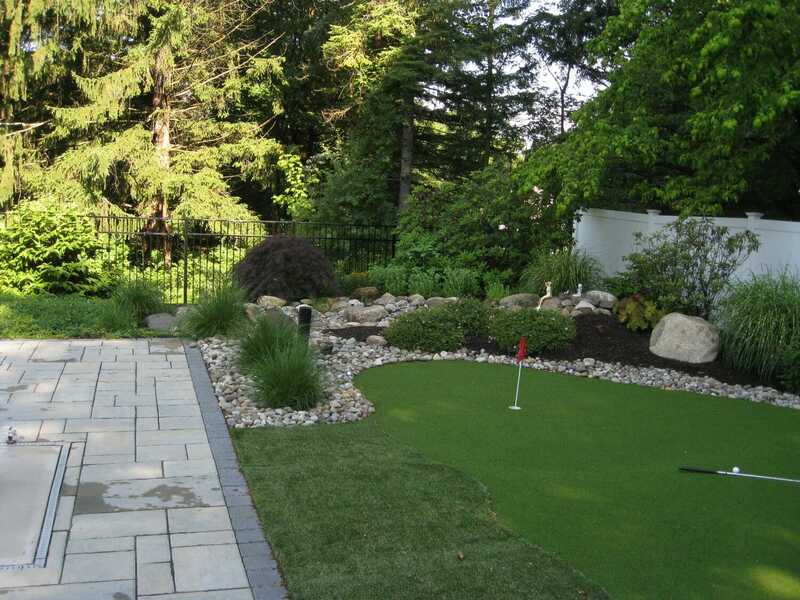 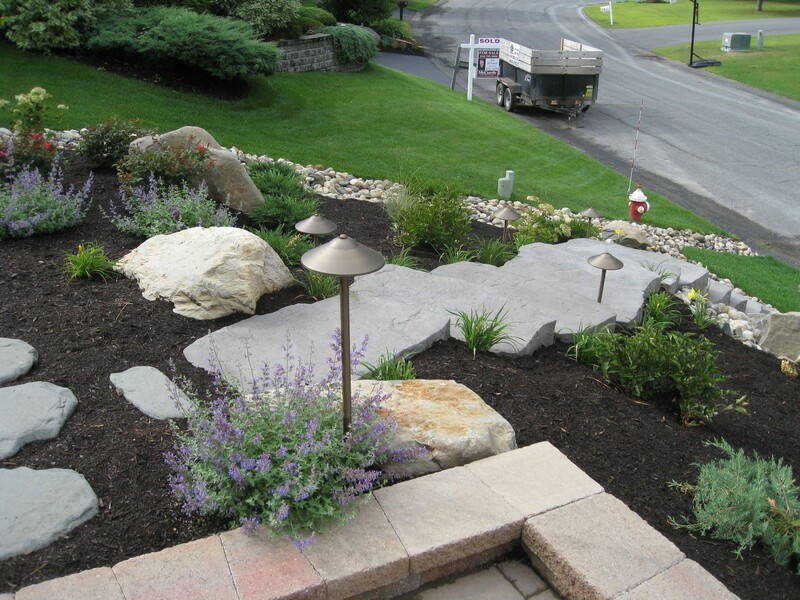 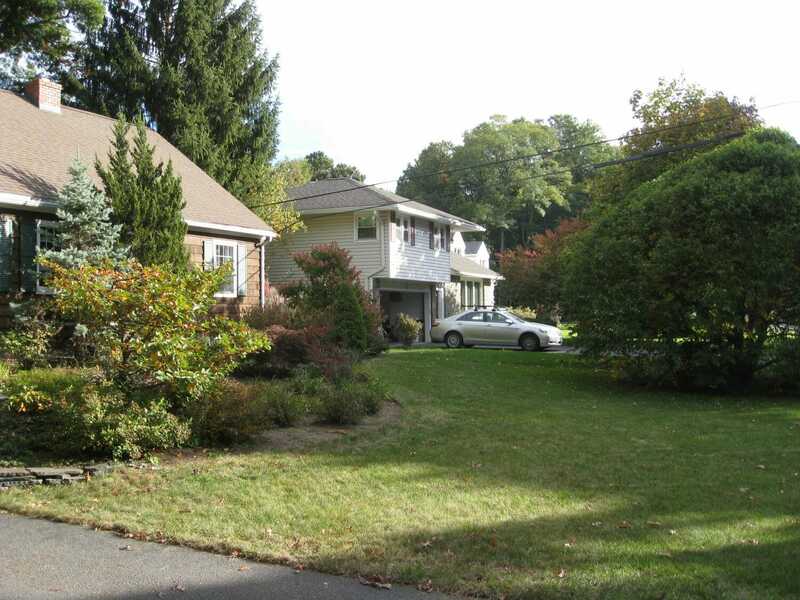 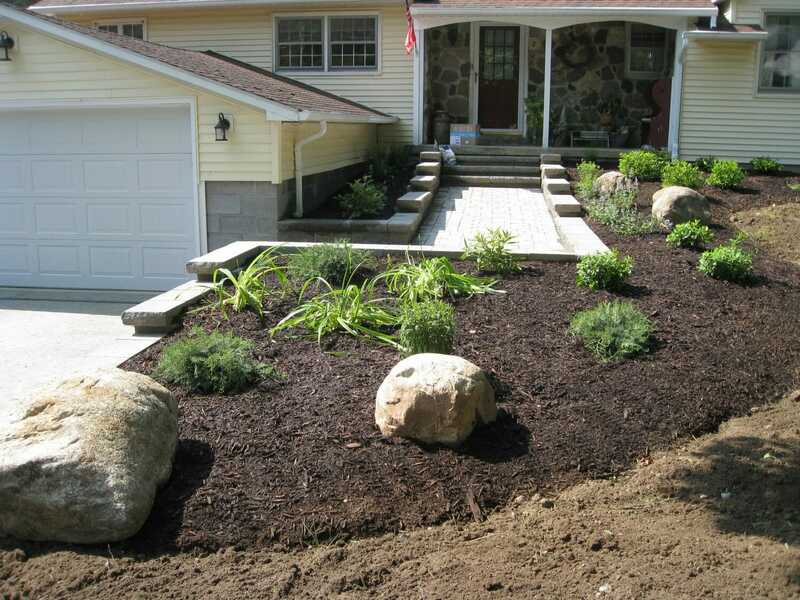 Land Design Inc. portfolio of Albany NY area landscape design projects. 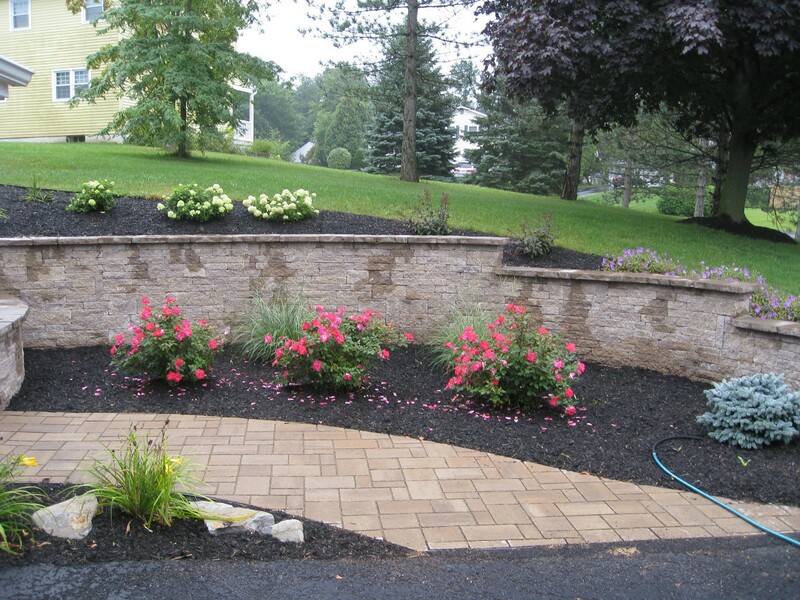 Welcome to our Portfolio page. 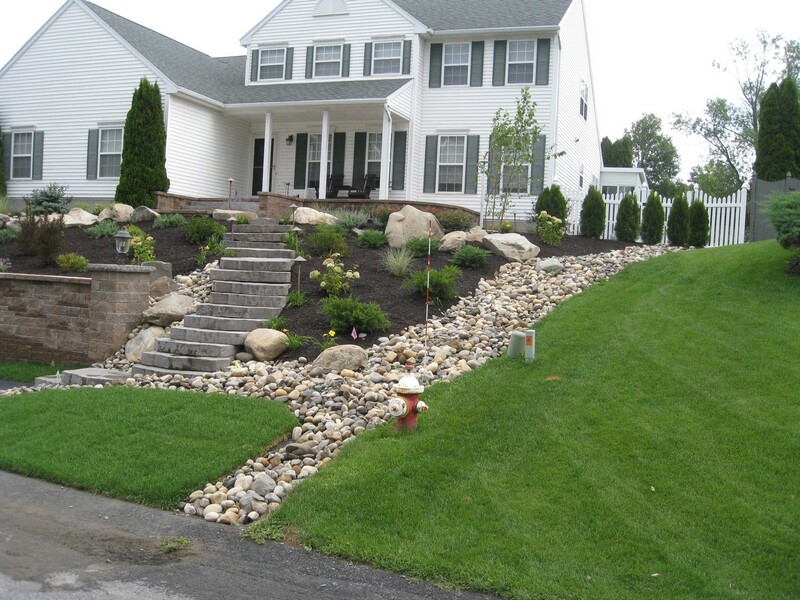 Here a few of our landscape design projects. 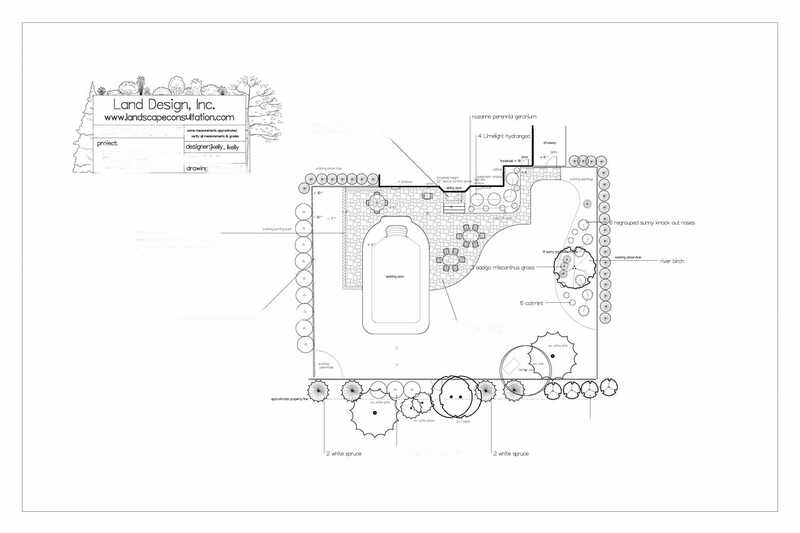 Laura and I have designed literally hundreds of projects, each unique to its site and client. 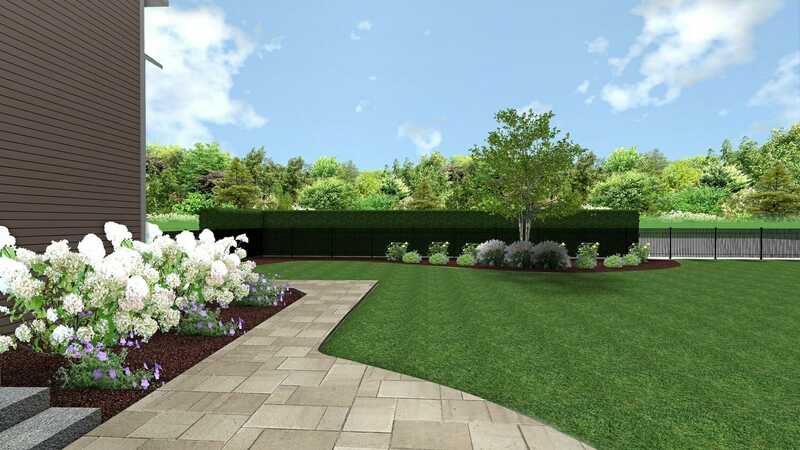 If you don‘t see what you envision, that’s OK; we will help you bring your dreams and goals to life! 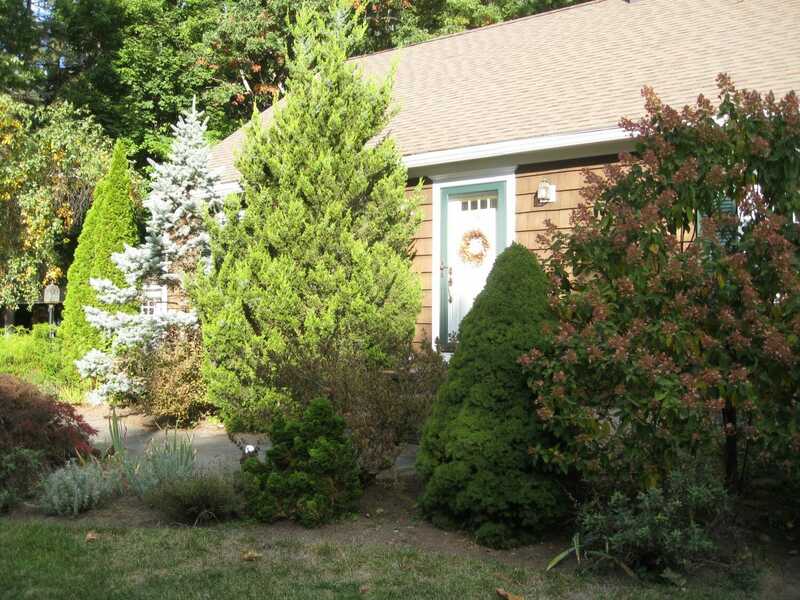 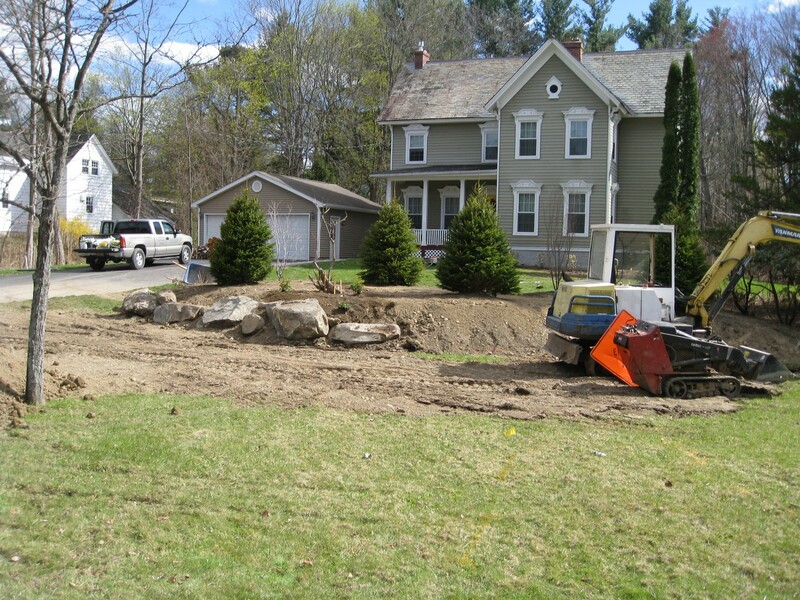 This tiny yard in Albany, NY was plagued by water problems. 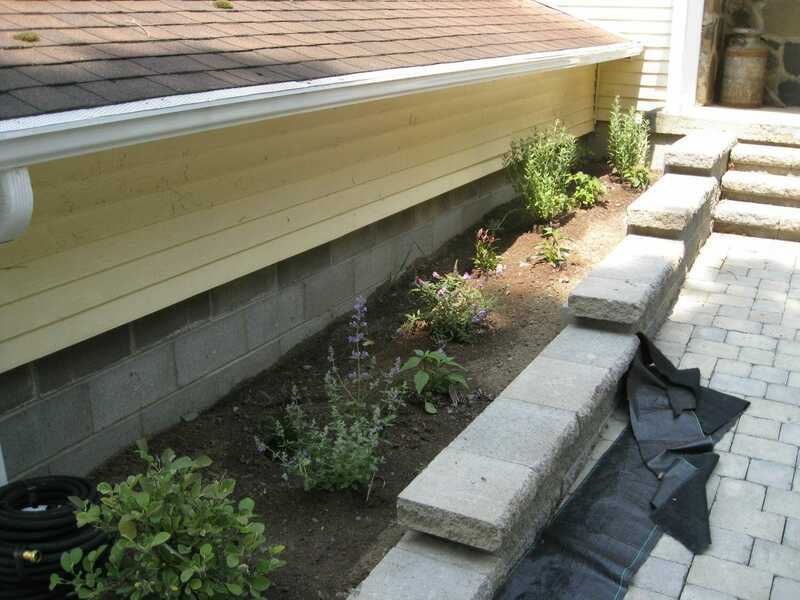 Water from uphill neighbors would end up in the yard and basement water infiltration occurred. 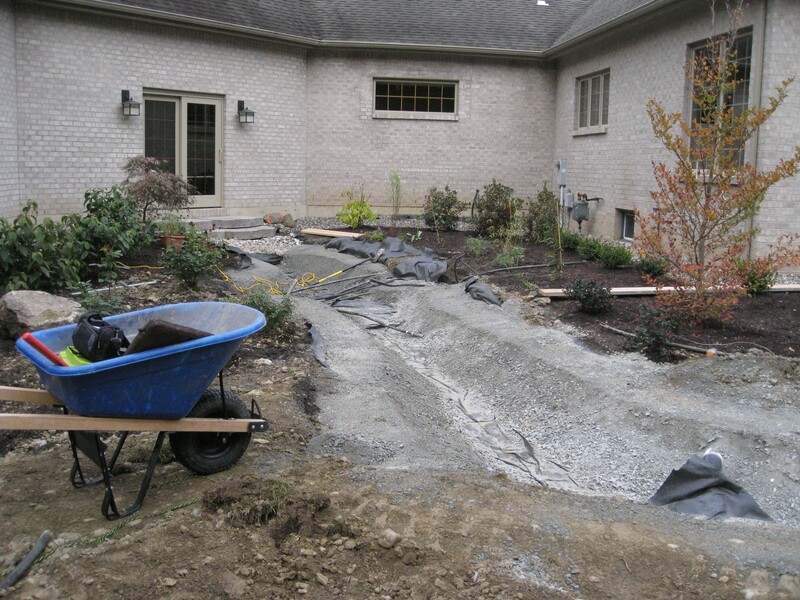 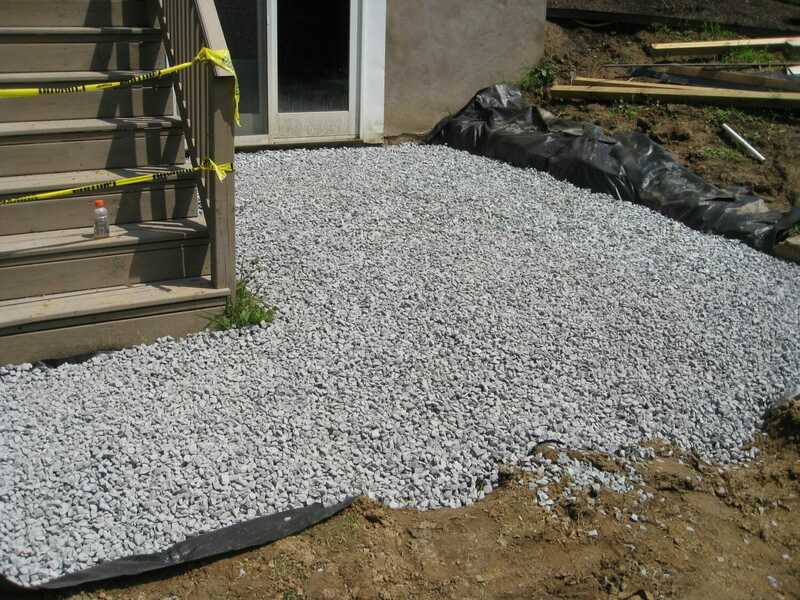 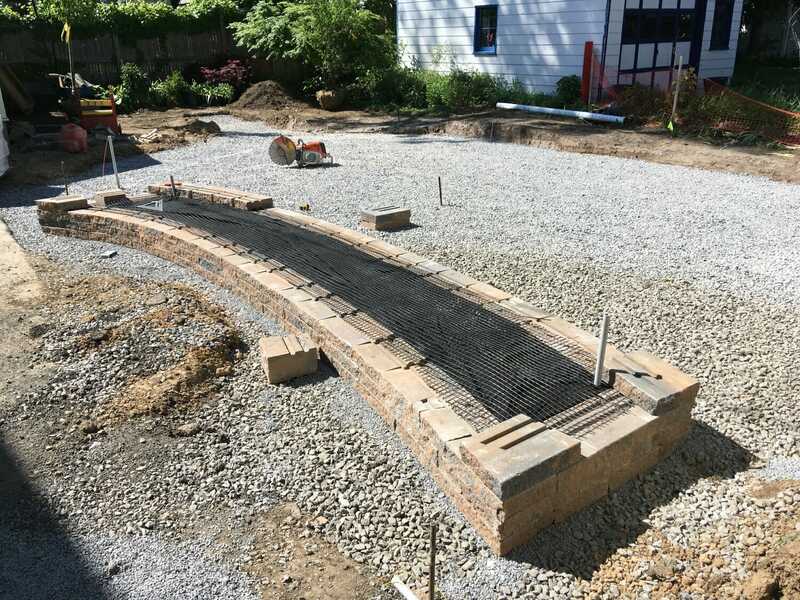 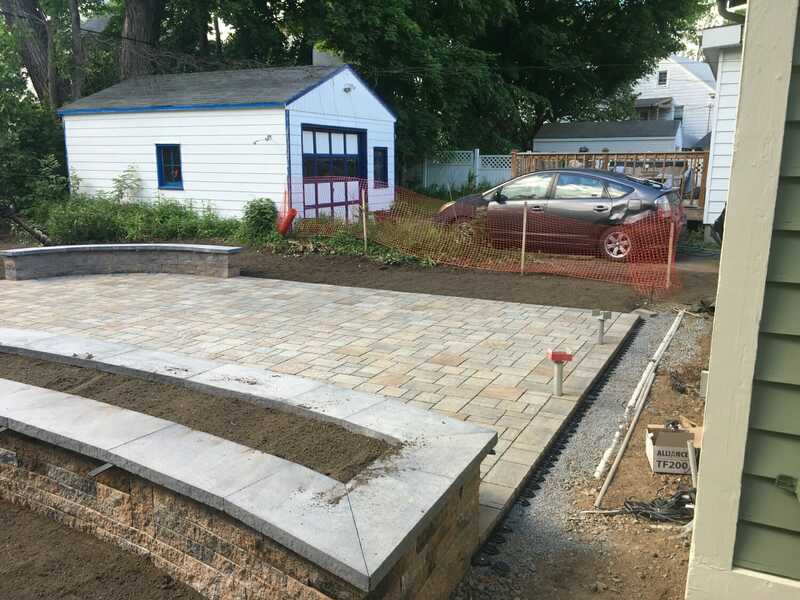 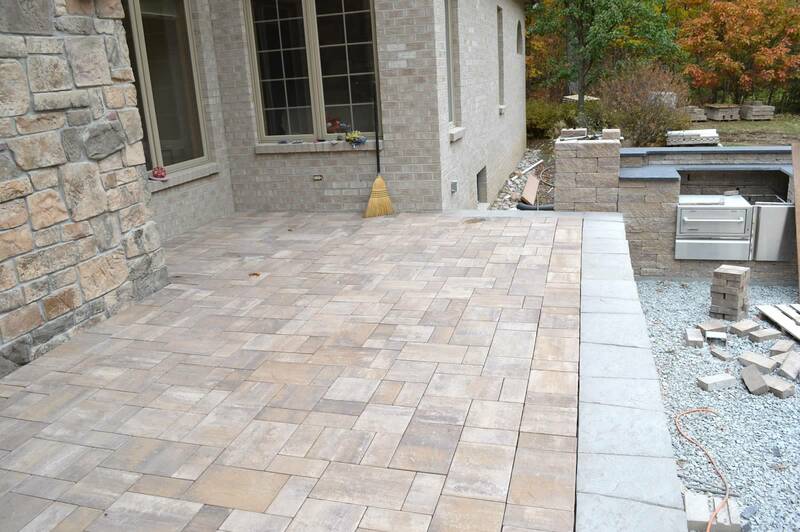 The homeowners contacted us to design a patio outdoor room for them and, by using a permeable paver system, we protected the house from further water damage. 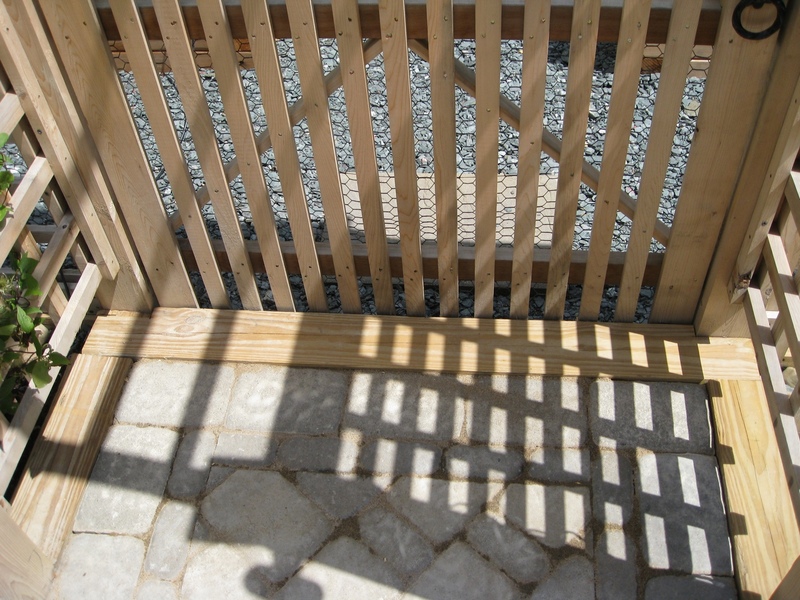 The oversized drainage base under the patio allows water to filter into the ground naturally while a pipe carries excess water to the street if necessary. 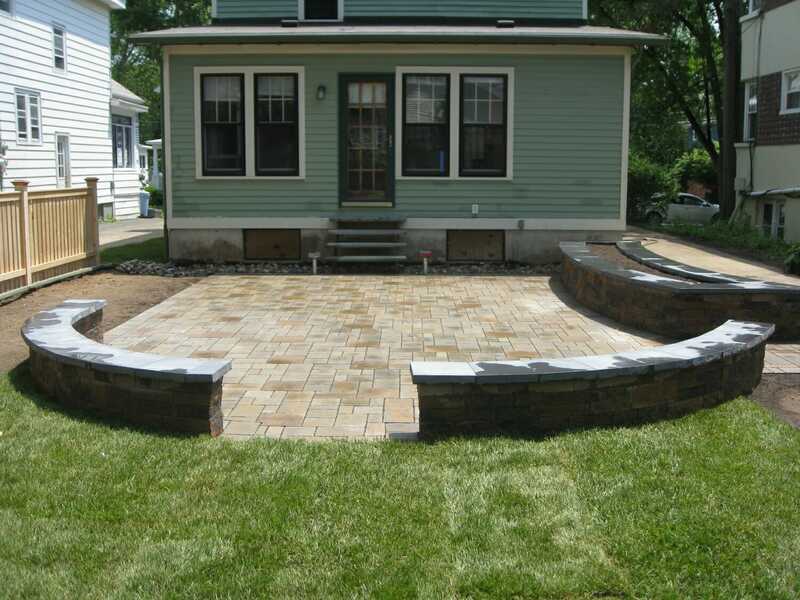 Seat walls and a raised planter complete the space. 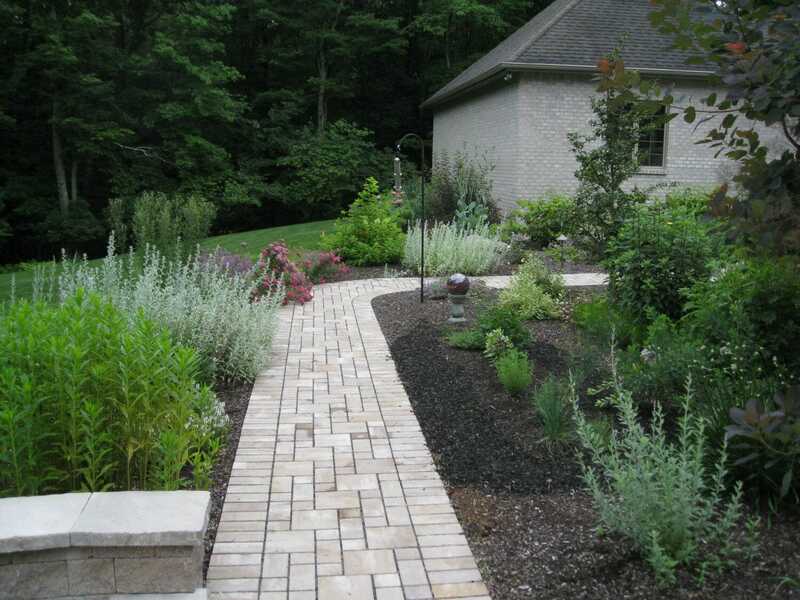 Permeable paver systems allow water to drain freely between the pavers through tiny gravel infill. 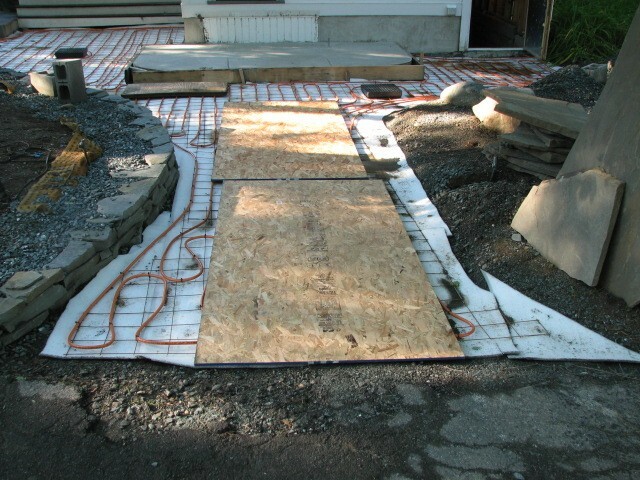 This insures that there will never be a puddle on your patio and the deep drainage base protects the patio from heaving due to the frost / thaw cycle we have here in the Albany area. 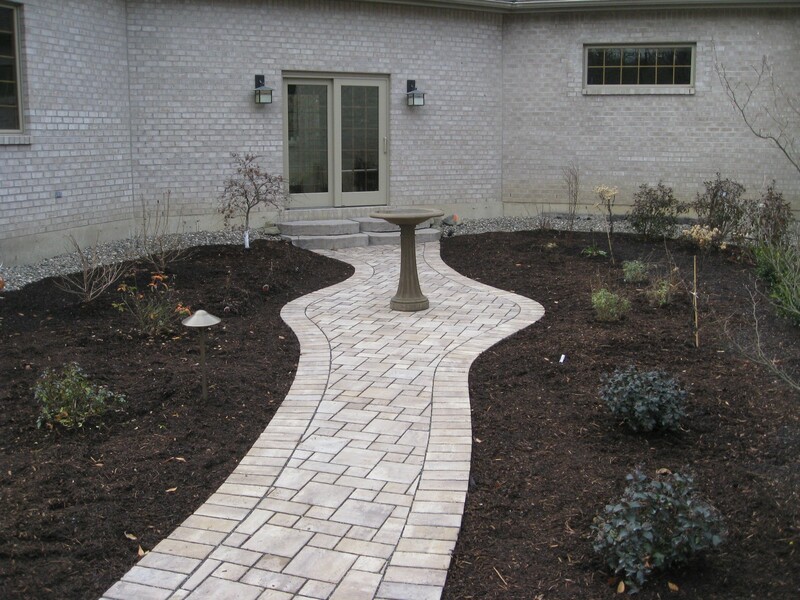 Permeable paver installations are far superior to poured concrete in this regard. 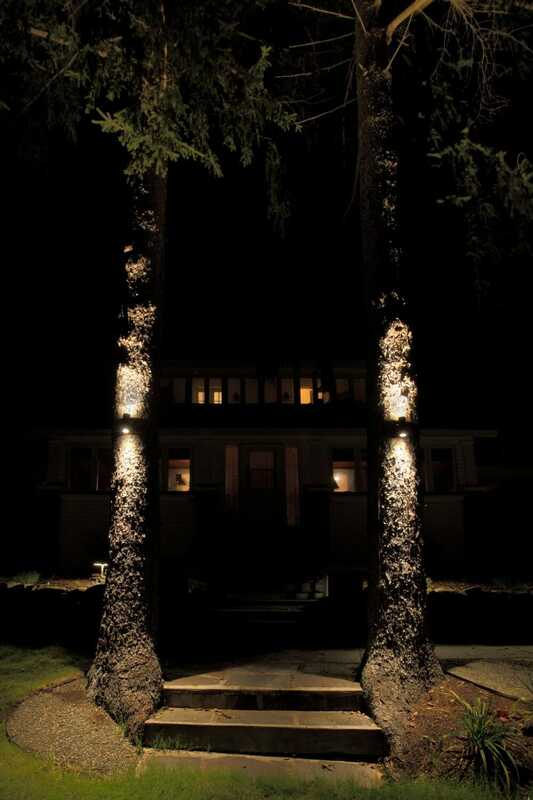 LED energy efficient lights under the wall caps subtlety light the space at night. 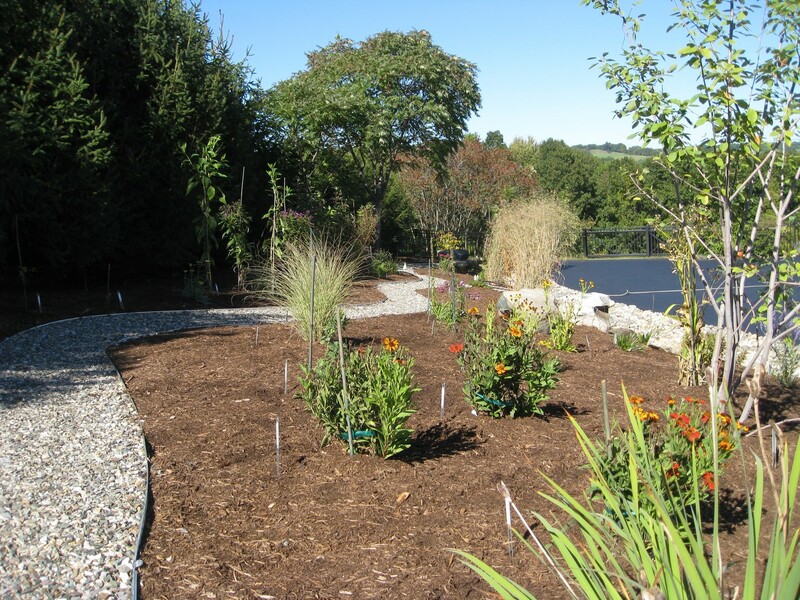 This project focused on editing down a conventional landscape planting that was poorly planned and severely over planted. 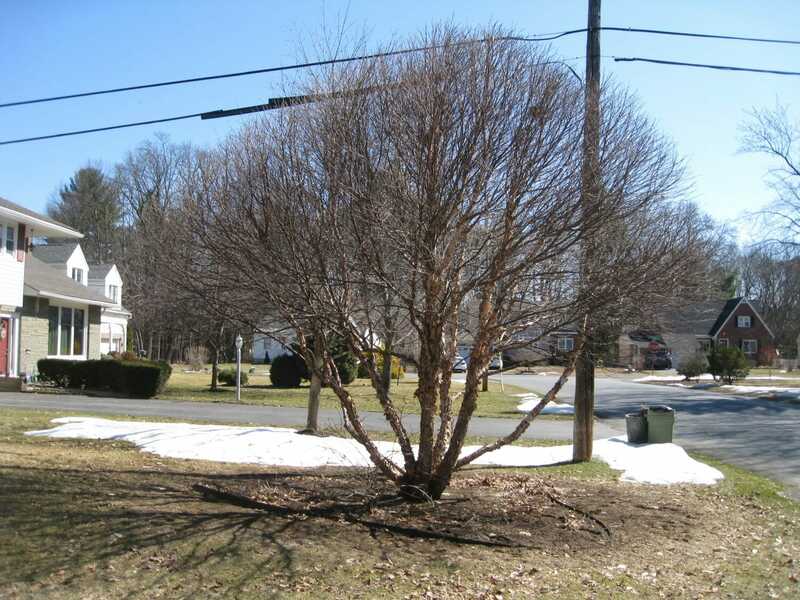 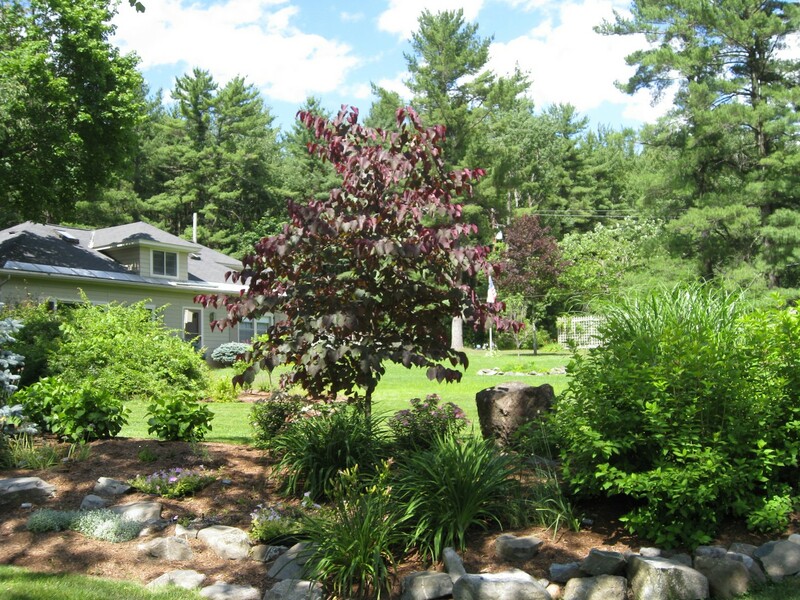 We kept viable large shrubs and thinned and limbed up a beautiful but visually dominating river birch. 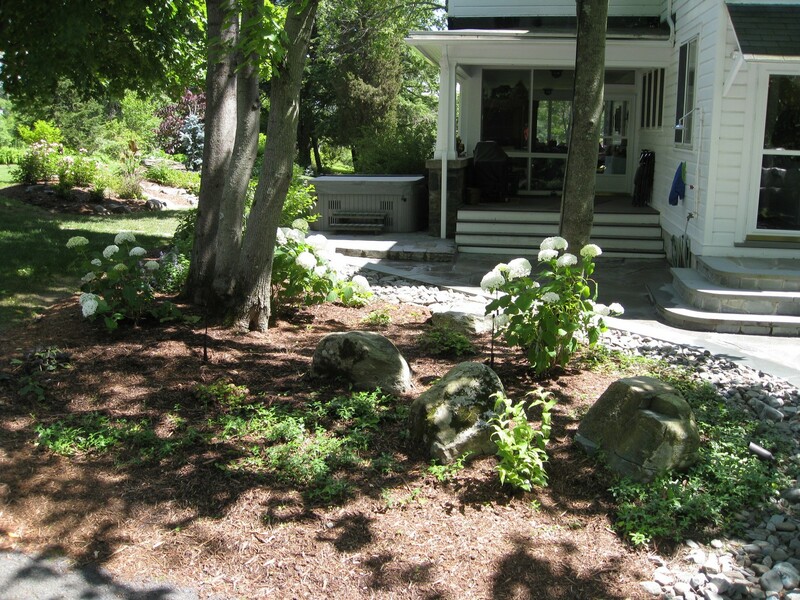 Both native and low care non native pollinator and insect friendly perennials were used to keep to enliven the space without hiding the house. 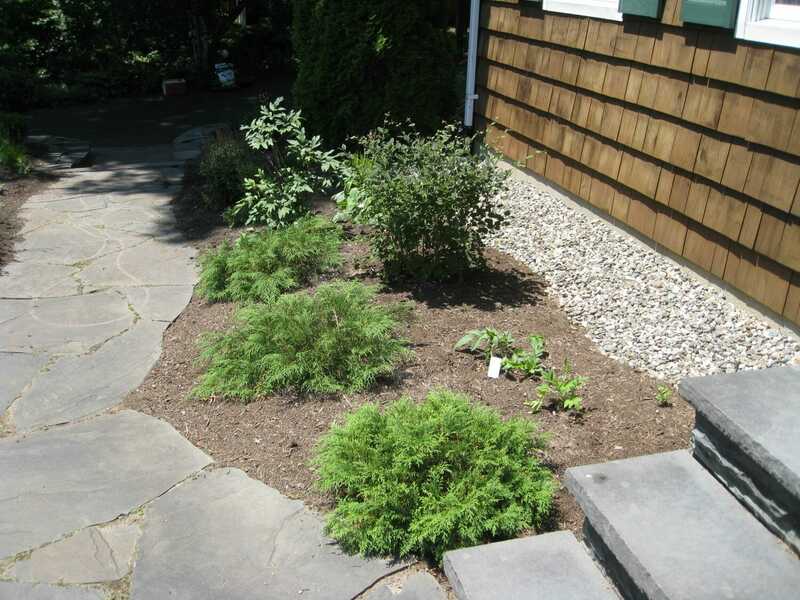 The beds are mulched with compost instead of wood mulch to allow the perennials to spread and cover the ground, This will naturally reduce any weeding and conserve water in the sandy soil. 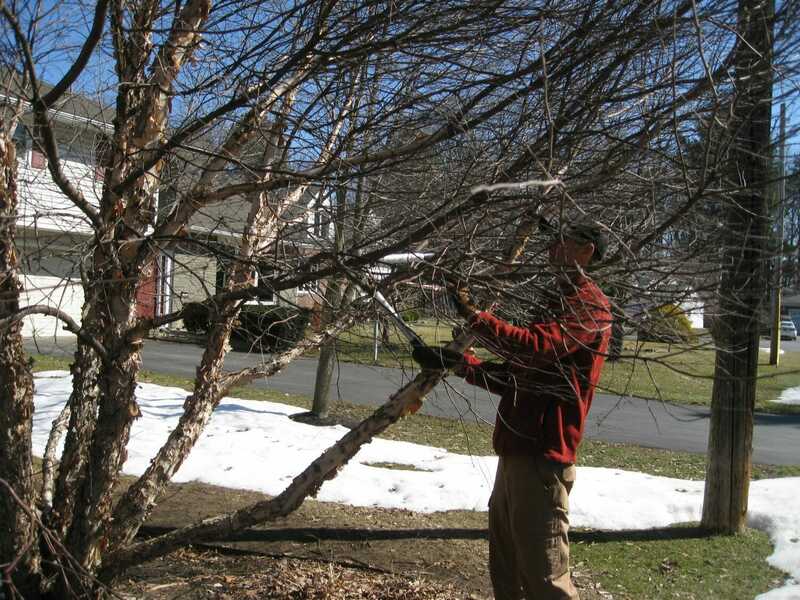 The birch was underplanted with native groundcovers which will bloom early and provide essential food for early emerging bees and other native insects. 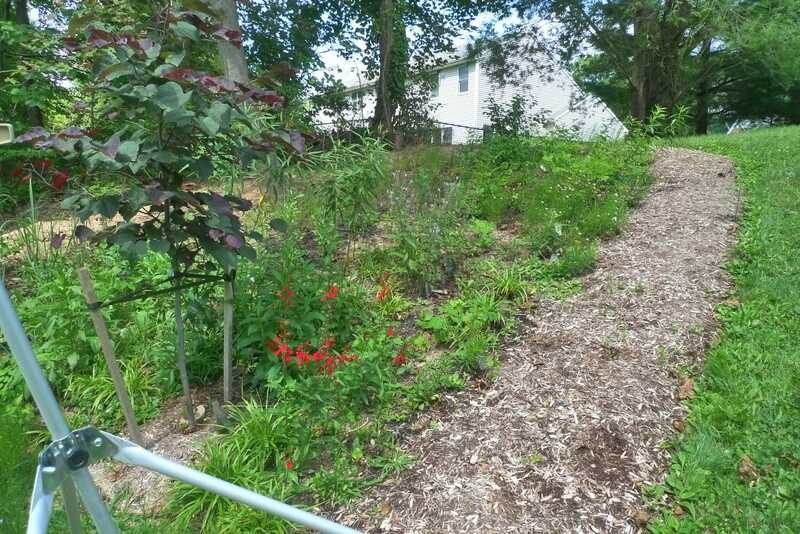 This native garden was planted in May of 2017 at a very steeply sloped back yard, in areas that were not usable for any other use. 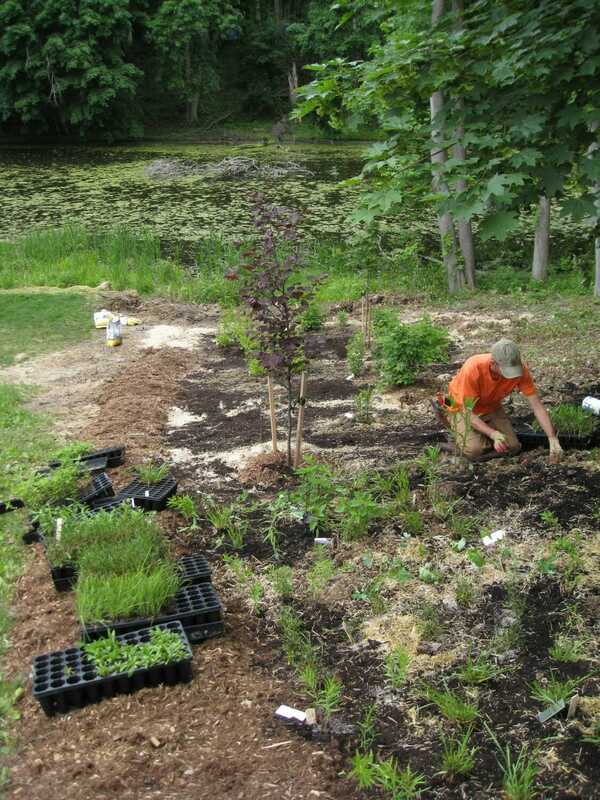 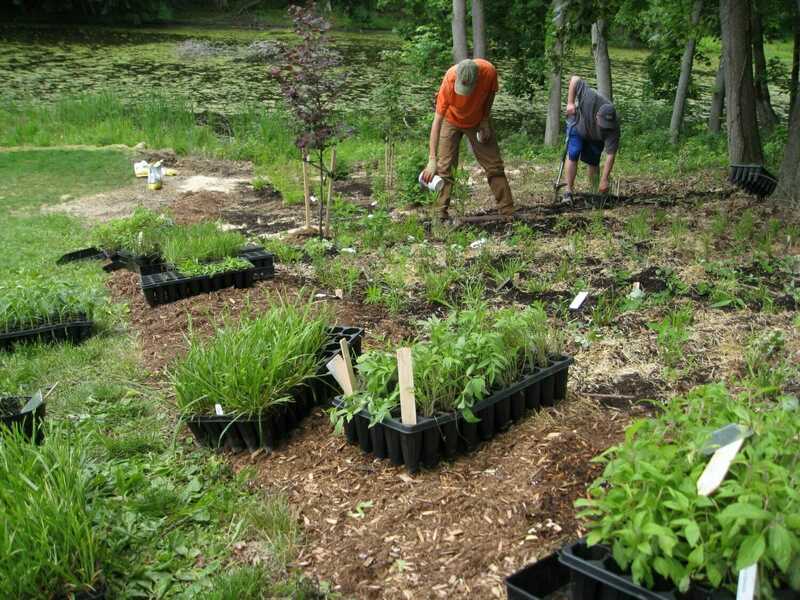 Only native species of trees, shrubs, and perennials were used, with 1500 plugs of native plants not easily available locally installed. 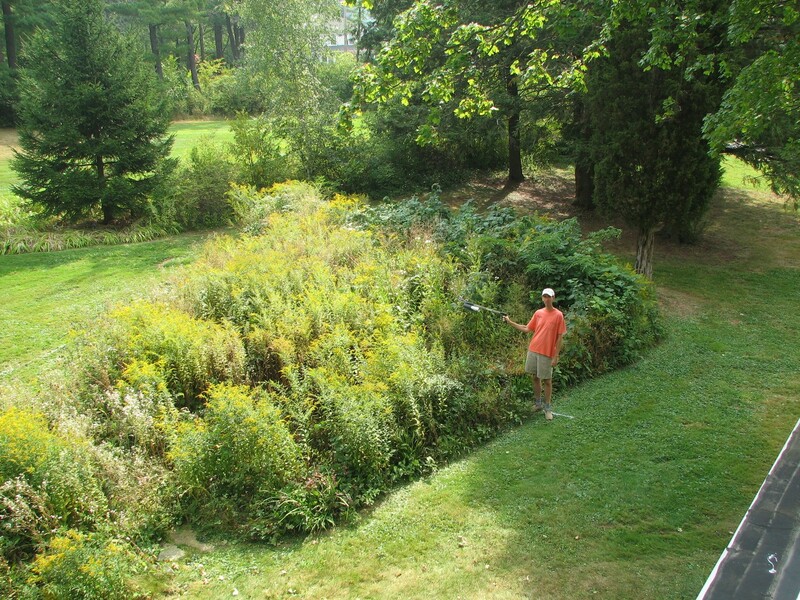 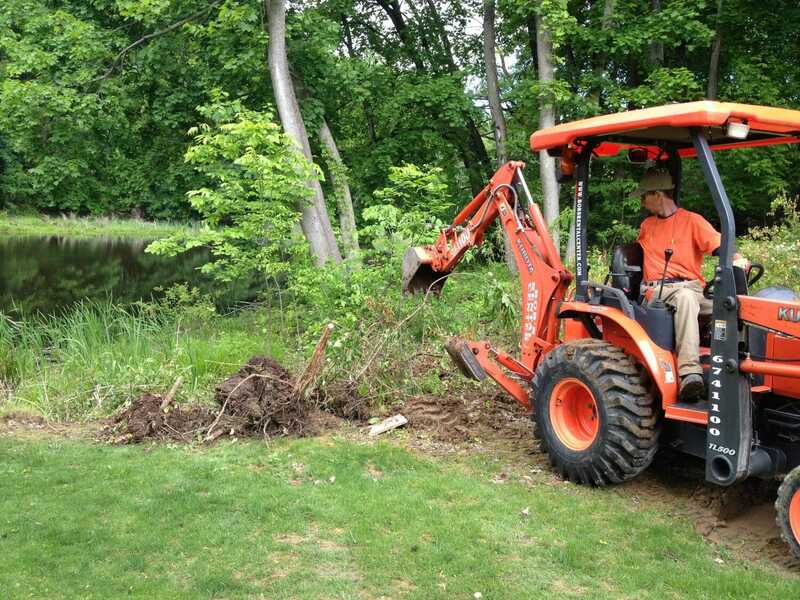 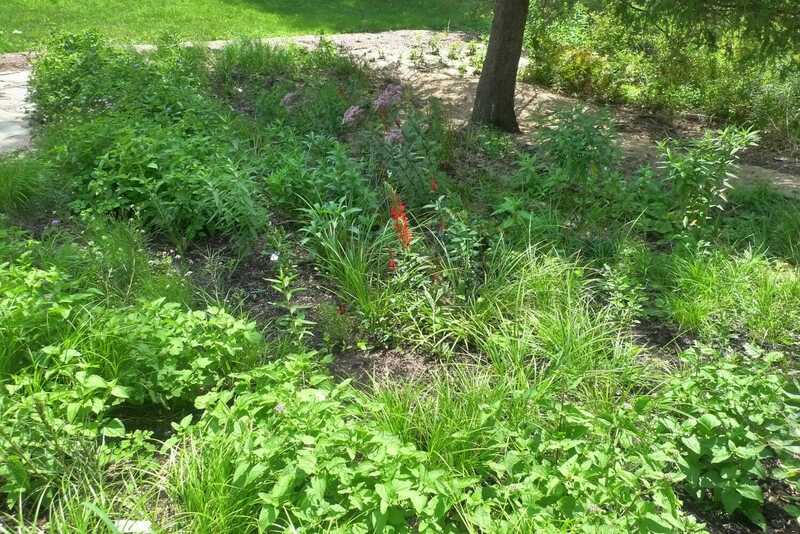 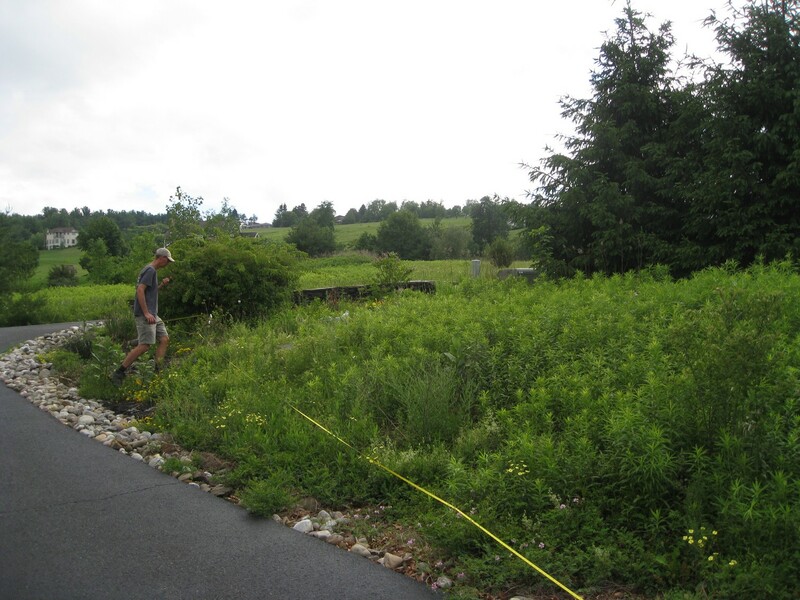 This native garden will mature into a huge pollinator, beneficial insect, bird, and wildlife habitat over several years. 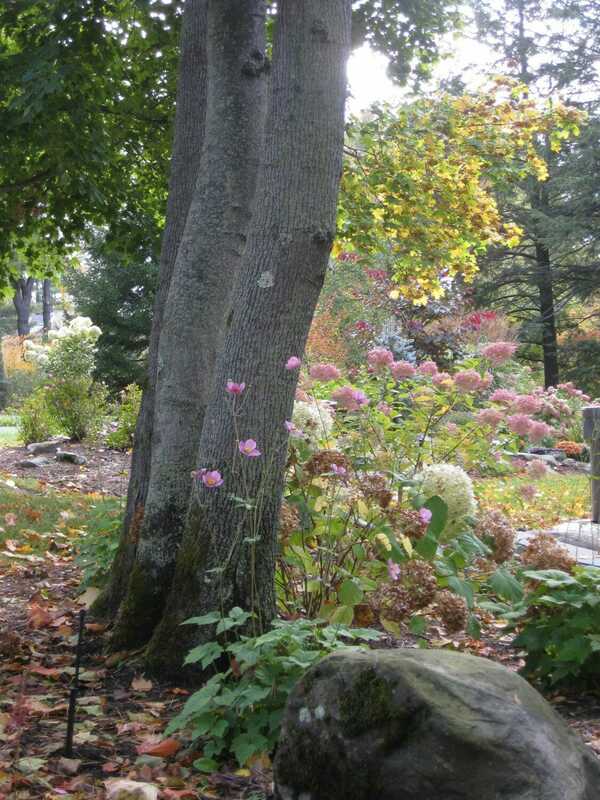 The perennials are left uncut for the Winter to provide overwintering habitat for insects. 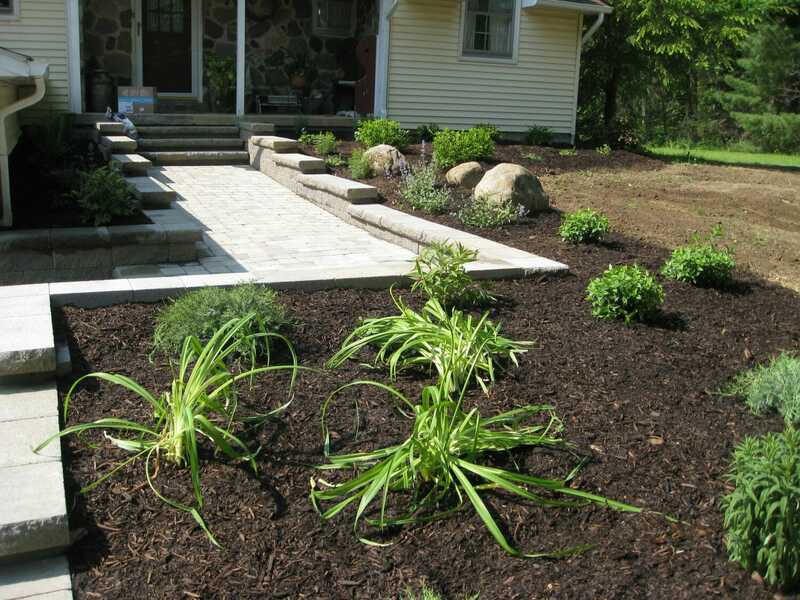 In mid Spring the perennials will be cut and the debris shredded and put back into the garden as a natural mulch which will allow the natural reseeding process and let the plants knit together. 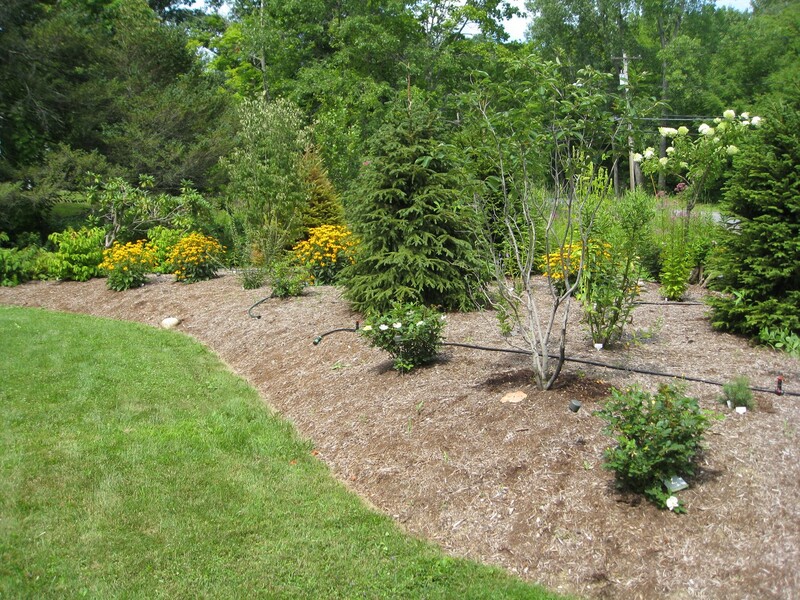 Conventional cedar wood mulch is only used at the edge of the bed as a barrier to keep the non native turf grass out of the bed. 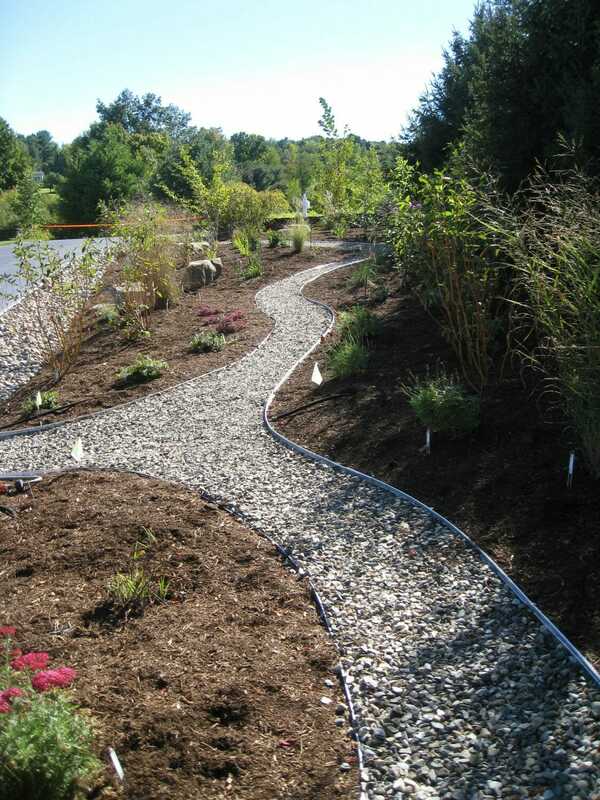 Around the plants compost and shredded straw was used so as not to inhibit perennial spreading. 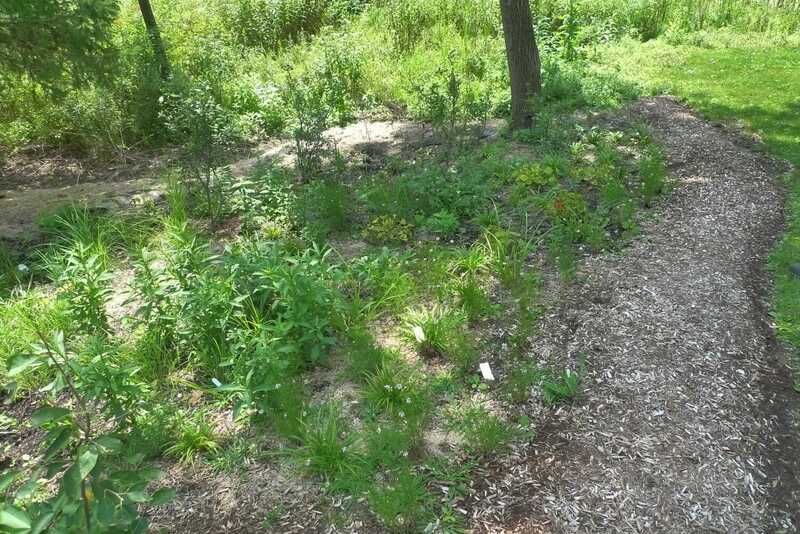 Deer resistant native plants were used as this area has extreme deer browsing problems. 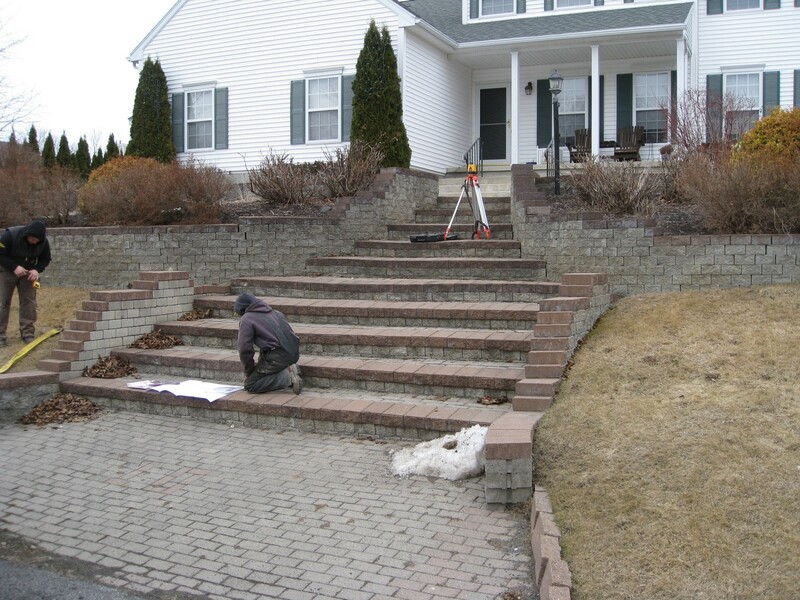 This steeply sloped site in Delmar presented real challenges in both design and construction. 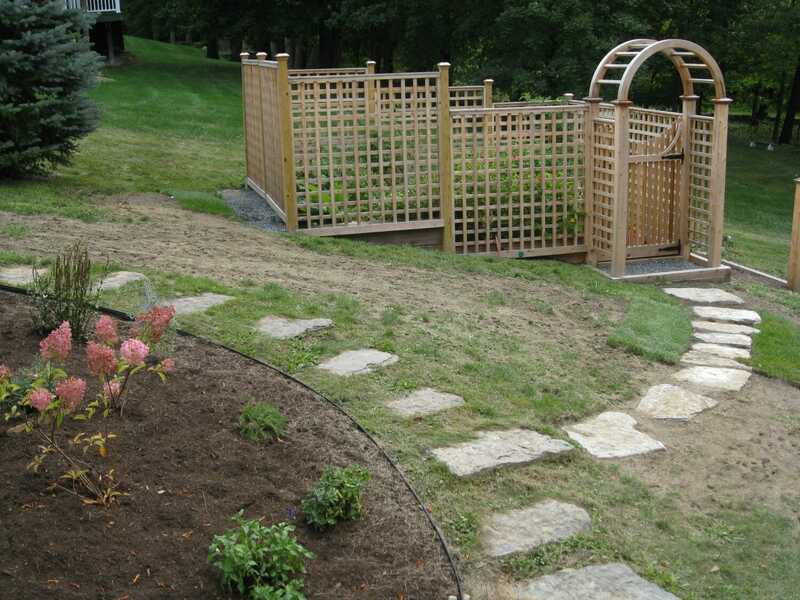 A cedar fenced vegetable garden was set into the hill to provide both a source of fresh produce and a tiny retreat for Mom and daughters. 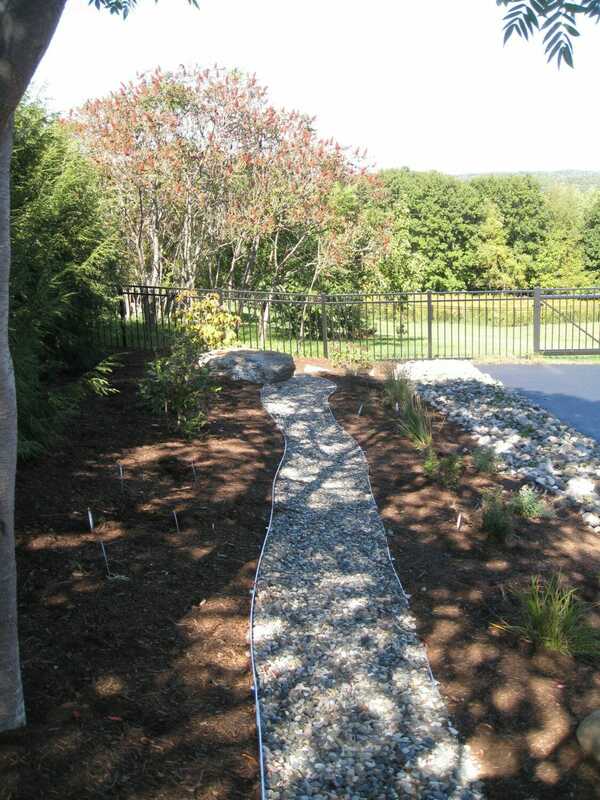 A massive drainage system protects the garden from damage and settlement. 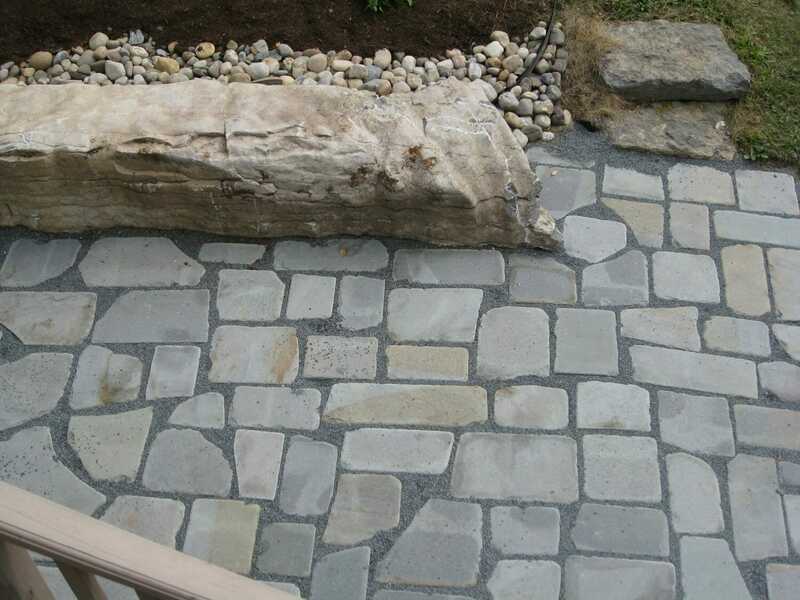 A rustic permeable patio with a 15 ton limestone sitting rock and a surface of tumbled bluestone catches and removes water that was infiltrating the home and provides a gathering spot for the family. 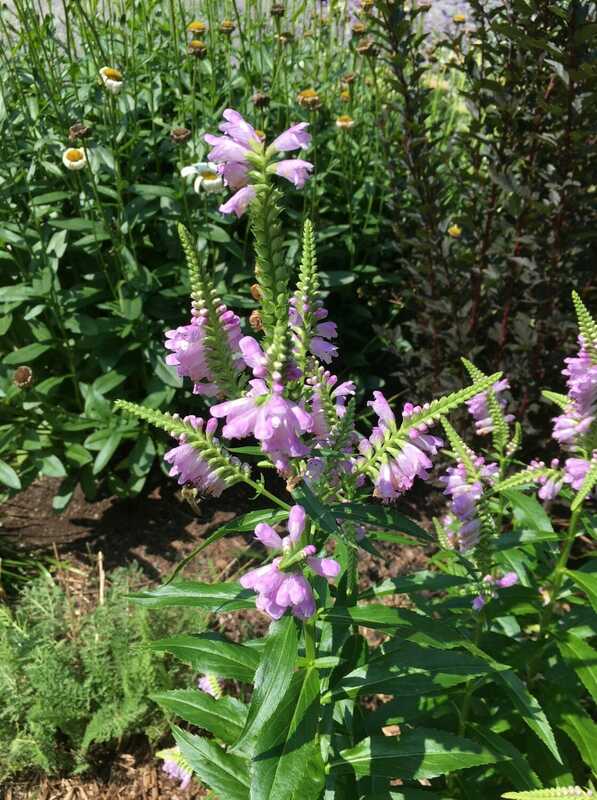 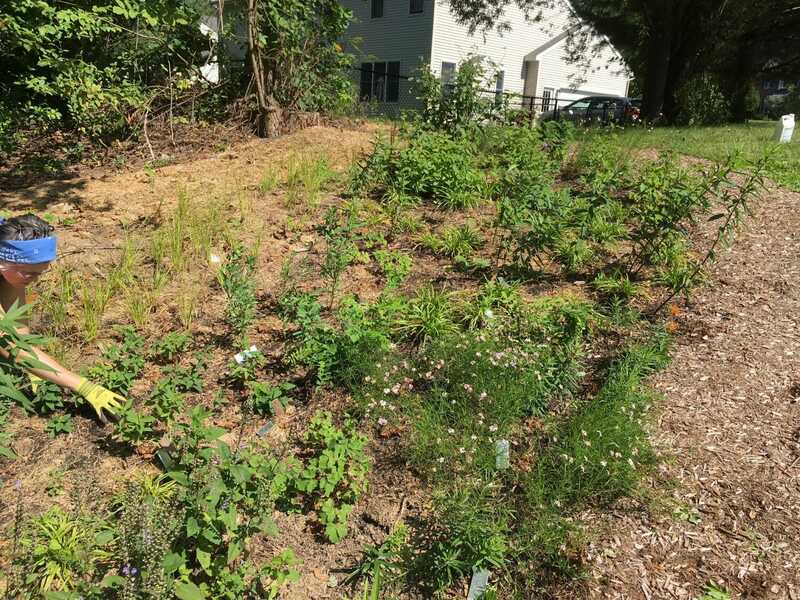 Deer resistant and native plants were used to bring pollinators, butterflies, and beneficial insects into the yard's ecosystem and protect the fragile "Circle of Life". 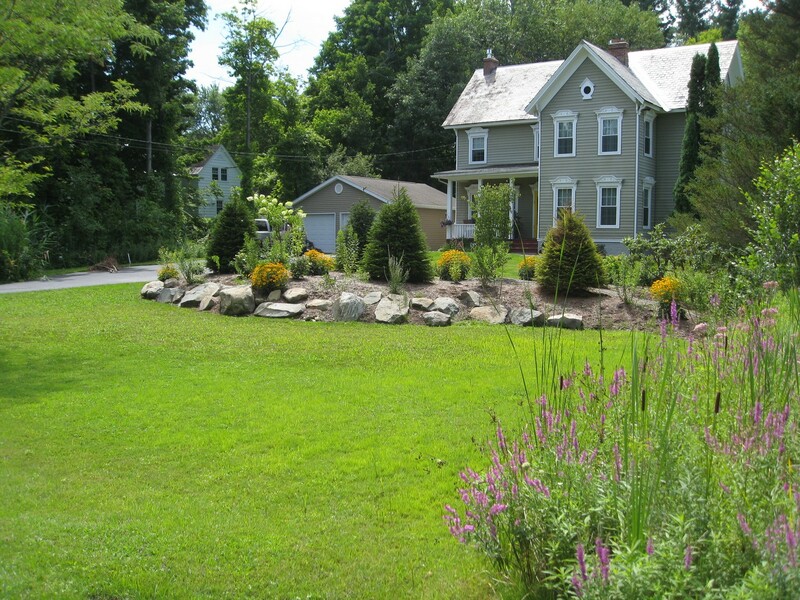 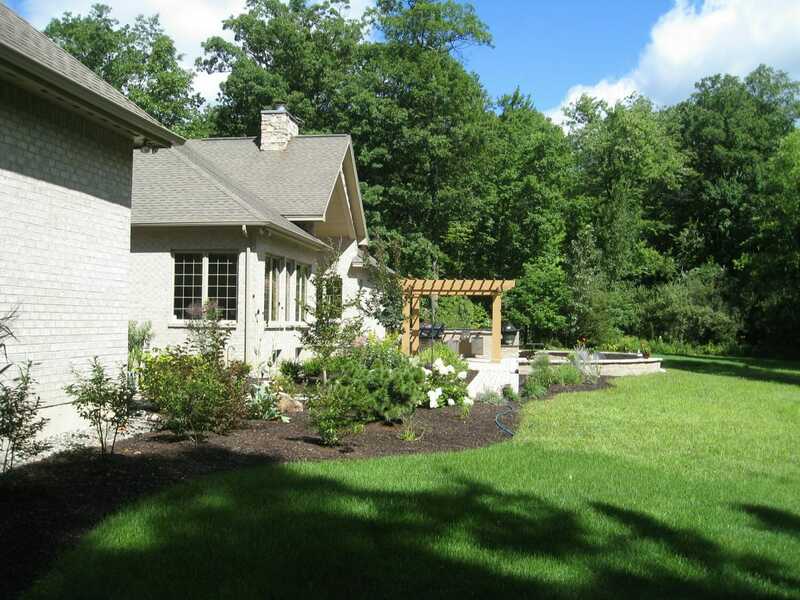 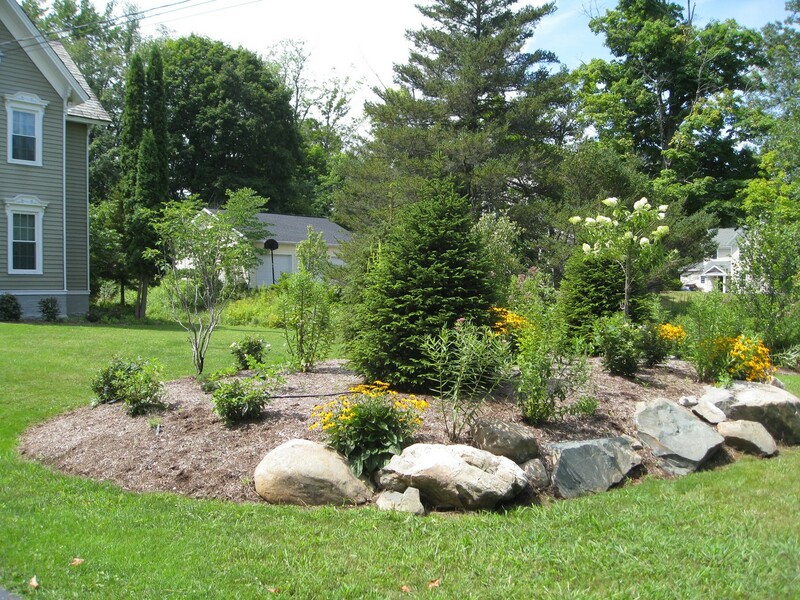 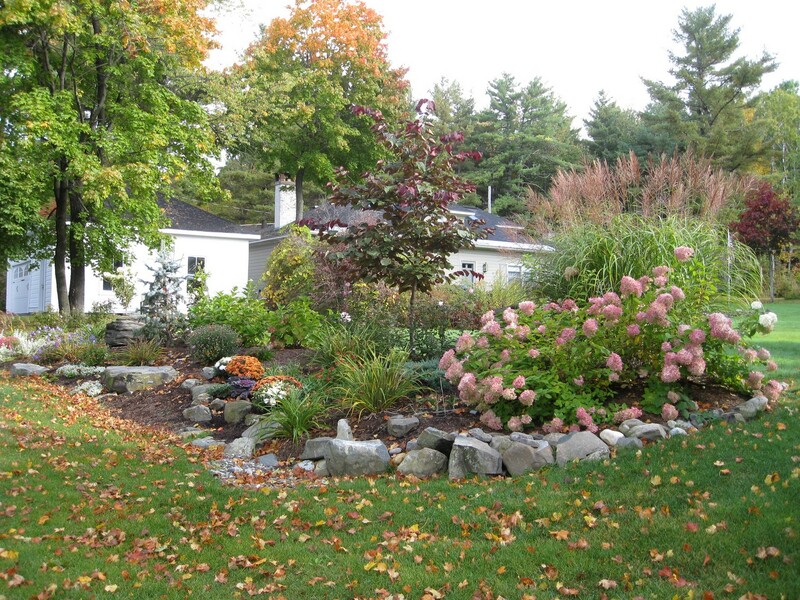 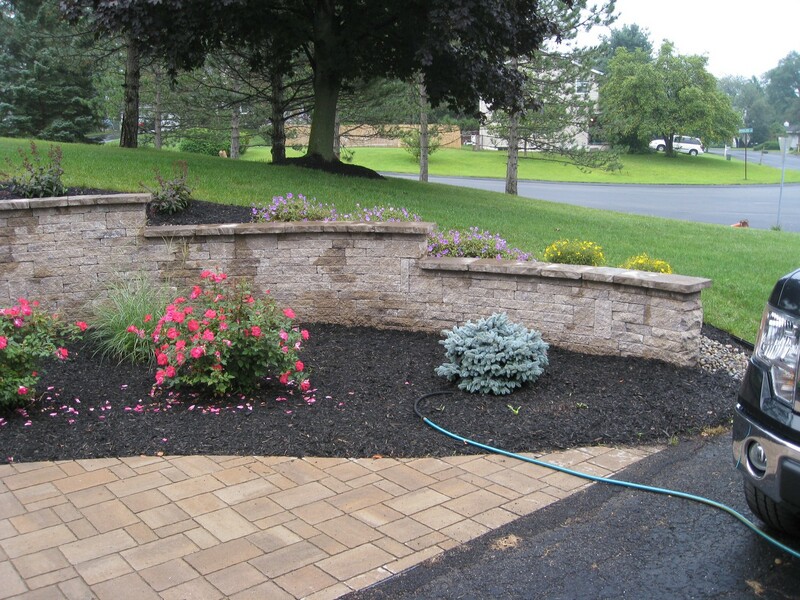 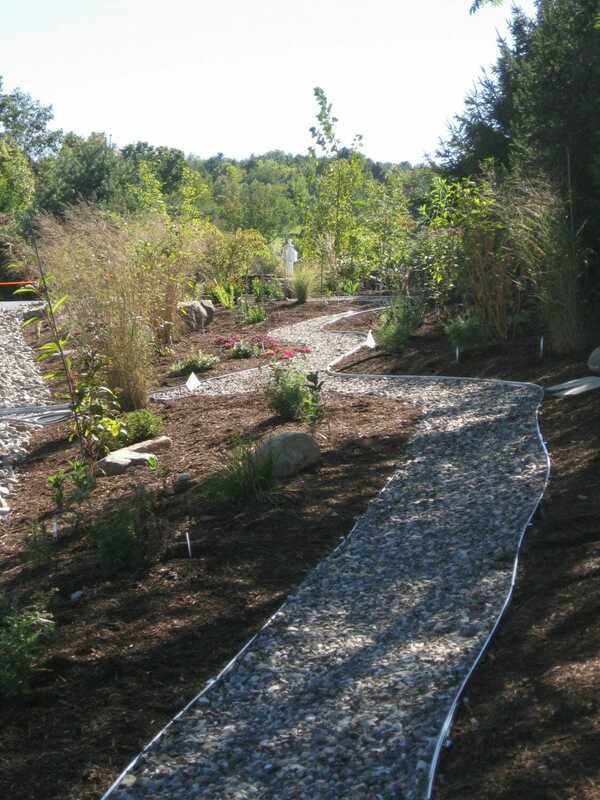 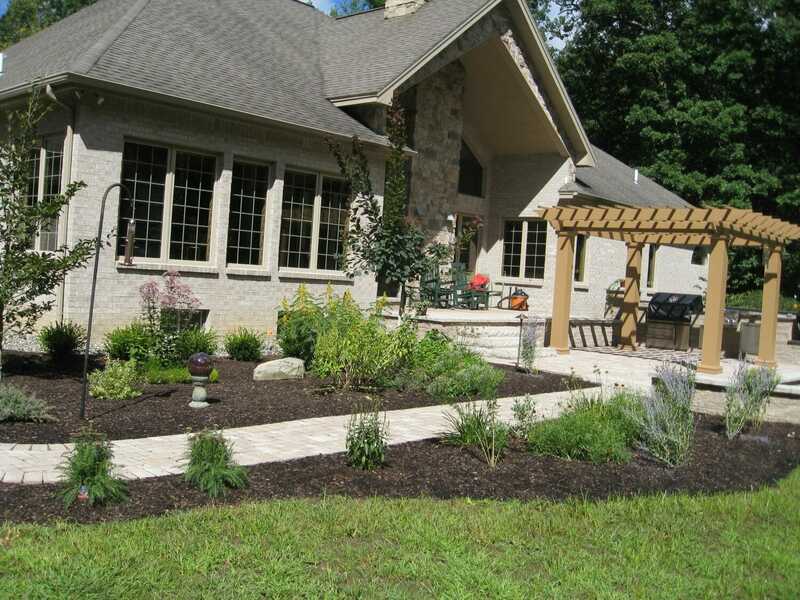 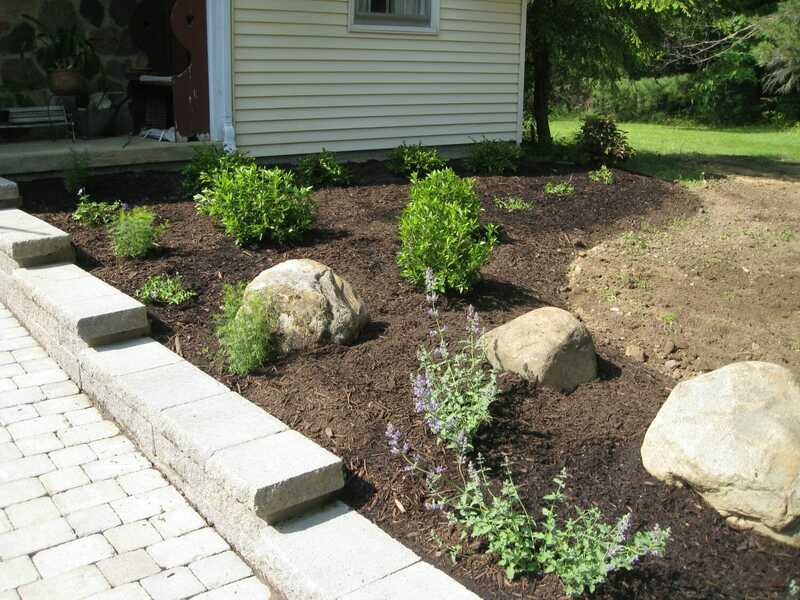 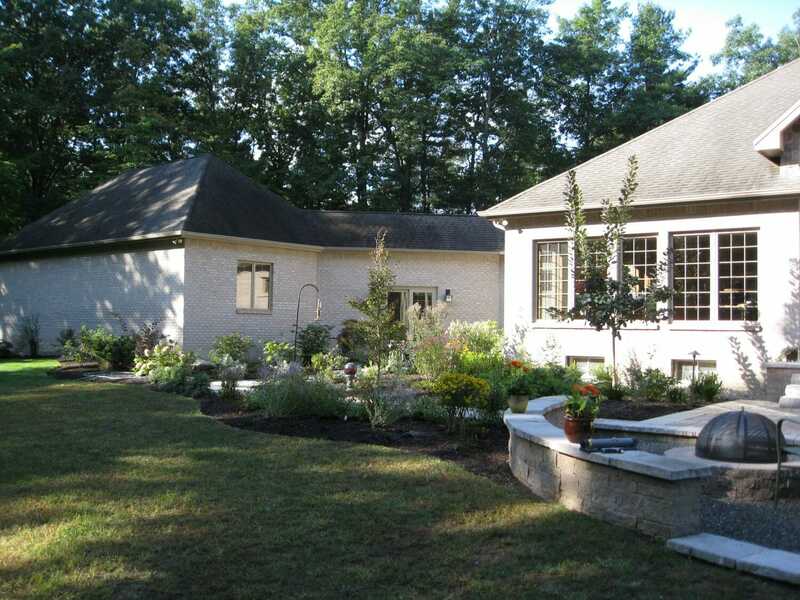 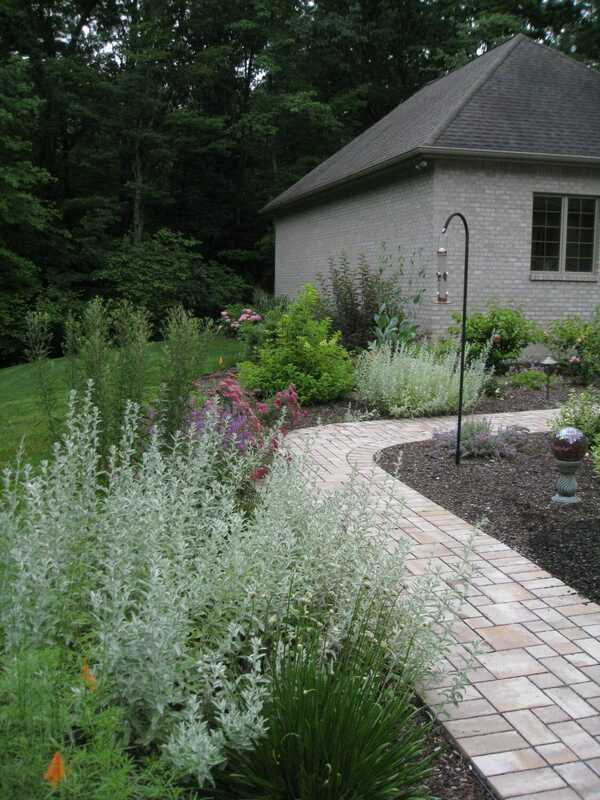 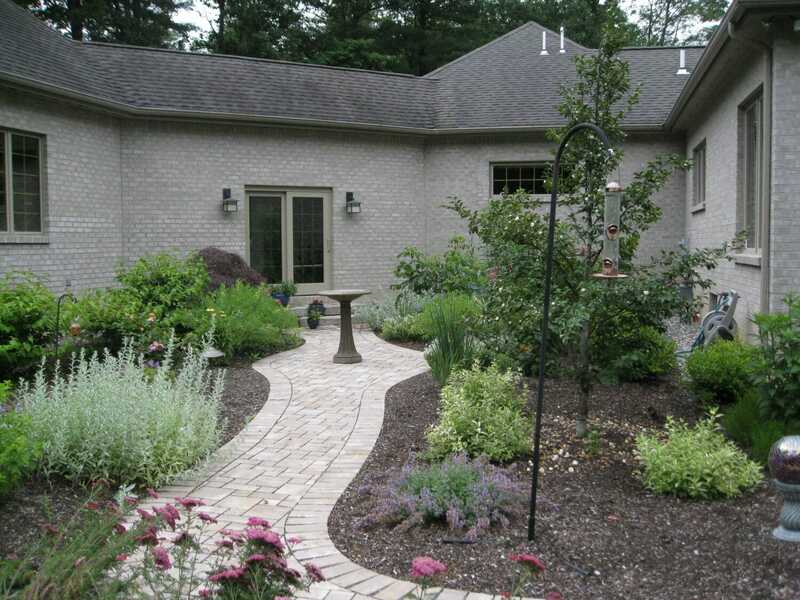 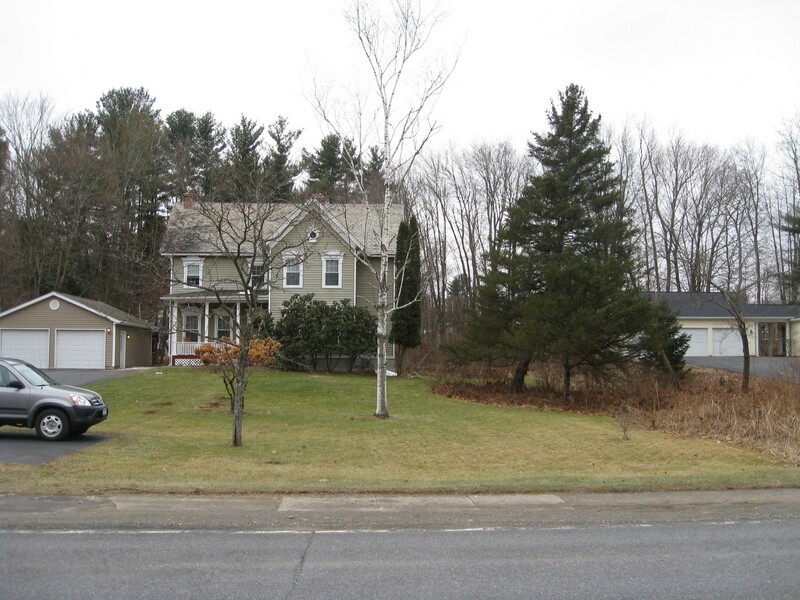 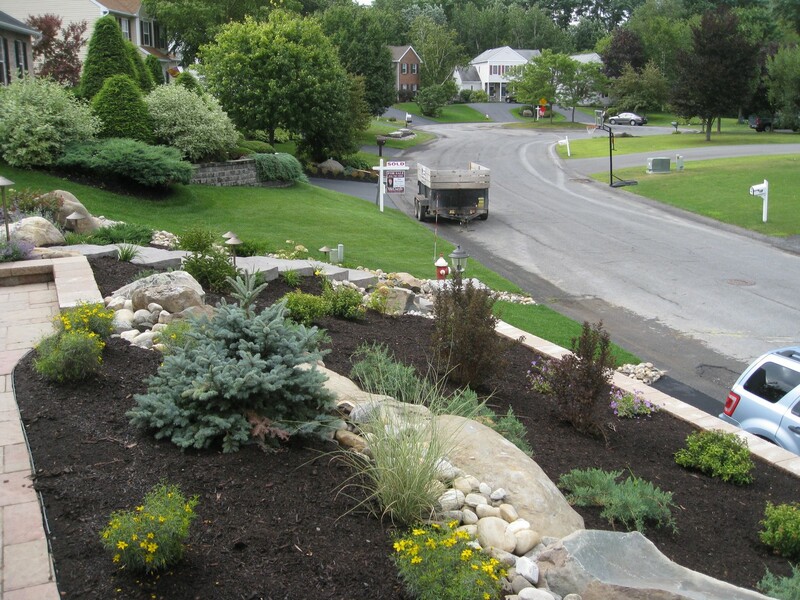 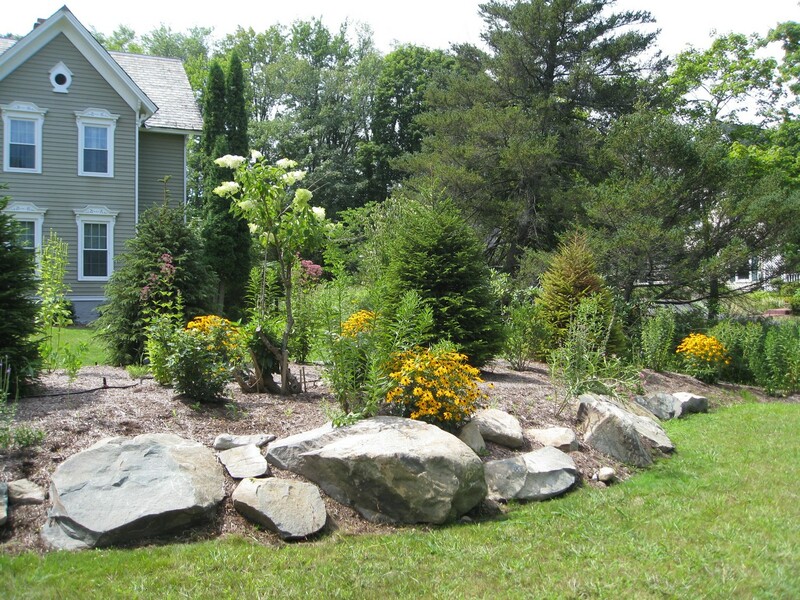 This planting design was done in an extended plant flagging consultation in Burnt Hills, Saratoga County, NY. 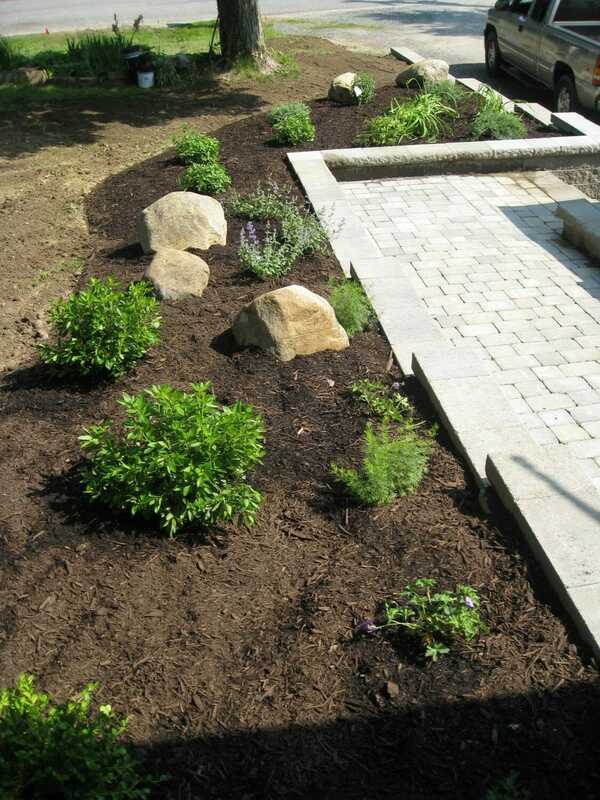 The client wanted a great deal of color and wished to incorporate low maintenance, native pollinator friendly plants. 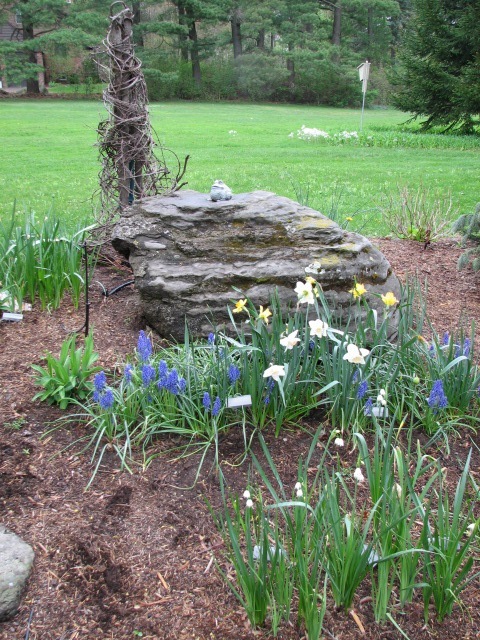 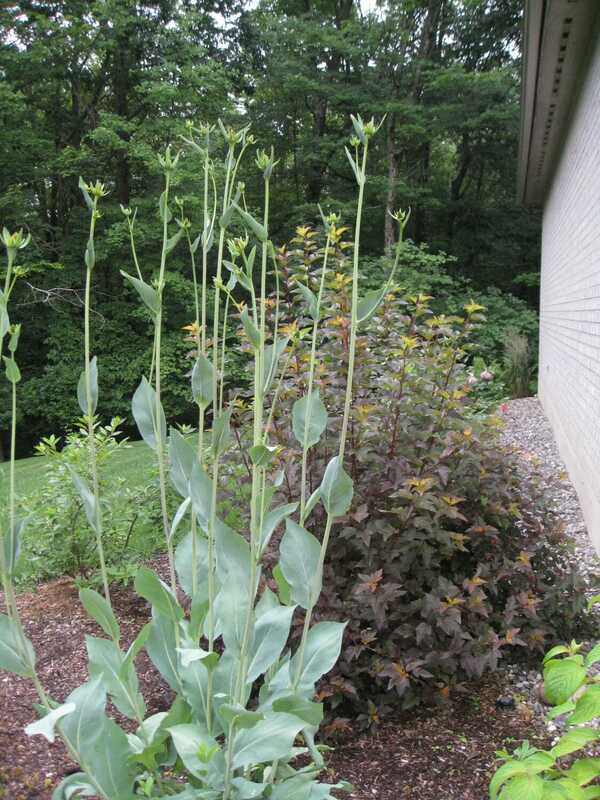 Susie also had cherished perennials she wished to reuse so we divided her existing plants and used them with the new. 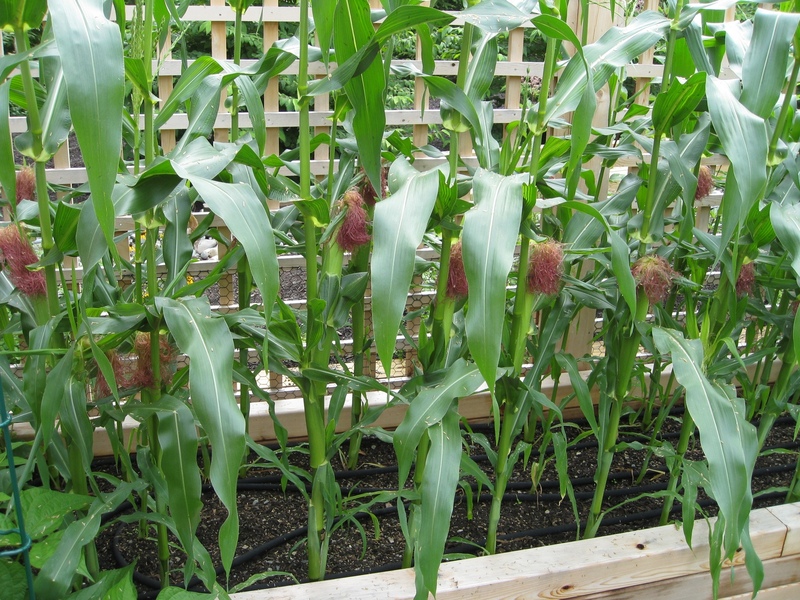 Of course all plants received a mycorrizhal fertilizer to help them establish easily and soaker hoses provided a low tech but efficient drip watering system. 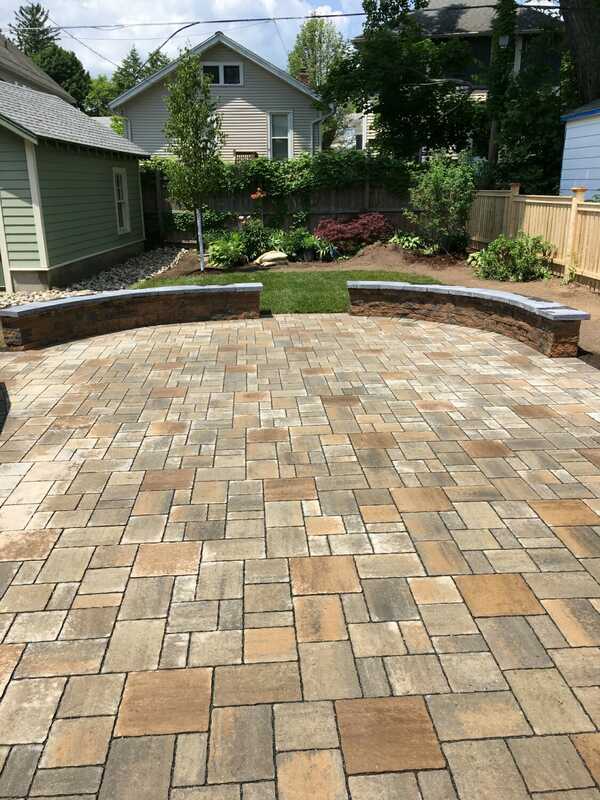 This is a great example of how a 3 hour consultation was able to transform the front yard into a welcoming courtyard while still being low maintenance. 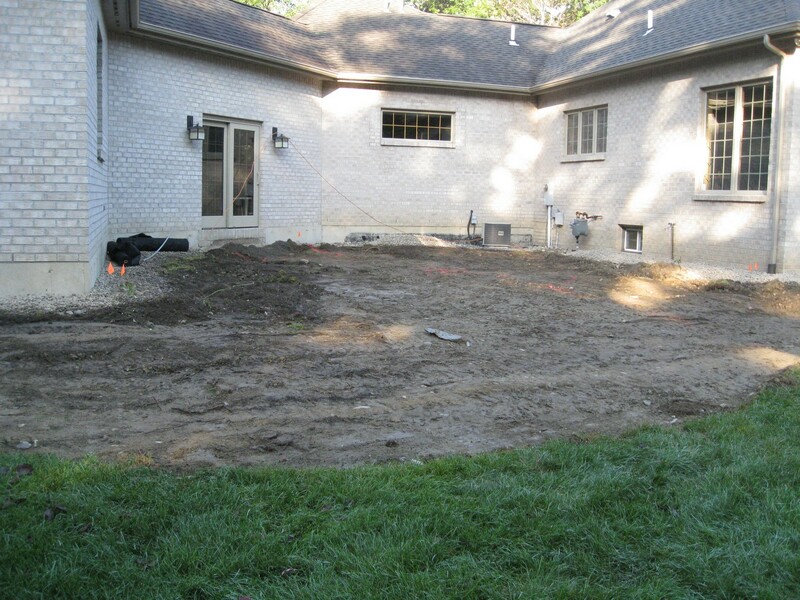 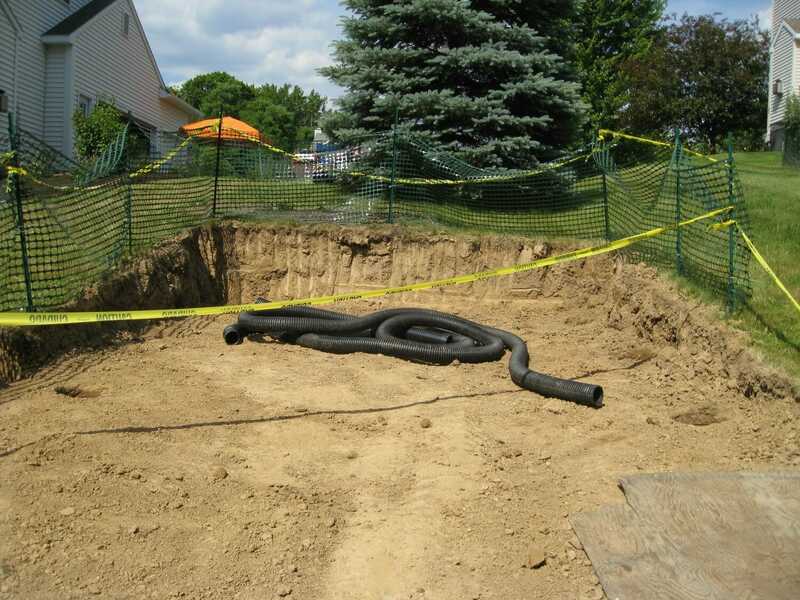 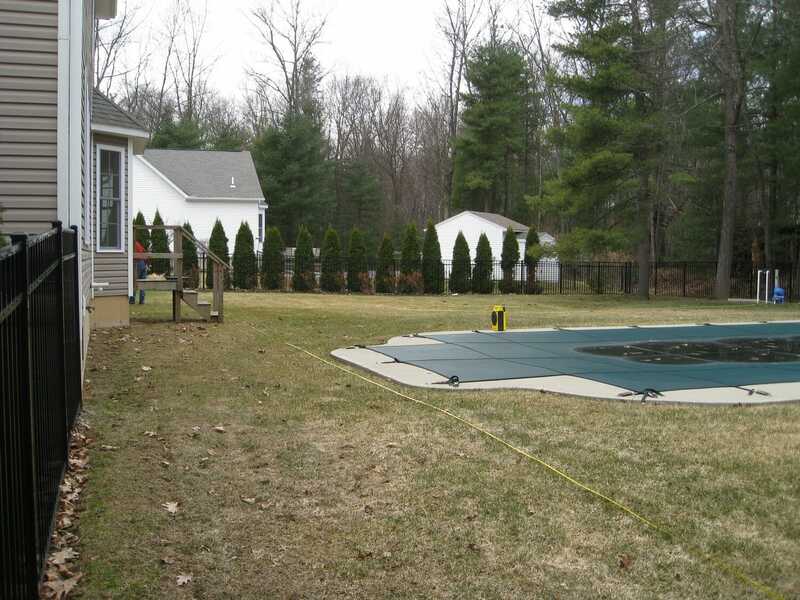 This renovation project for a pool landscape plan was unusual; the clients purchased the property, tore down the existing house, but left the existing pool since it was so well built. 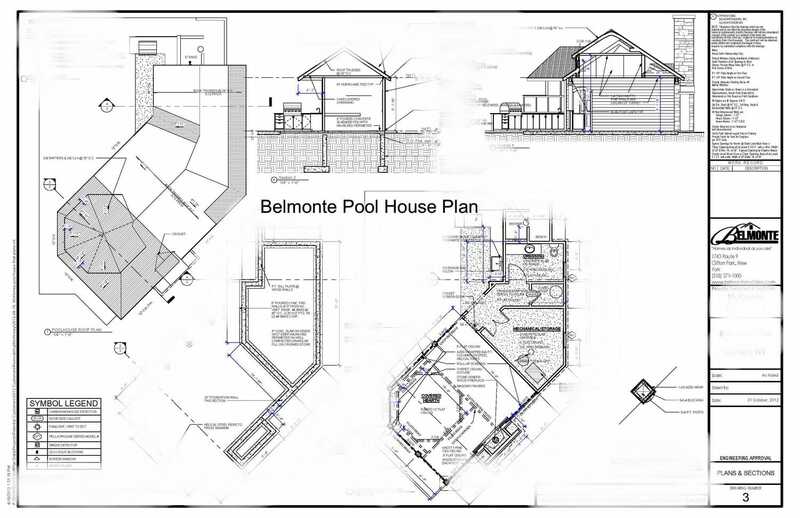 The pool was the focus of the family's activities with 4 young children and a poolhouse, designed by Belmonte Builders, was under way. 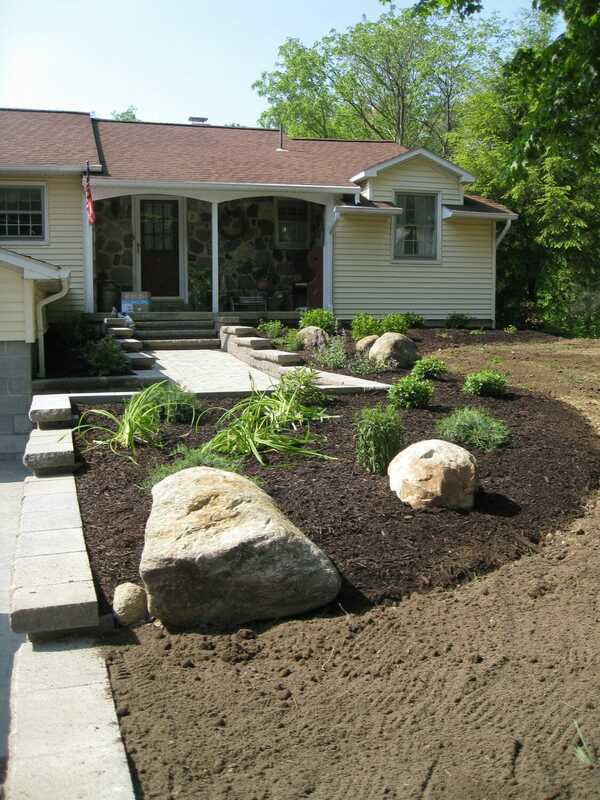 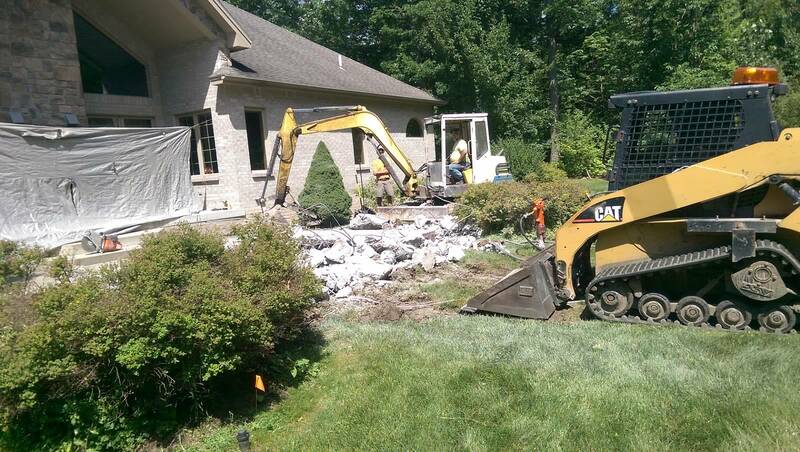 Brennan Landscaping referred us to the clients for design and Tim Brennan did the installation. 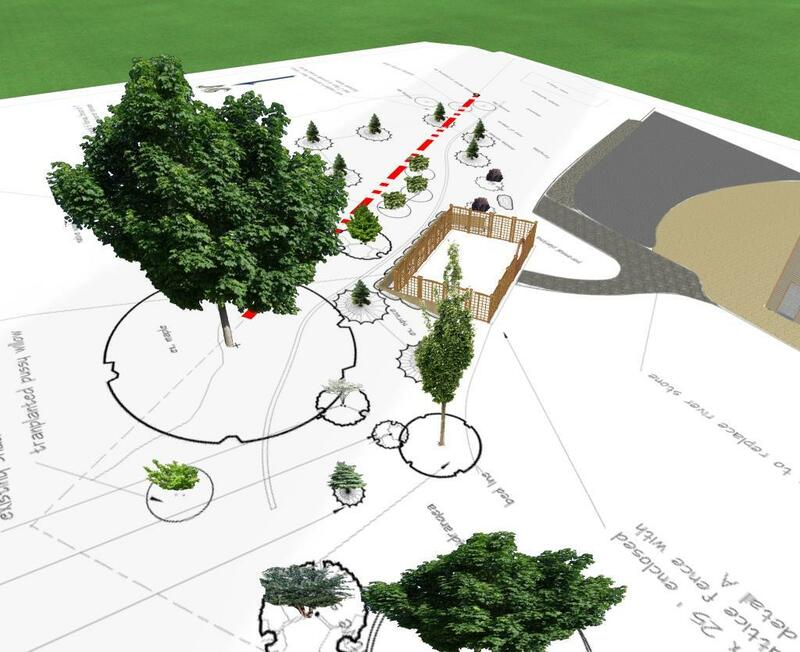 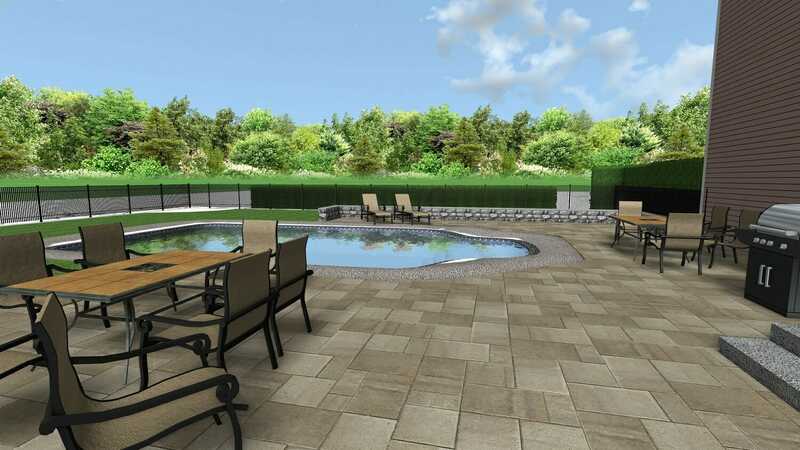 On this project's wish list were a large water feature and a synthetic turf putting green. 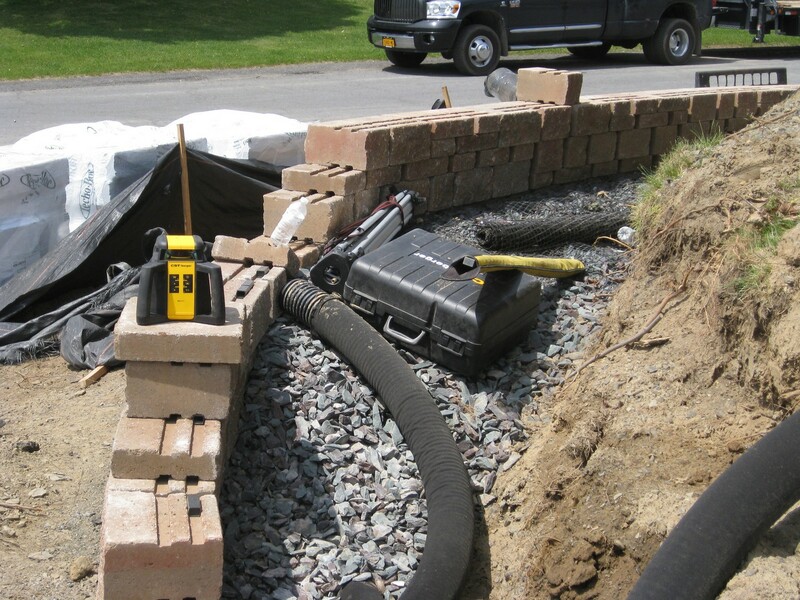 Multiple concepts were developed and refined before installation. 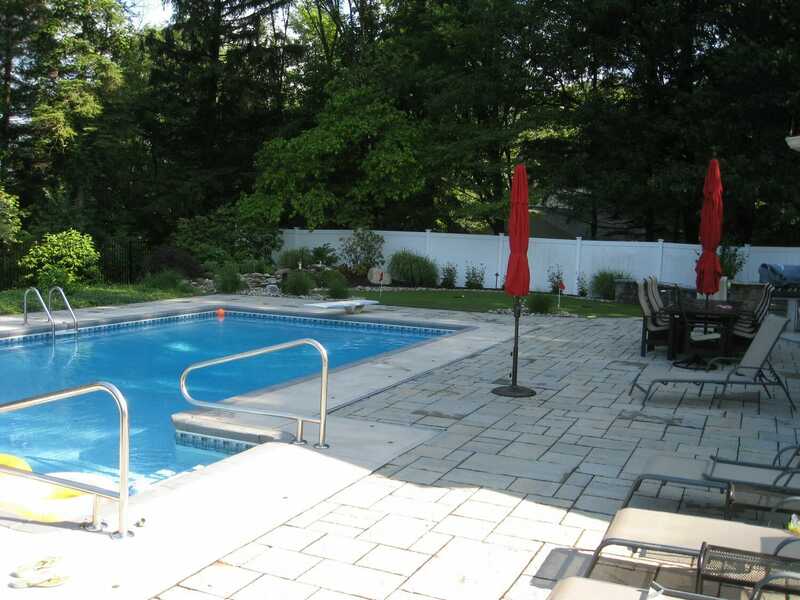 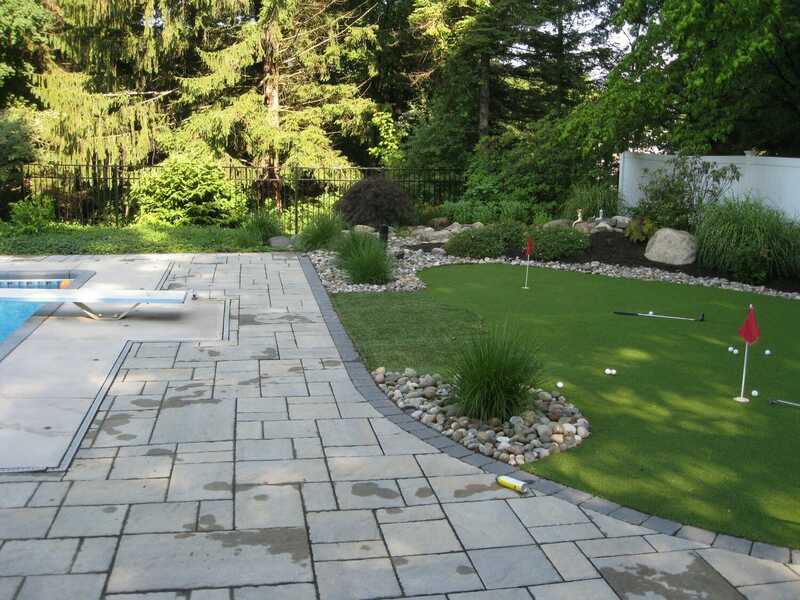 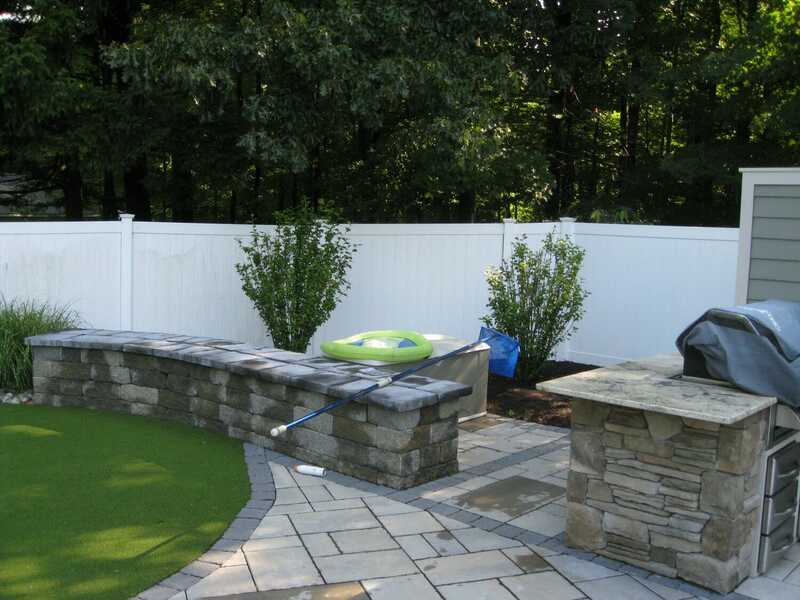 The landscape design refreshed the pool area and created a true outdoor room for the Albany County family. 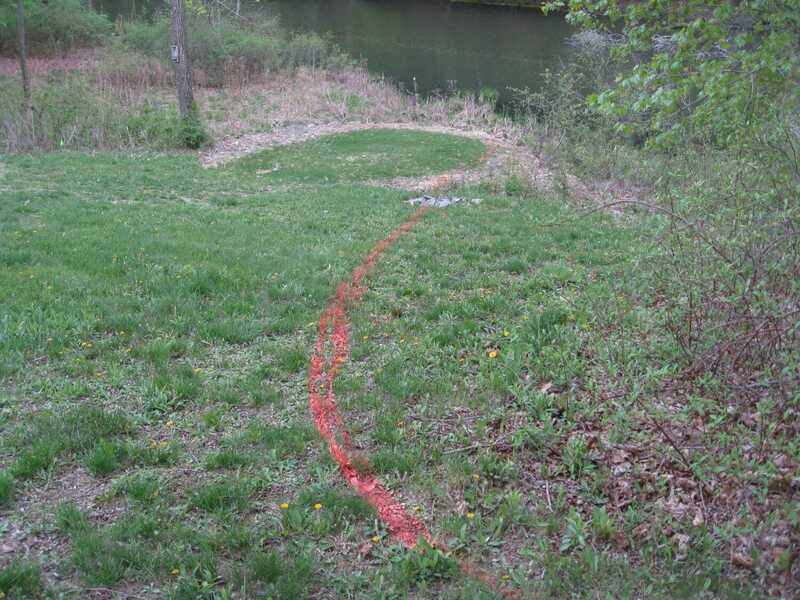 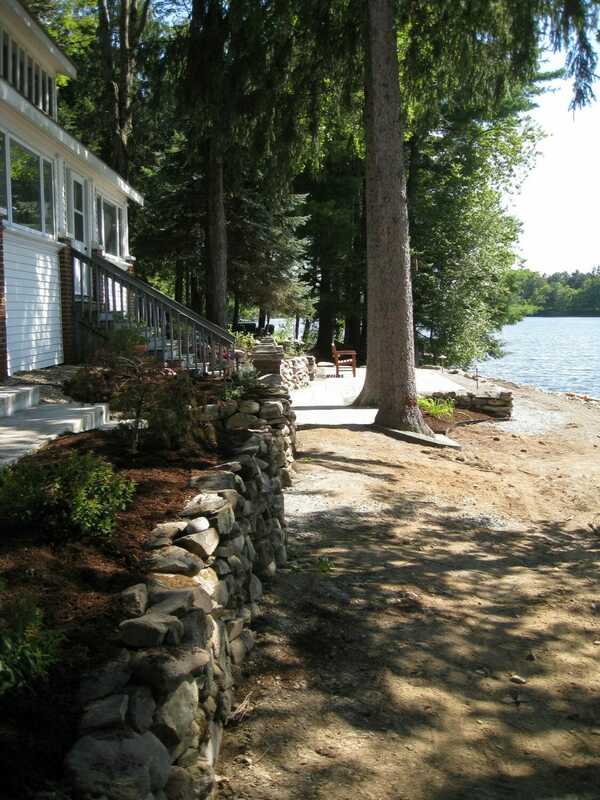 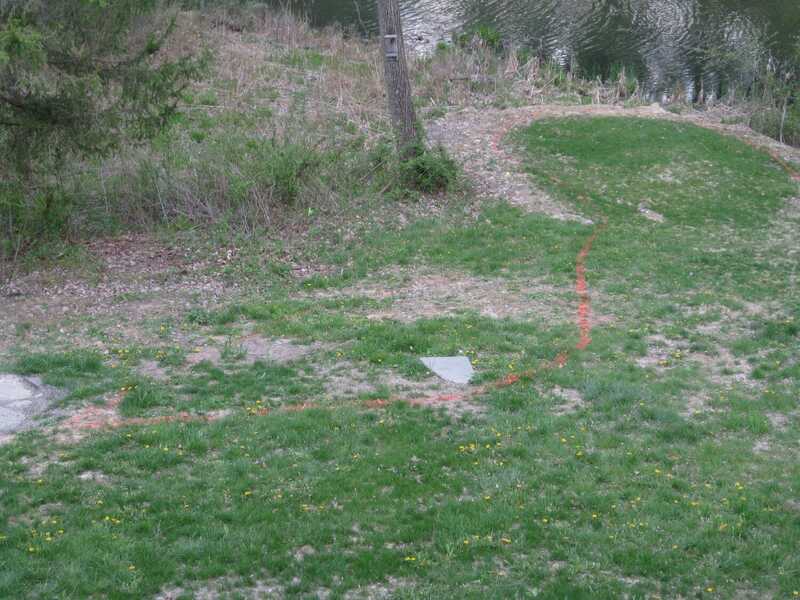 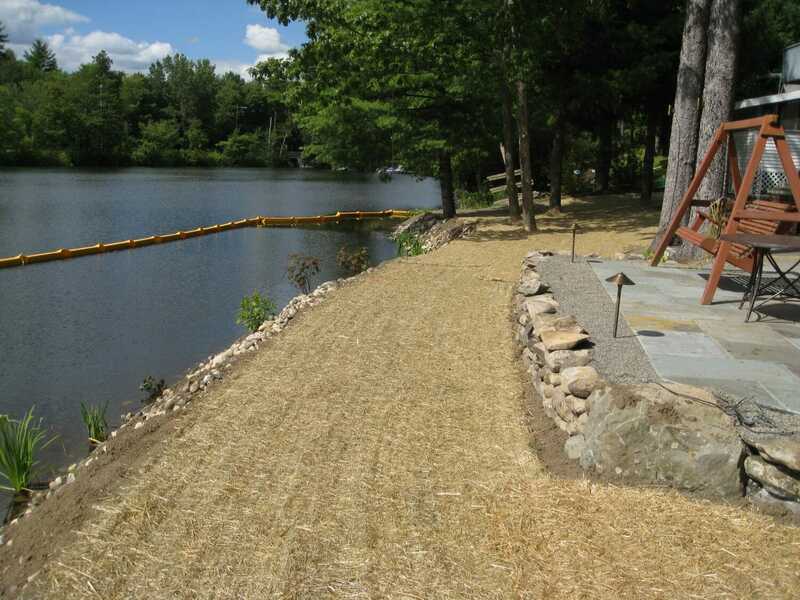 I consider this landscape project we did at Burden Lake in Averill Park, NY to be a back yard project, even though the back yard is the lake’s front. 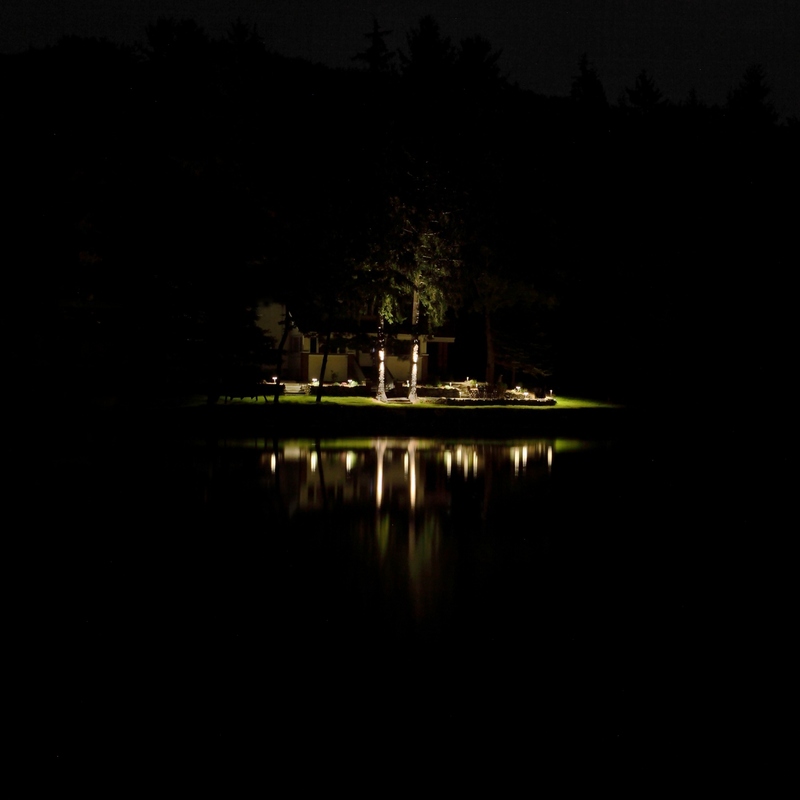 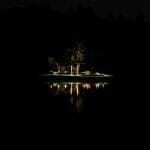 Here we are dealing with enhancing the usability of the yard and being able to enjoy the lake, day and night. 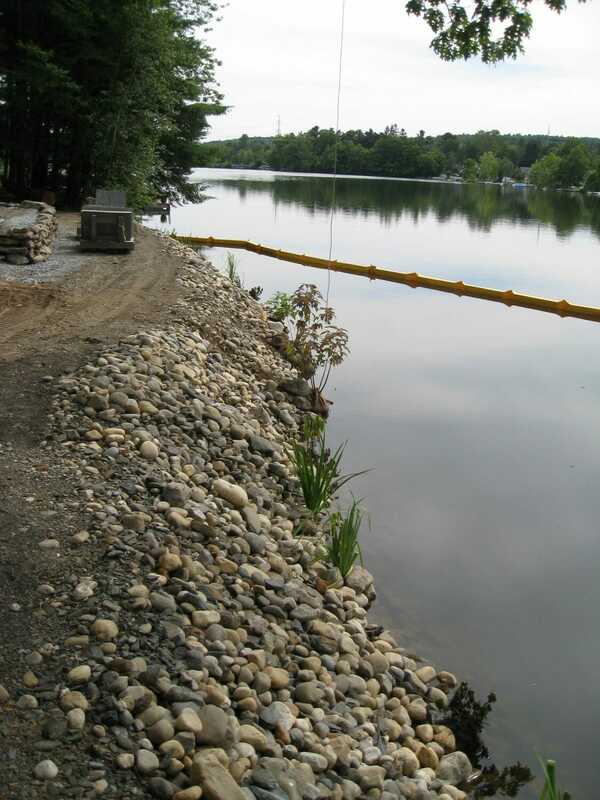 This major project was started by our excavating contractor; the shore line was reinforced and extended. 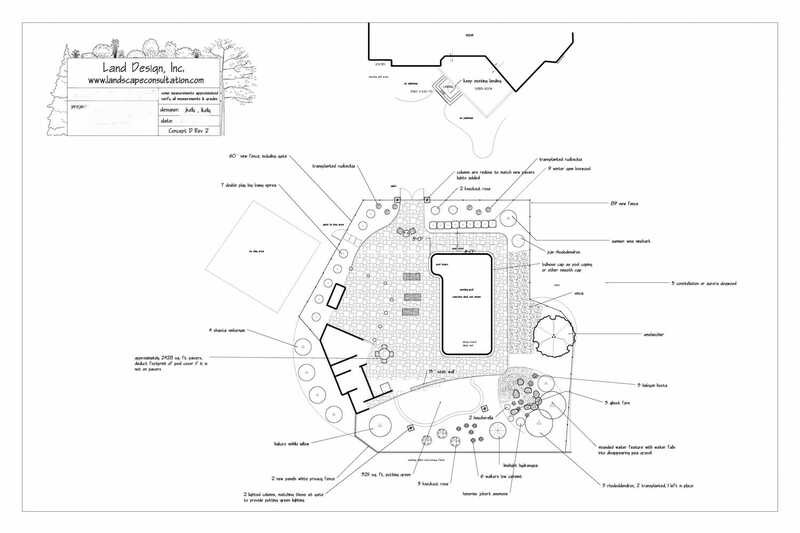 It soon became clear that a master landscape plan of the site was needed and we were called in to design and help implement the plan. 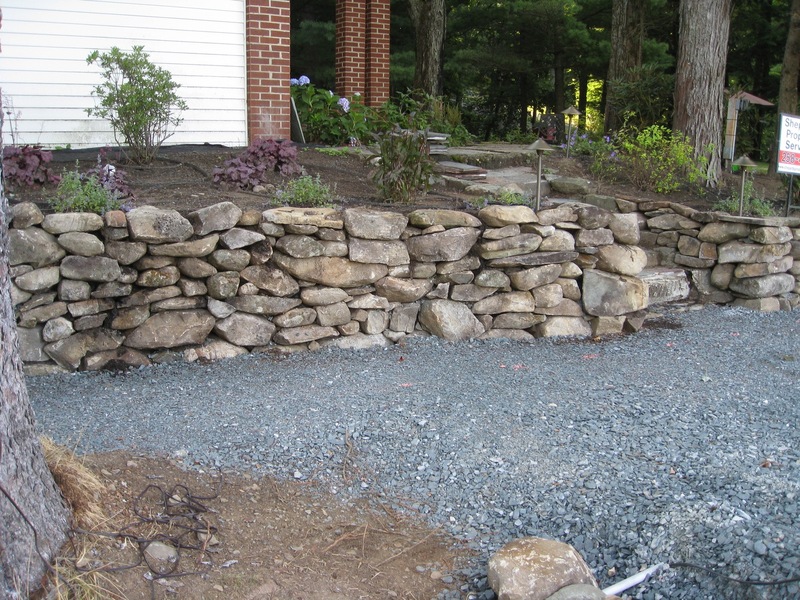 Reclaimed farm rock walls were used in order to keep with the rustic theme of the site. 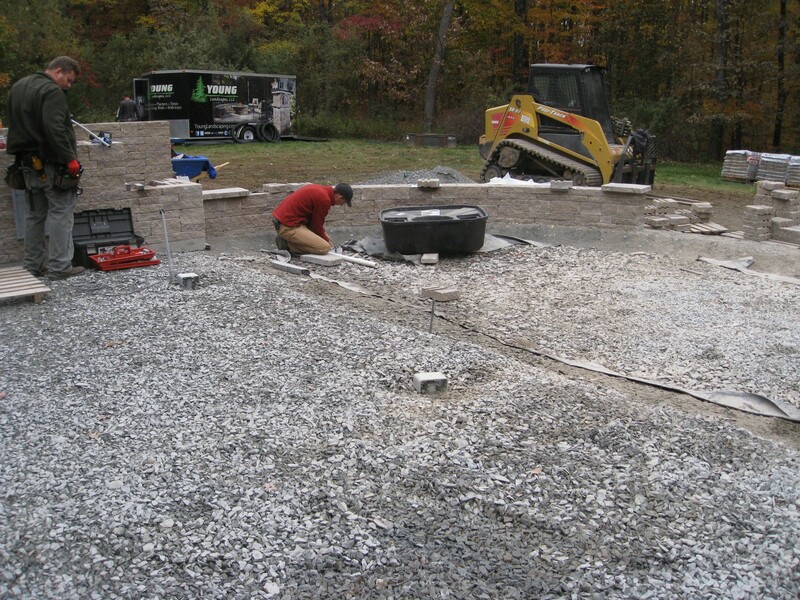 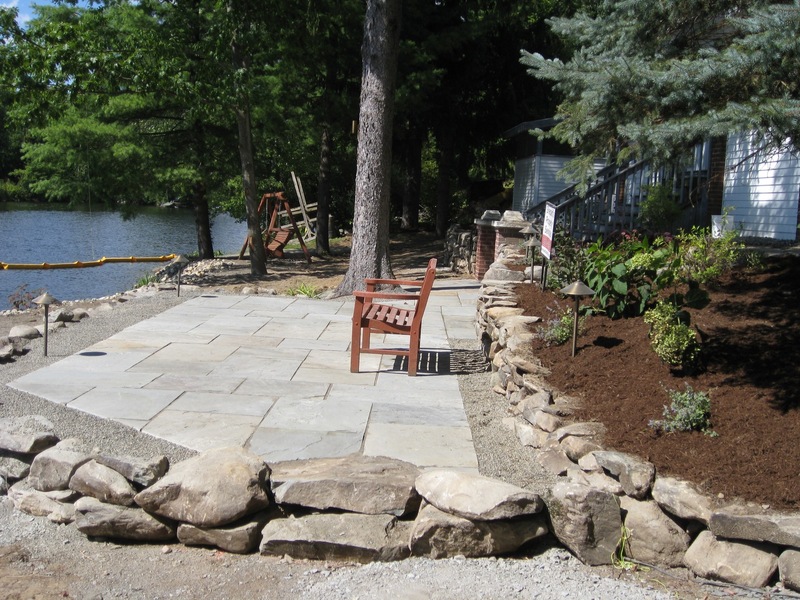 A rough hewn bluestone patio was installed to provide a level seating area to enjoy the lake views. 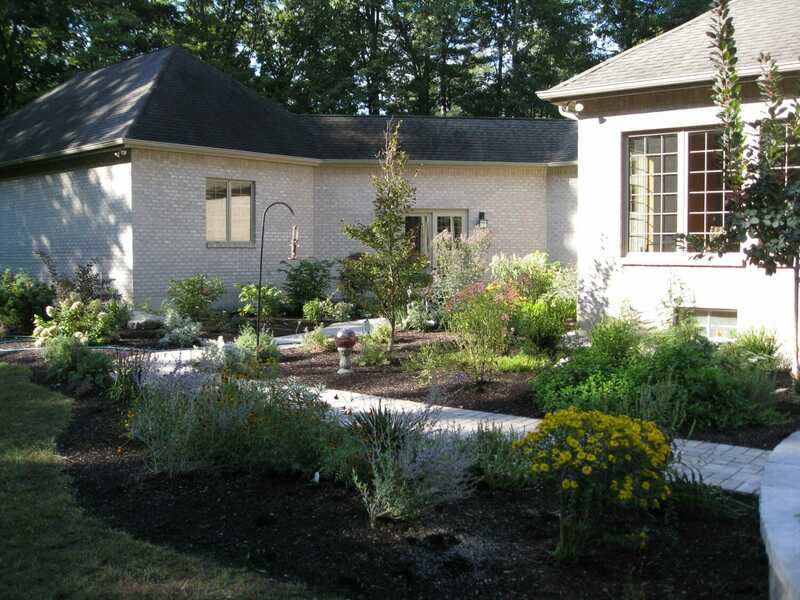 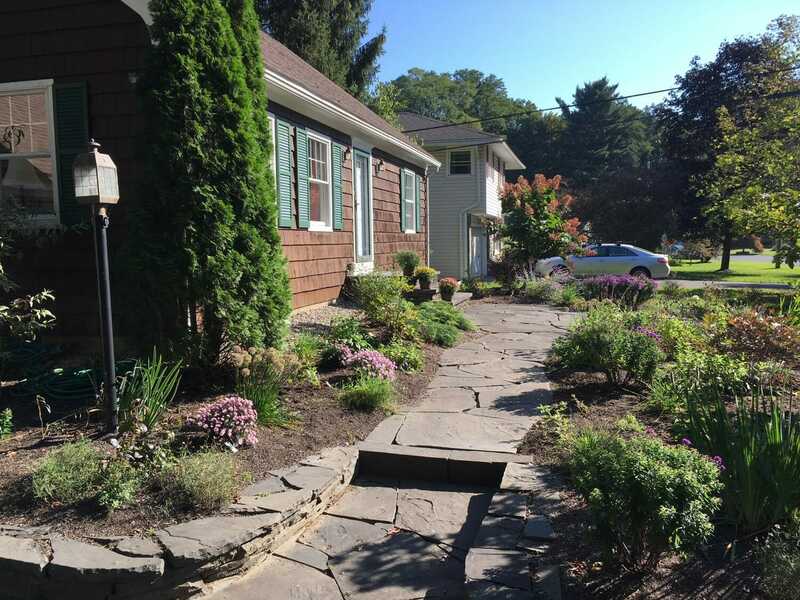 The inappropriate formal plantings were removed and a naturalistic blend of deer resistant perennials and shrubs were installed. 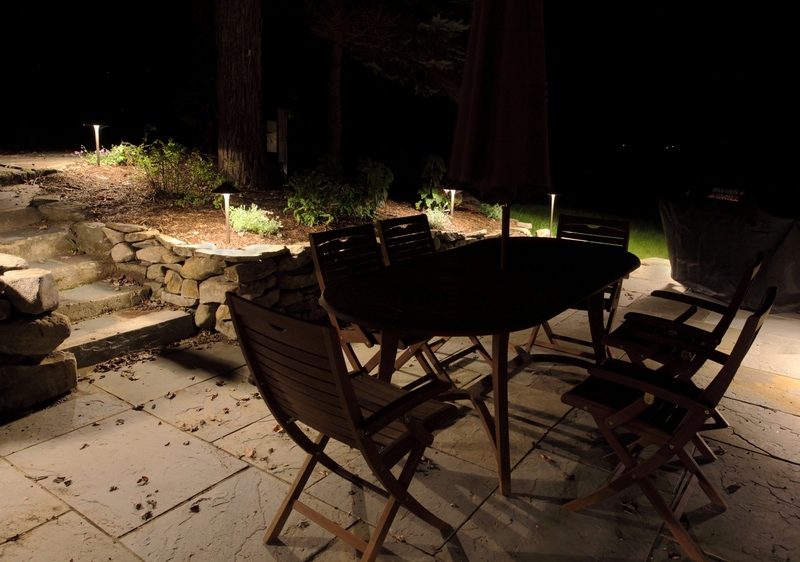 An energy efficient LED landscape lighting system allows the clients to enjoy the patio area at night but the light levels are calculated to keep the setting very informal and comfortable. 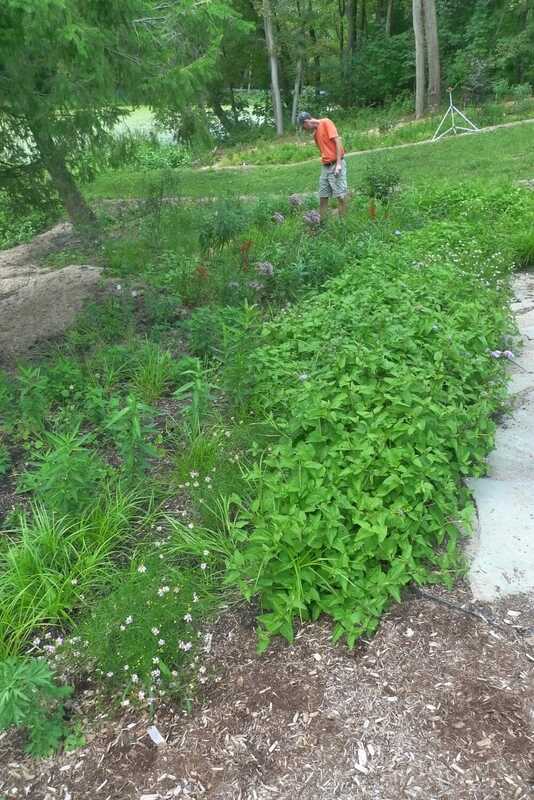 Native perennial plants and seeds were installed along the shore in the soil pockets of the rip rap embankment to help reestablish vegetation along the shore. 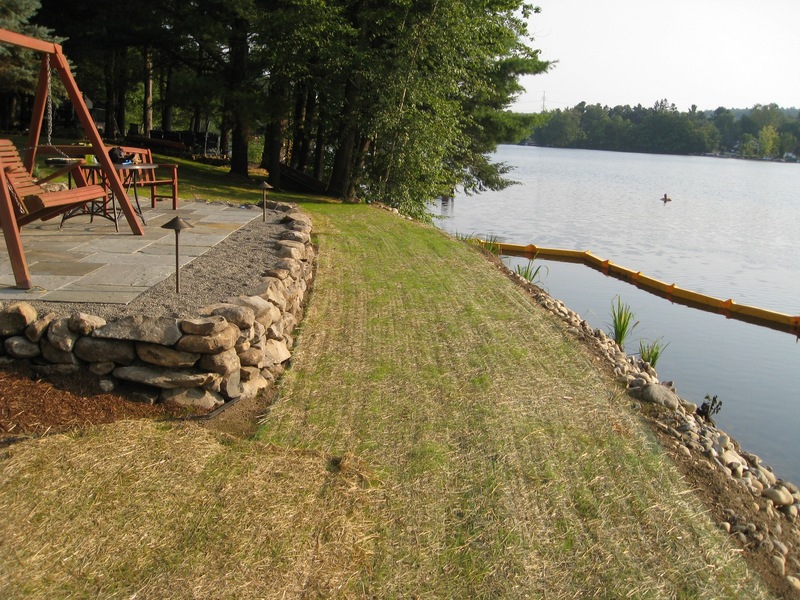 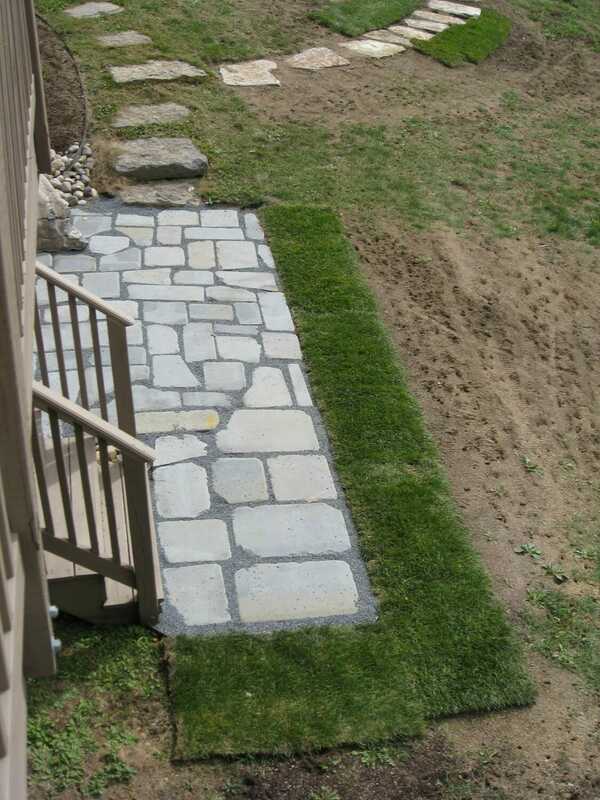 All of the lawn areas were top coated with topsoil, seeded, and anti-erosion mats used to ensure lawn establishment. 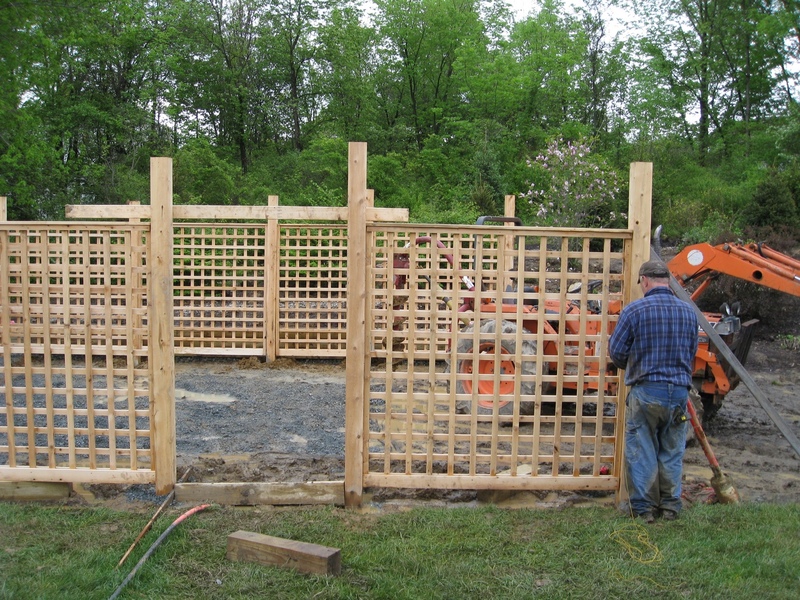 A turbidity curtain, a floating barrier, was used to keep sediment within the immediate work area. 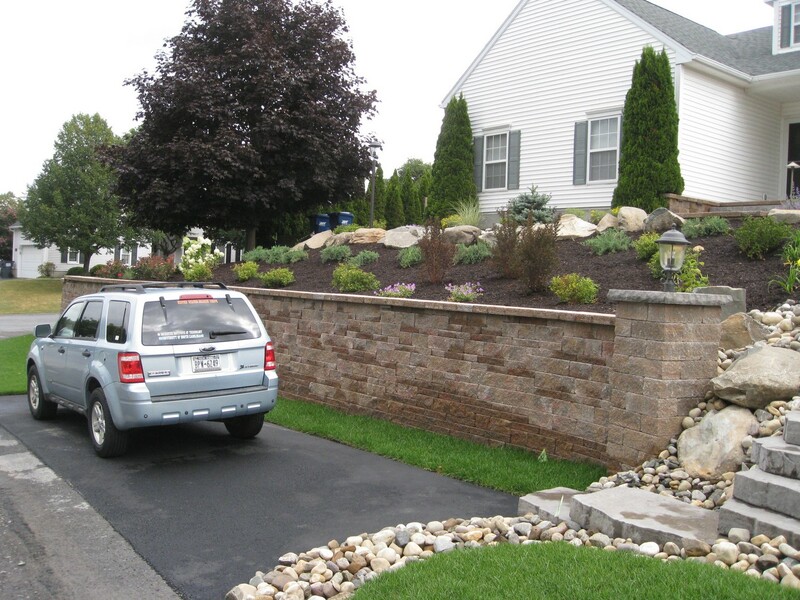 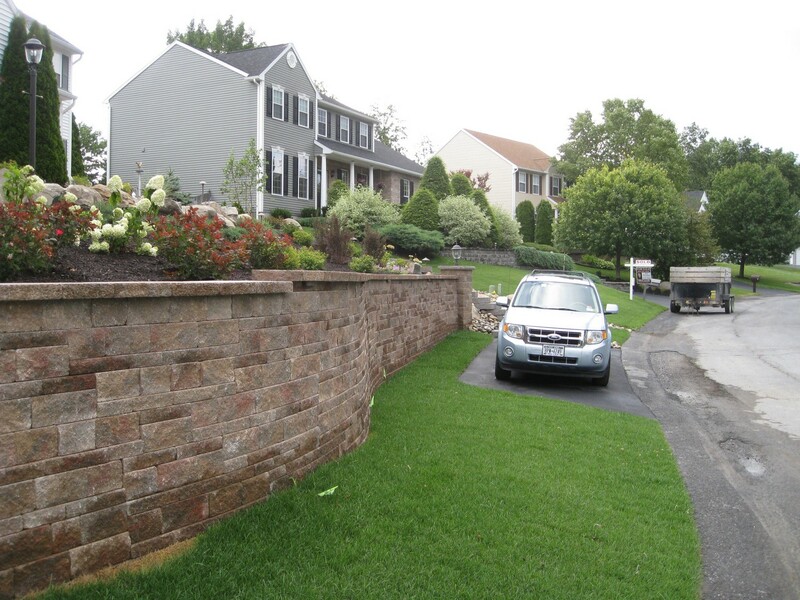 This hardscape entry replacement design project we did for a client in Latham, NY illustrates a common situation with homes and town homes having their entries to the side of their garage. 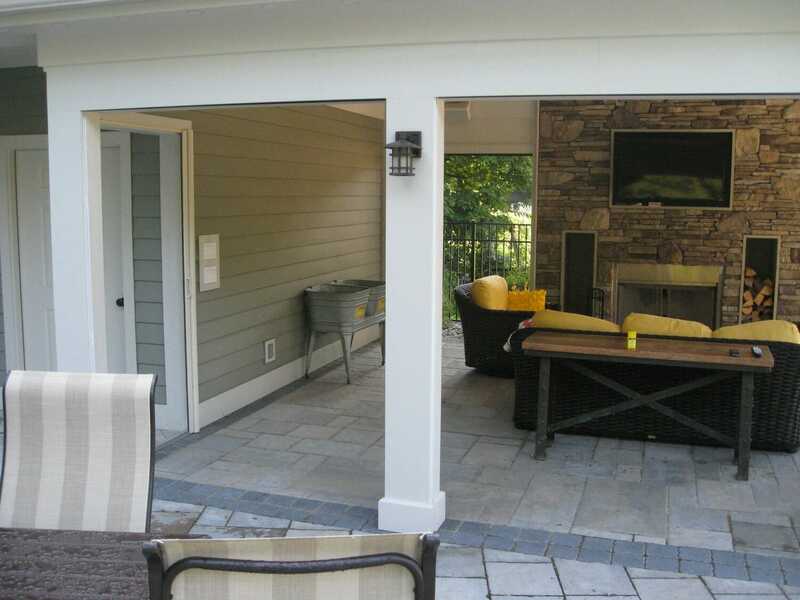 The first thing you see is the garage and creating movement towards the front door is essential. 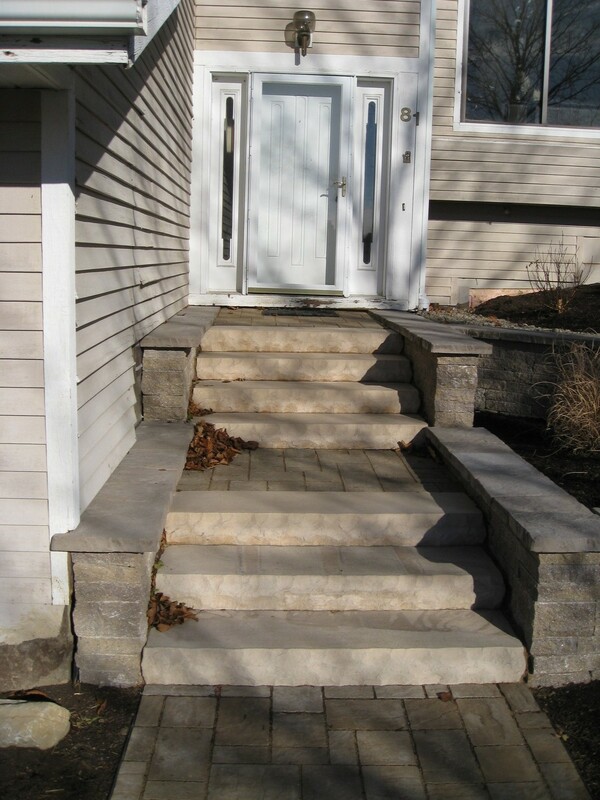 The home had an existing wooden stairway which was awkward and a maintenance nightmare. 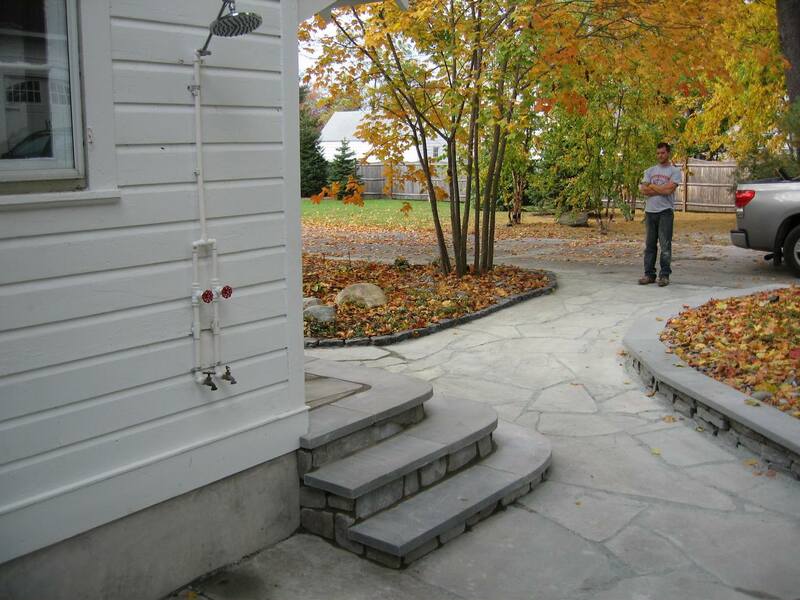 The solution we arrived at was to create a courtyard at the driveway so you are drawn into the space and up the steps to the front door. 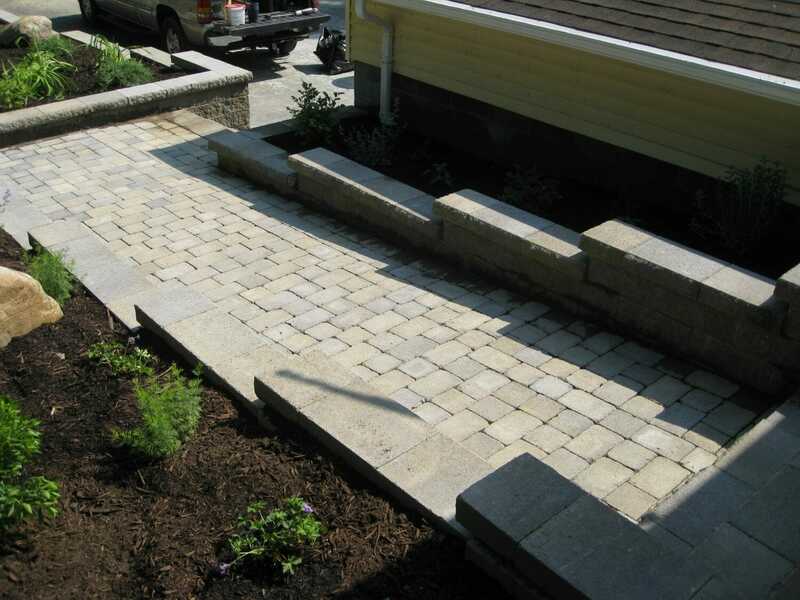 The steps and walls are all easy care, low maintenance Techo Bloc products which will not deteriorate as pressure treated wood did on this sunny exposure. 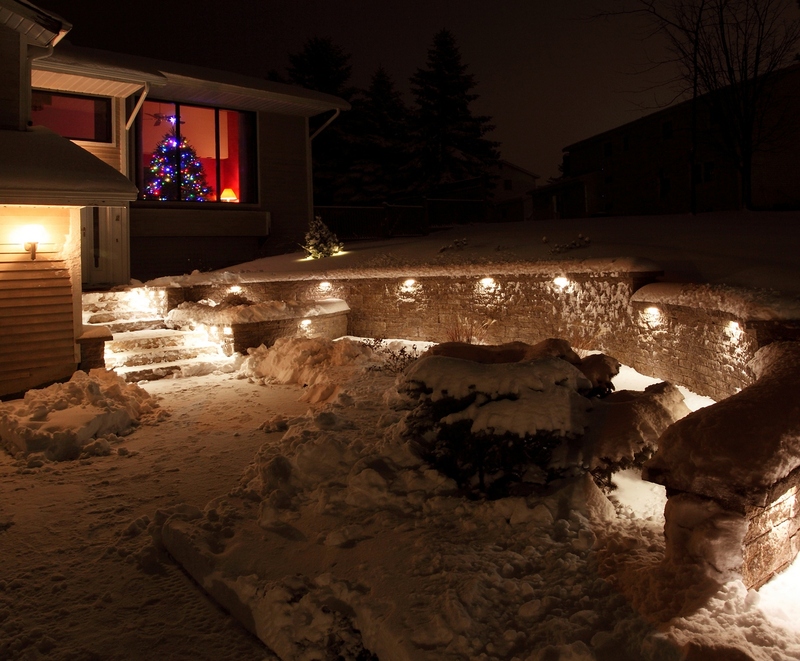 LED lighting under the wall caps light the stairs and the wall. 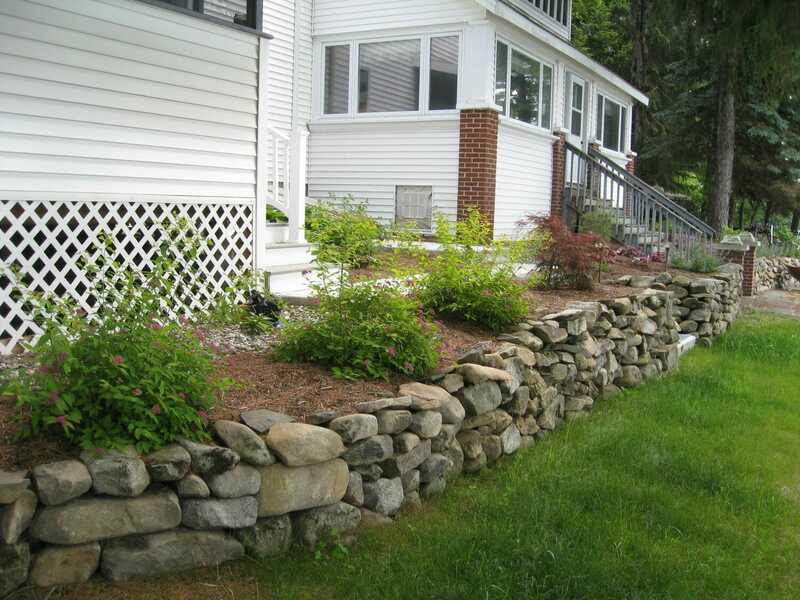 Colorful but easy to care for perennials and shrubs play off the wall’s texture and are placed to never overgrow their space. 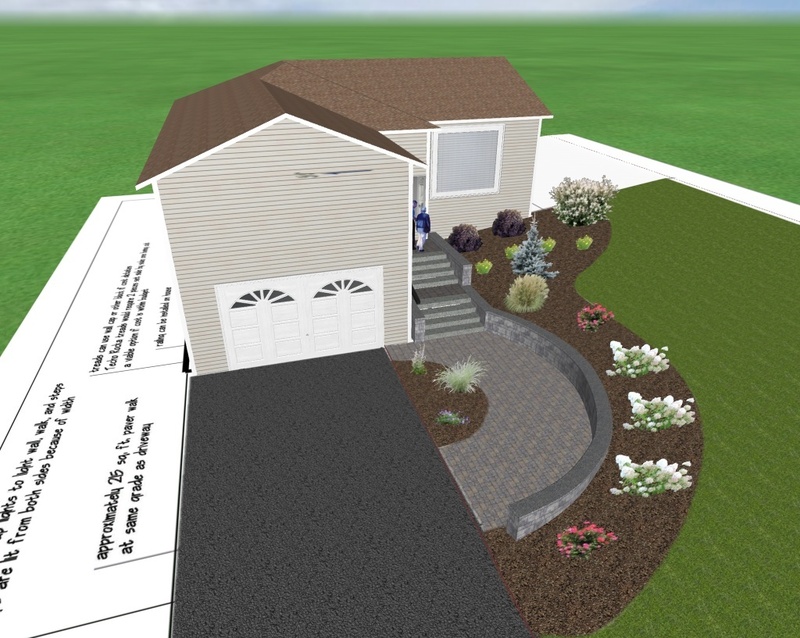 Another great example of how close the 3D image of the plan was to the actual construction. 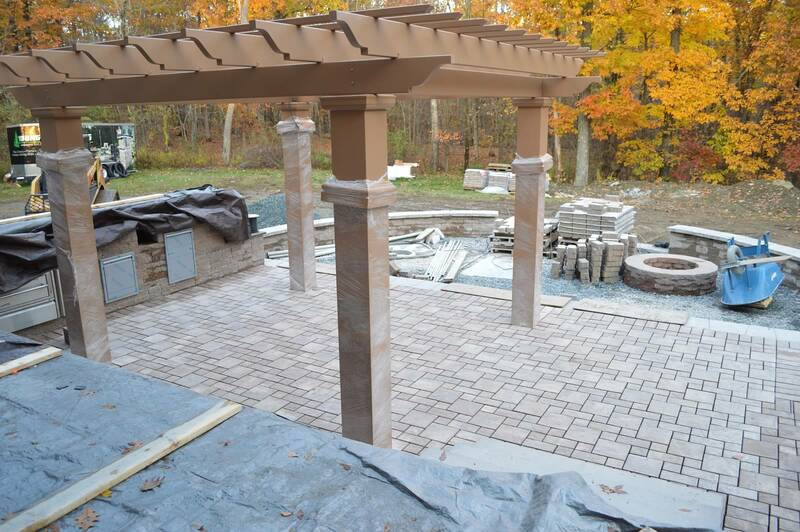 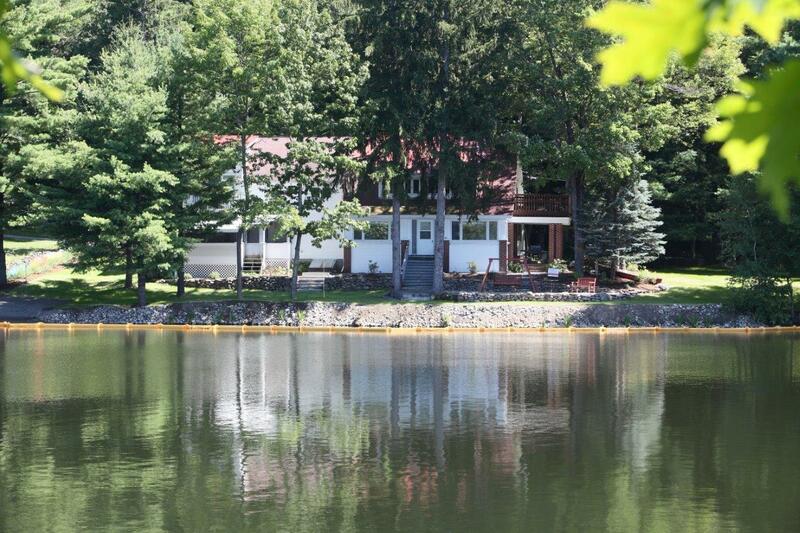 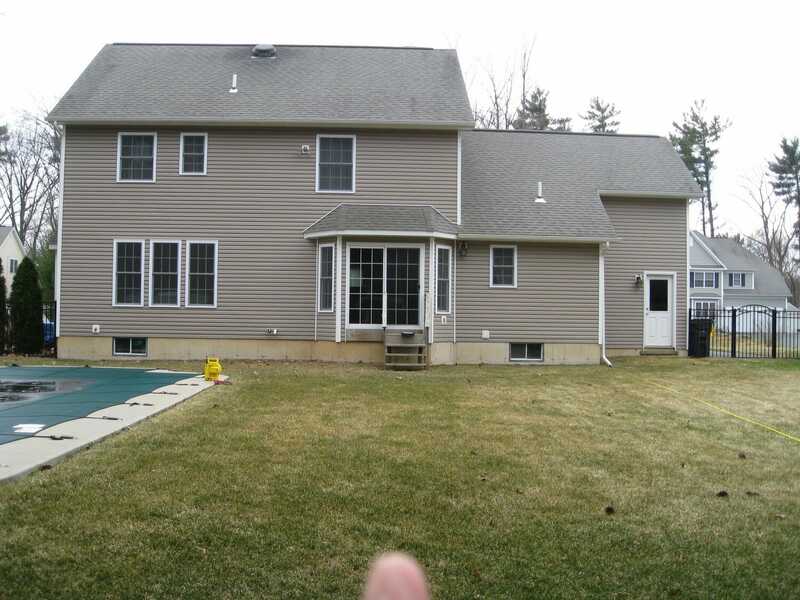 This challenging project was brought to us by Phil Trifaro Enterprises. 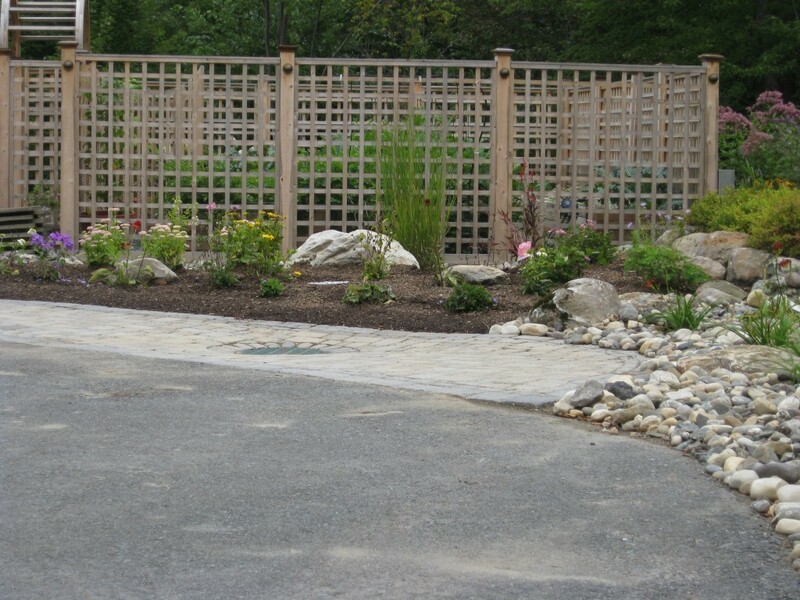 We created the hardscape and plant design and managed the installation, which took several months due to challenging site and weather conditions. 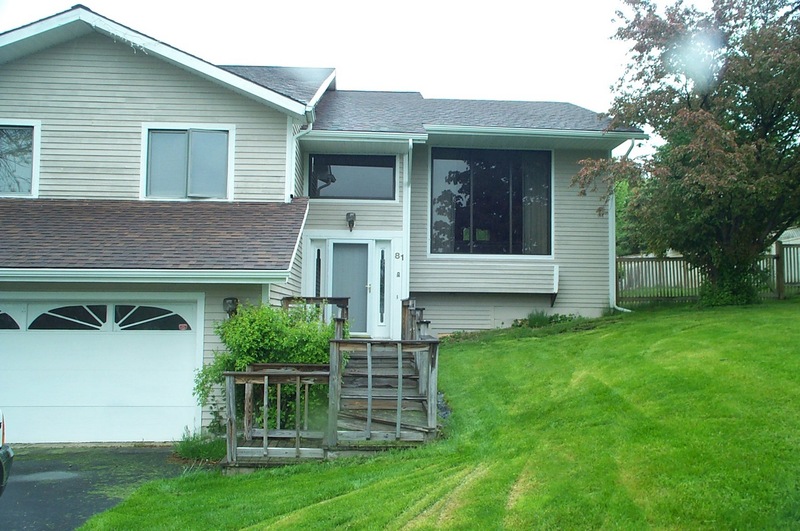 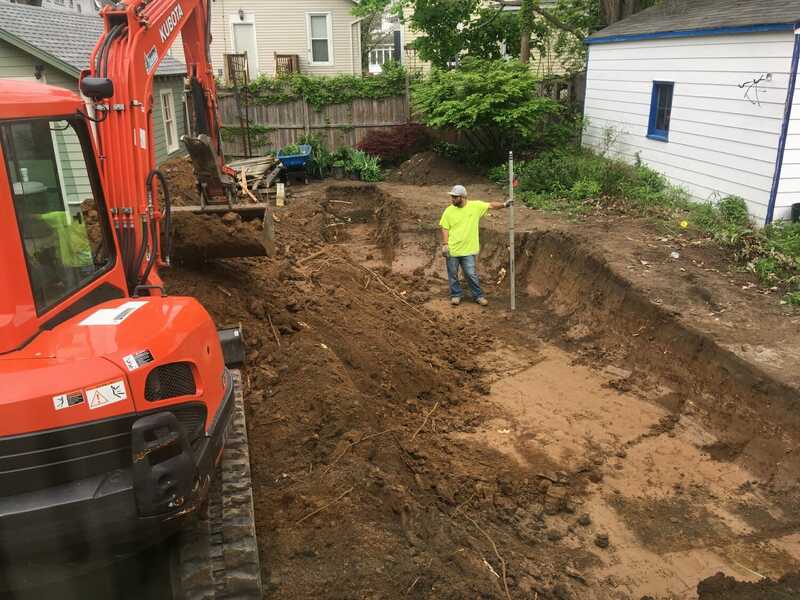 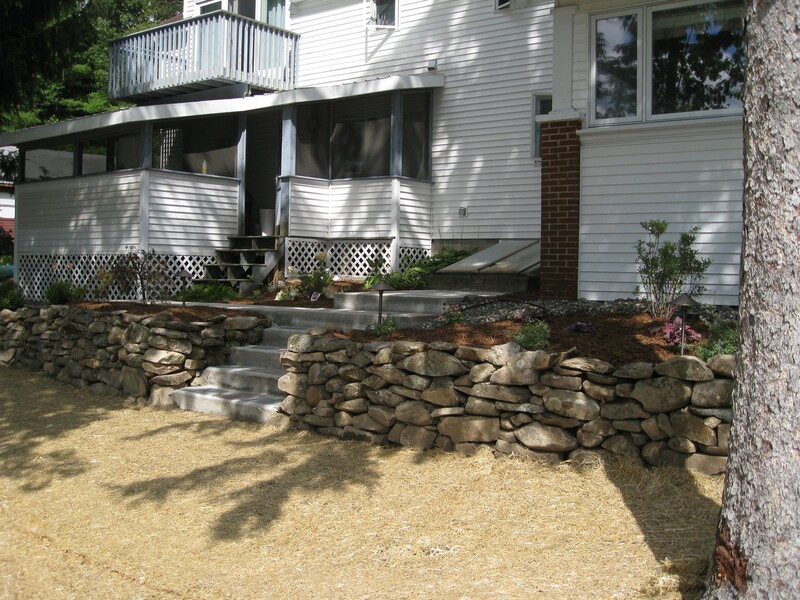 A steeply sloped front yard was terraced inexpertly by the former owner of the property so a complete removal of all existing walls had to be done. 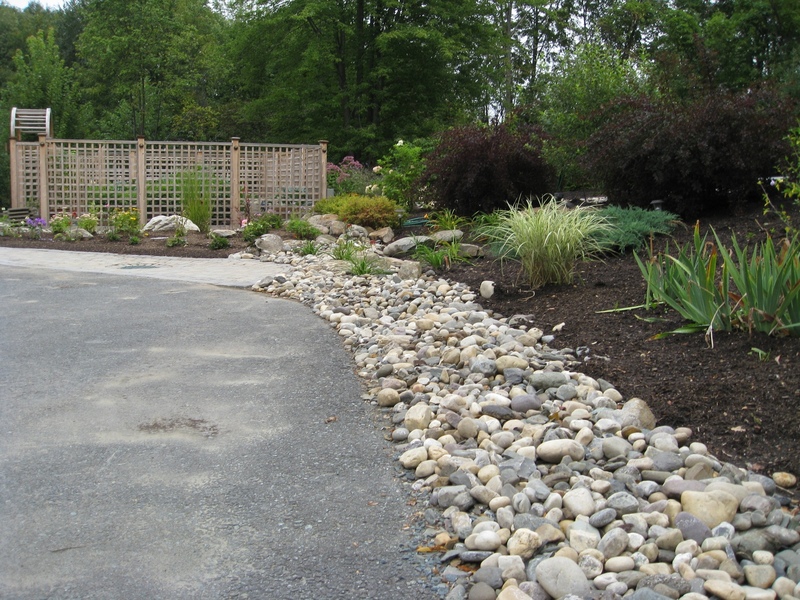 As the project progressed we integrated more natural boulders into the design to soften the necessary retaining wall's appearance and visually tie into the river cobble drainage swale that directs water safely through the property. 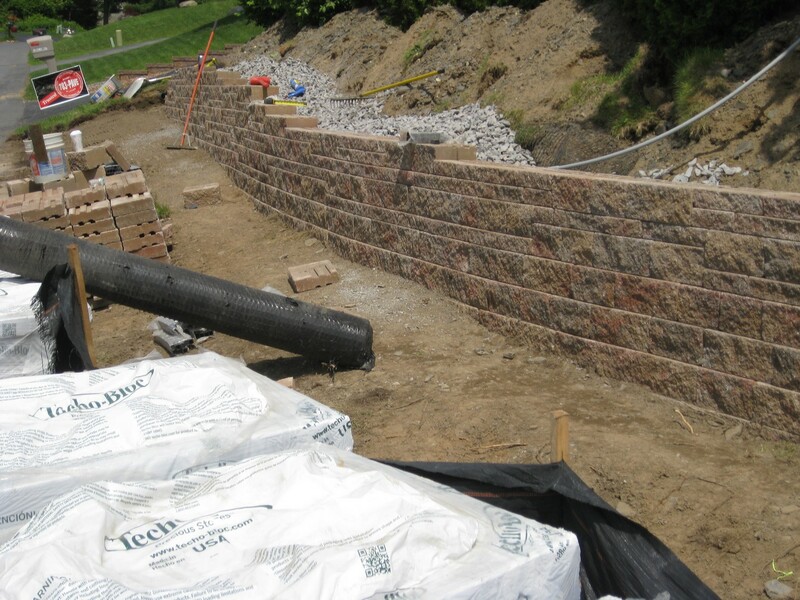 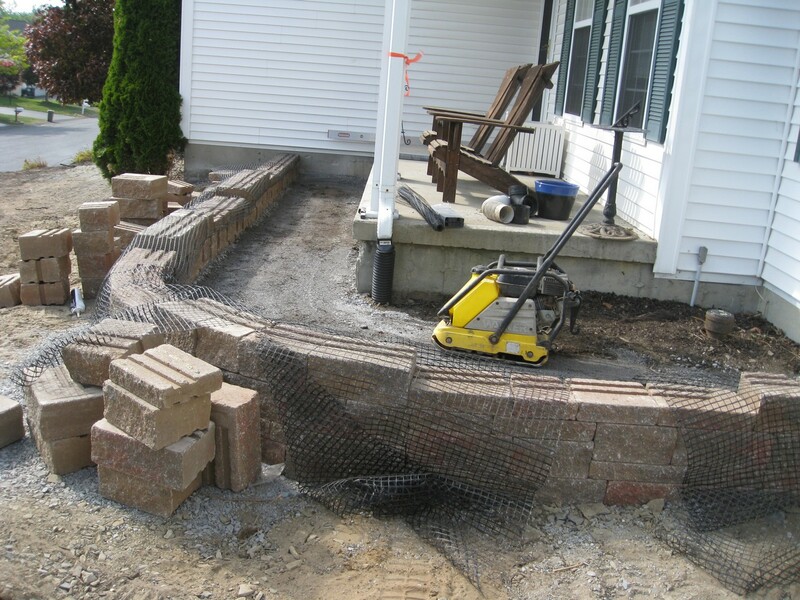 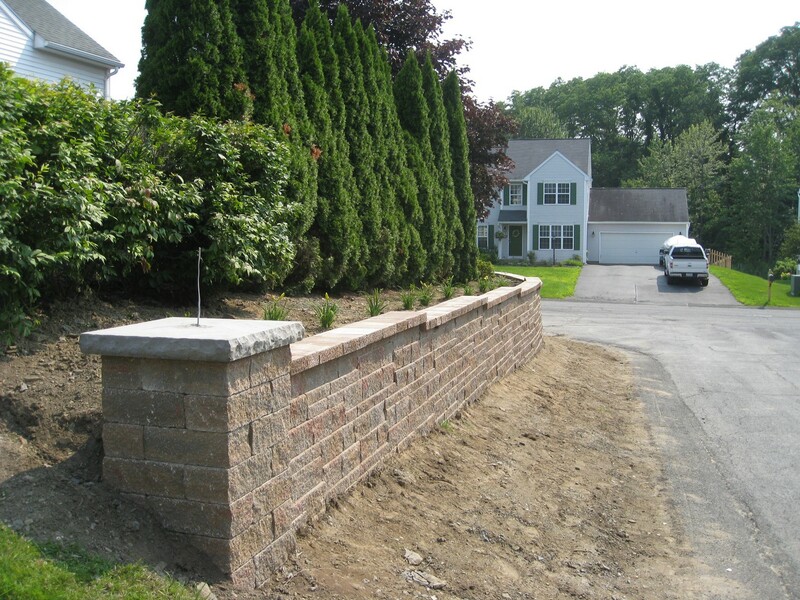 Extensive drainage systems protect the retaining wall from hydrostatic pressure and the slope from erosion. 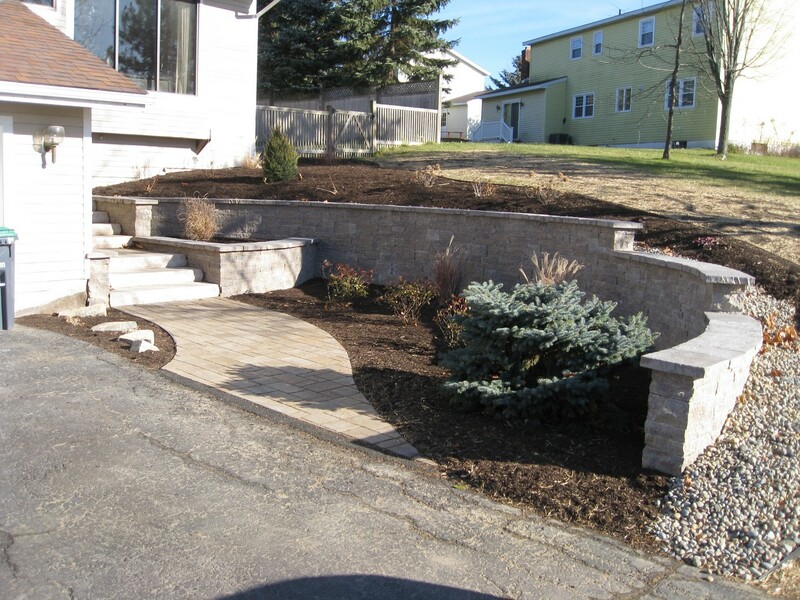 A small parking area was added and a rustic staircase of cast stone steps leads visitors up the slope to the front entrance. 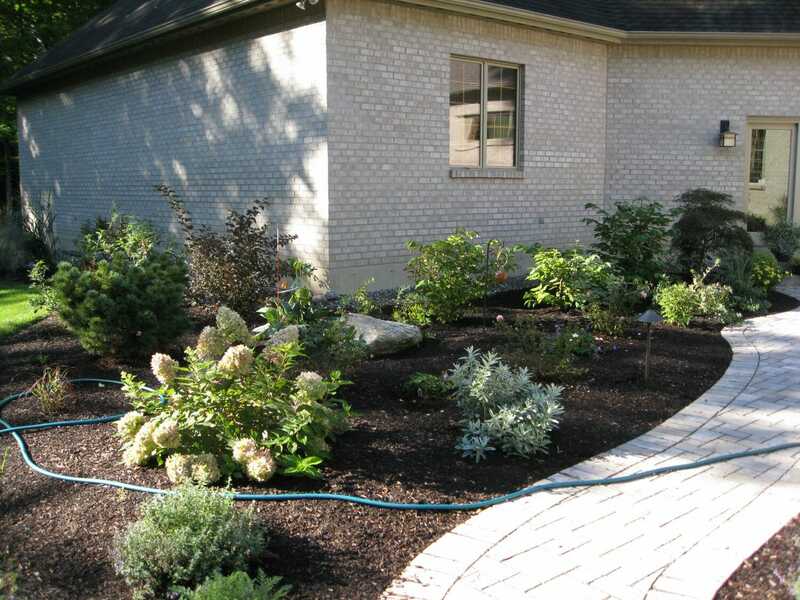 Low maintenance but colorful shrubs and perennials provide color and interest, watered with a water conserving drip system. 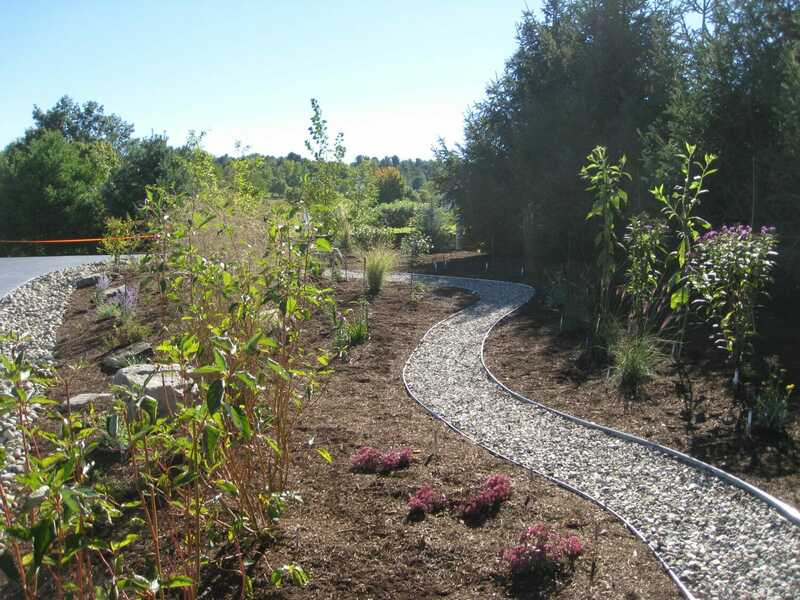 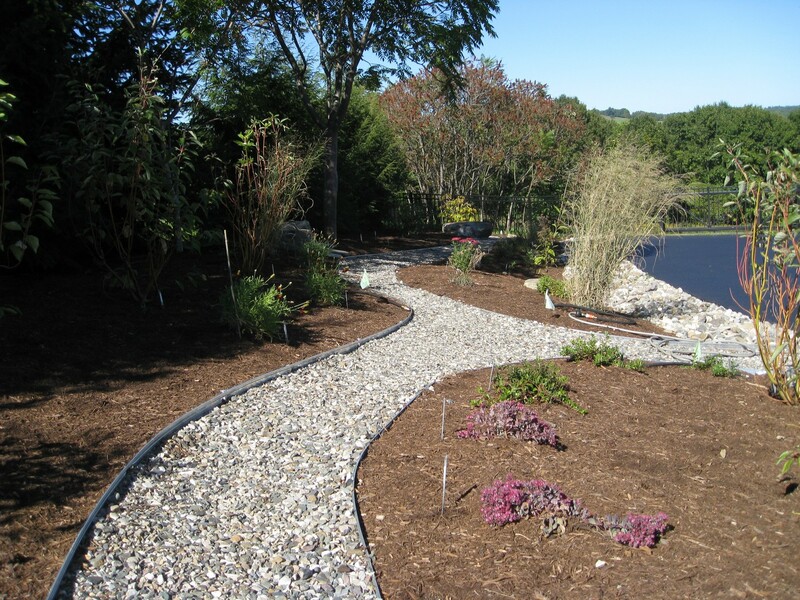 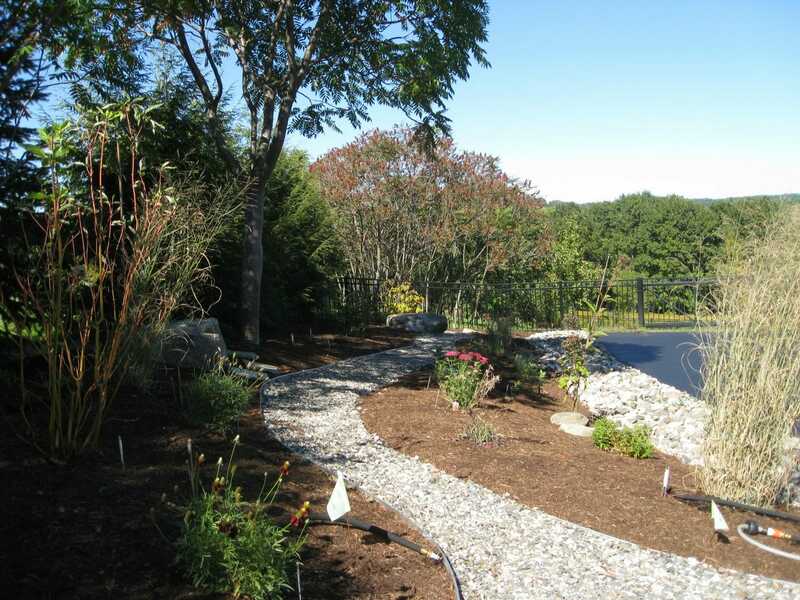 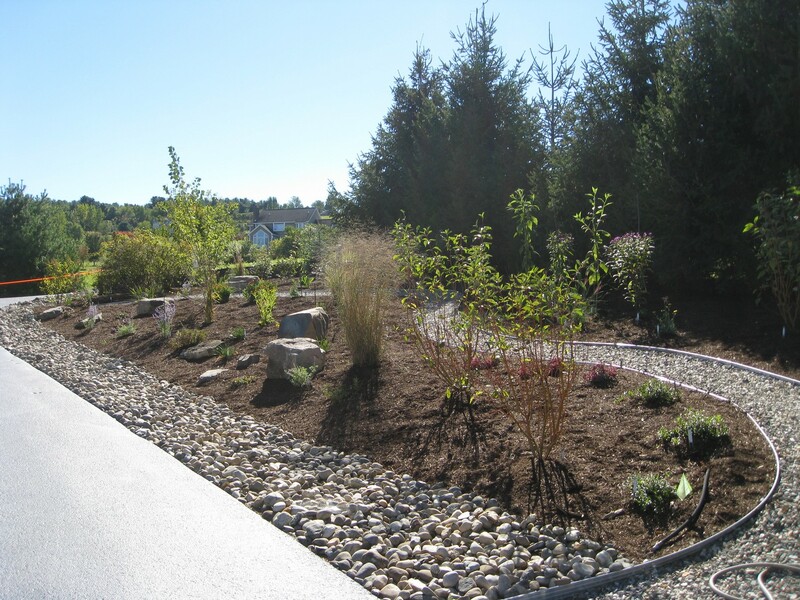 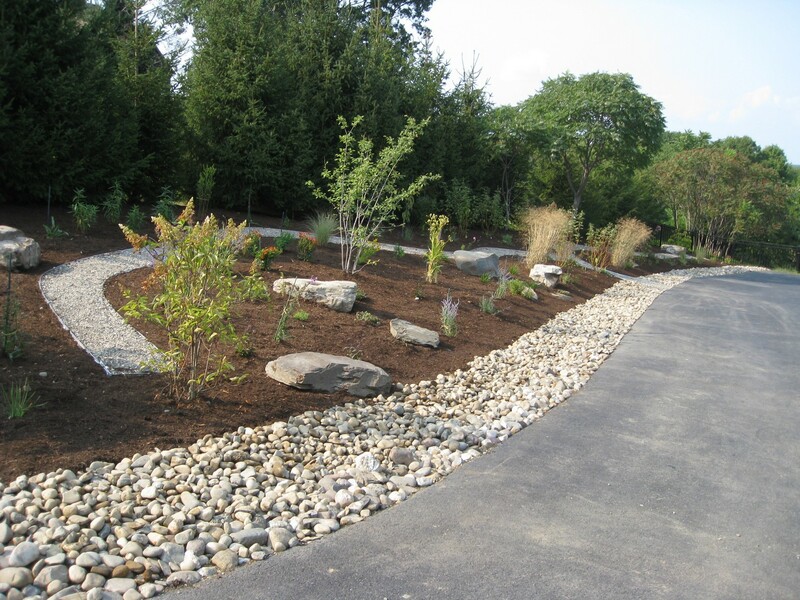 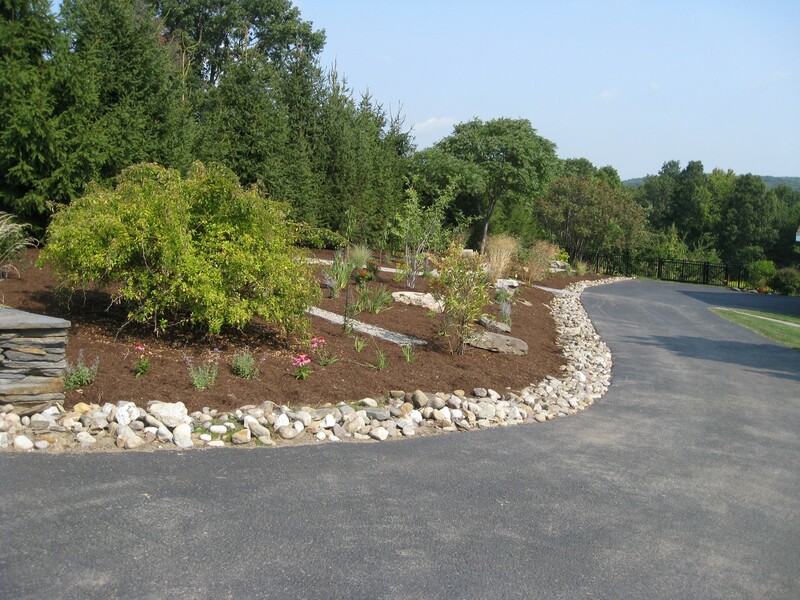 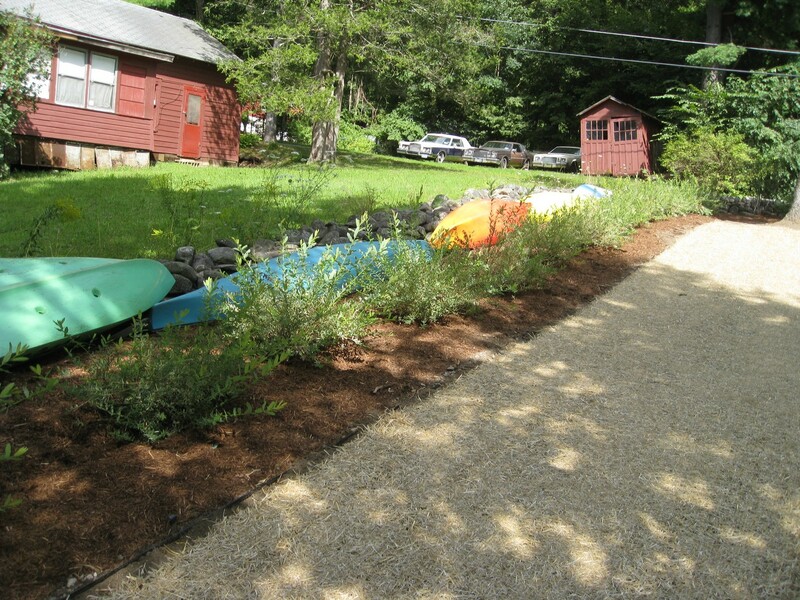 This native plant landscape design and installation turned a weed covered strip along the clients' driveway into a naturalistic garden with sitting boulders, walking paths, and dramatic LED landscape lighting. 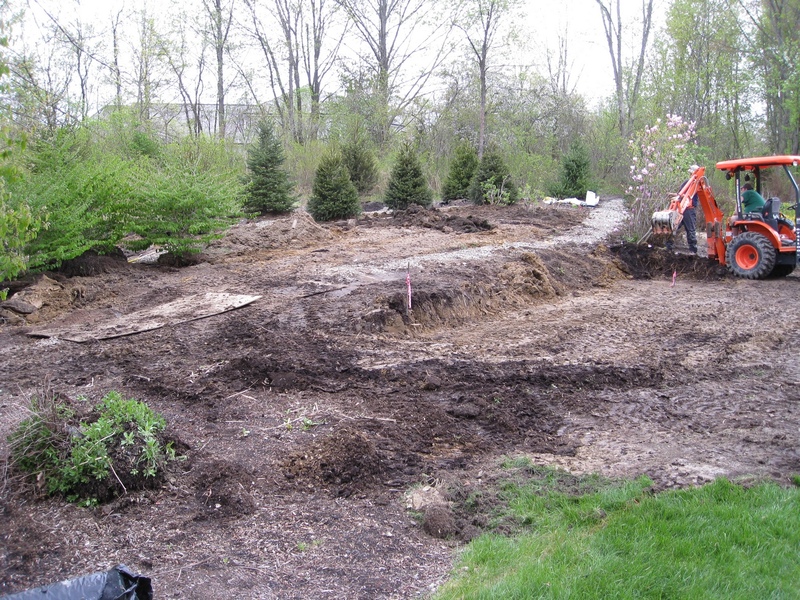 Existing sumac trees were left in place when all of the weed invested soil was scraped off replaced with natural topsoil. 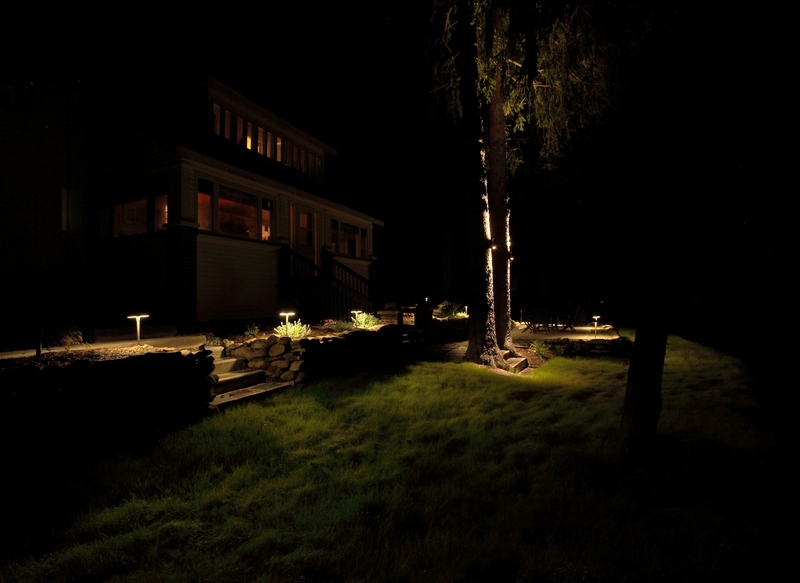 The sumacs make interesting lighting subjects all year round. 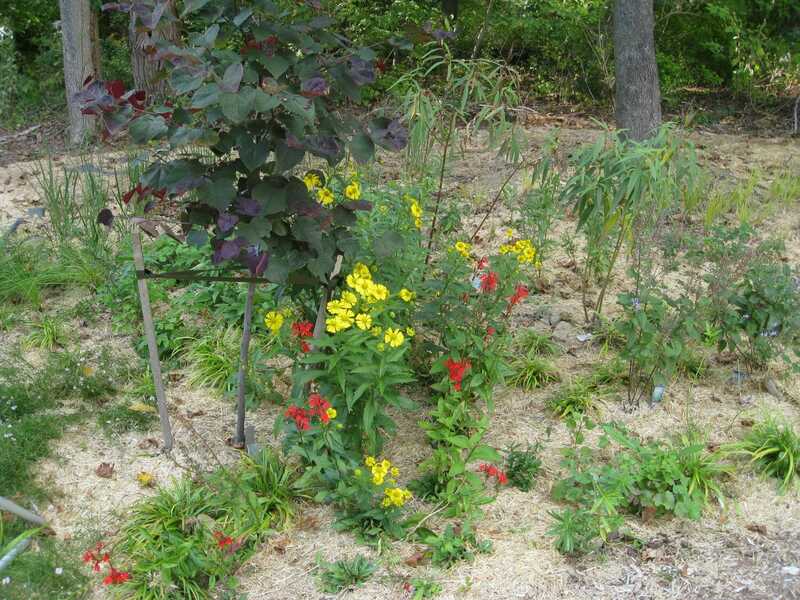 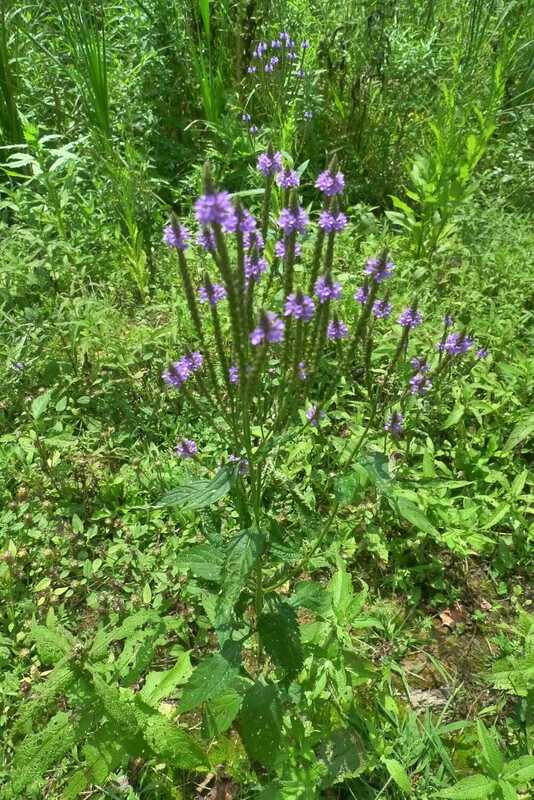 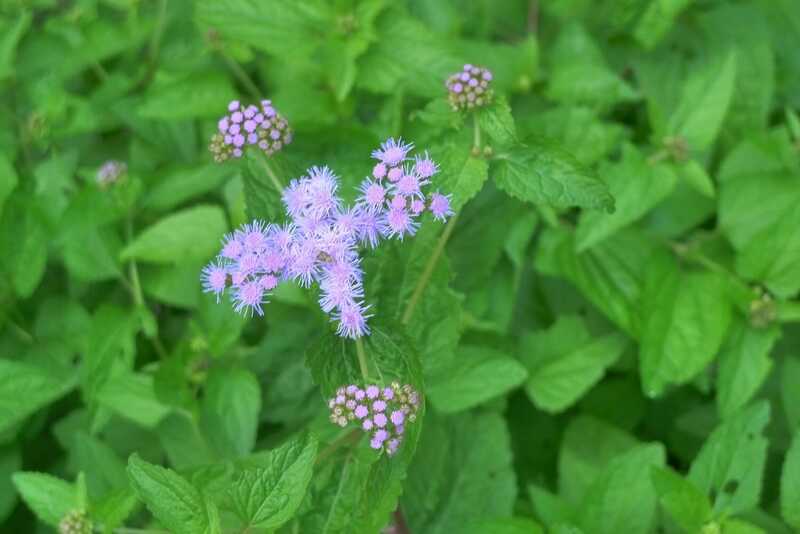 The majority of the plants used were native or native derived. 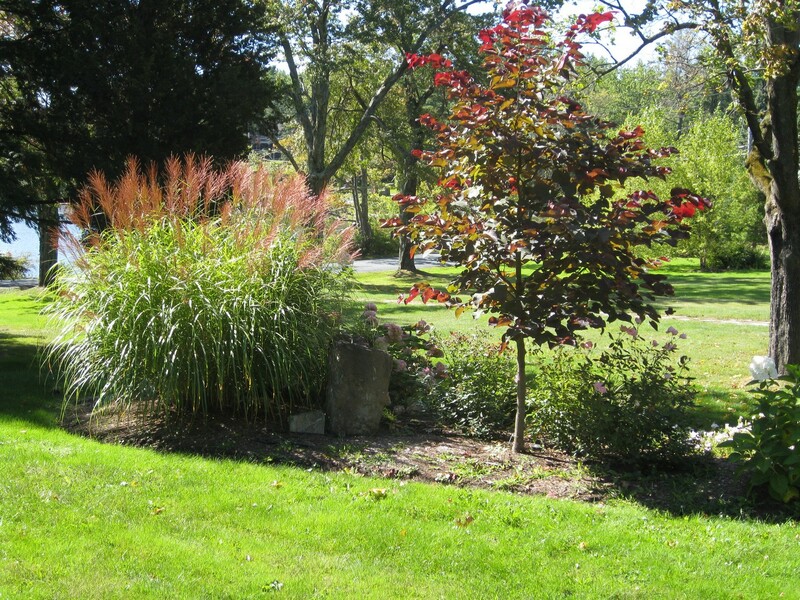 Serviceberry, dogwood, bottlebrush buckeye, winterberry, and spruce provide a structure around the dozens of perennials such as joe pye, milkweed, and coneflower. 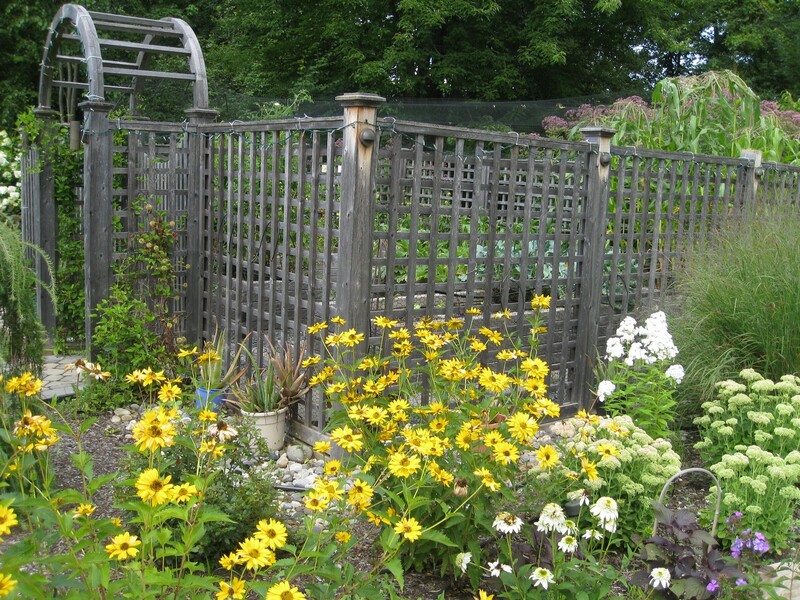 Beneficial pollinators such as butterflies are attracted in droves and provide a season long show of activity. 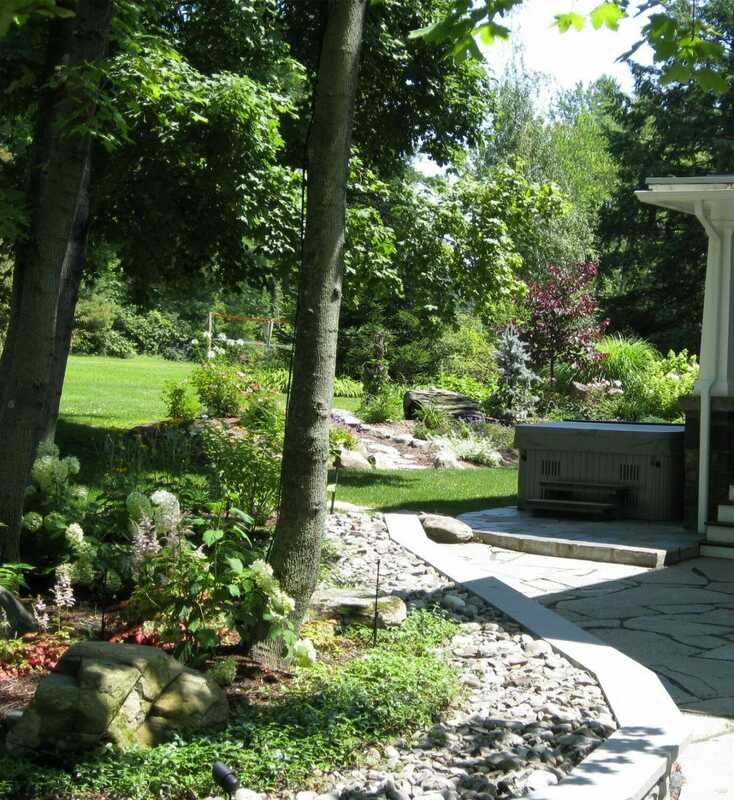 Sitting in the garden you actually feel like you are in a secluded hidden garden even though you are in the front yard. 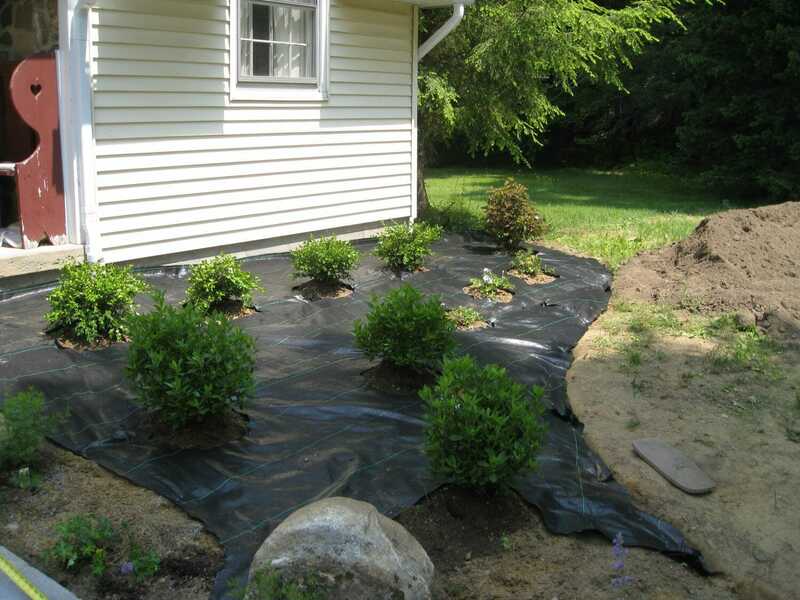 Soaker hoses provide initial watering until the plants establish and a generous 5" of mulch keeps weeds at bay without the use of artificial barriers like landscape fabric which will deter the perennials from spreading naturally. 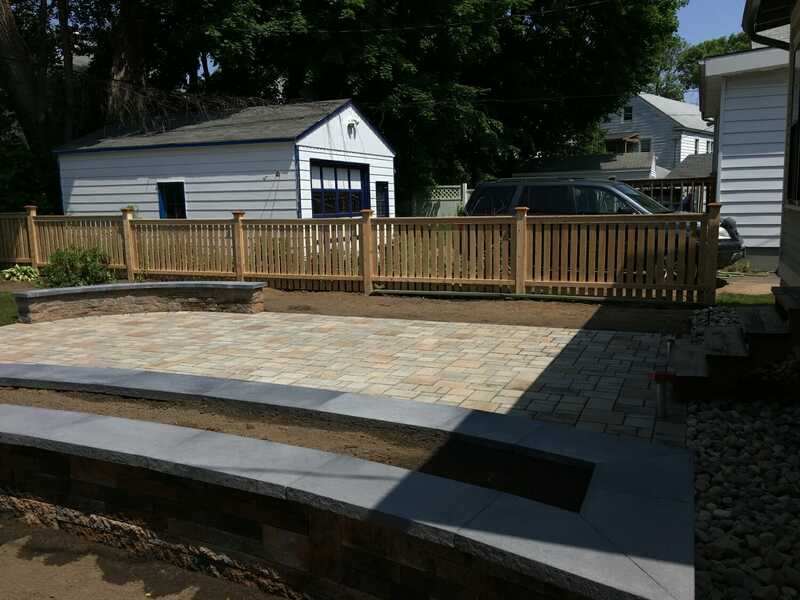 This major project, completed in 2015, was a joy to work on for Laura and I. 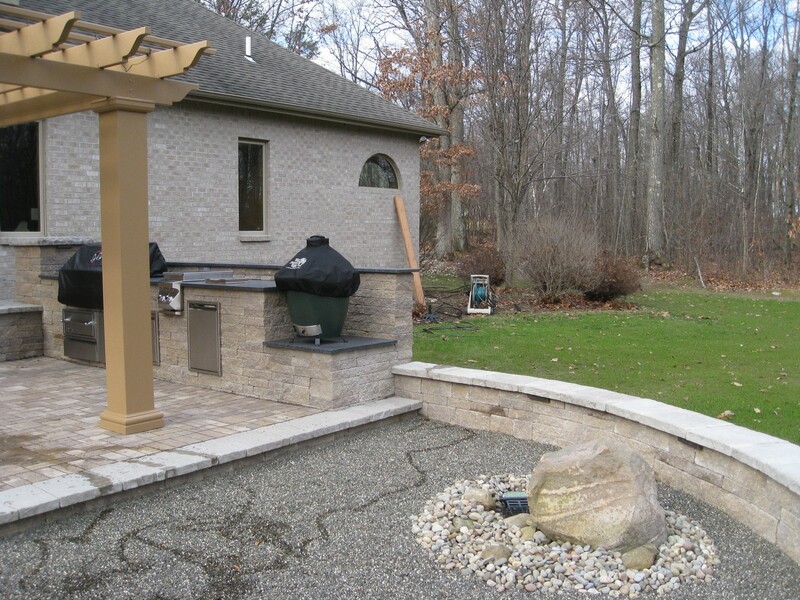 The outdoor kitchen island featured a 42" grill, warming drawer, side burners, trash receptacle, and a Green Egg smoker. 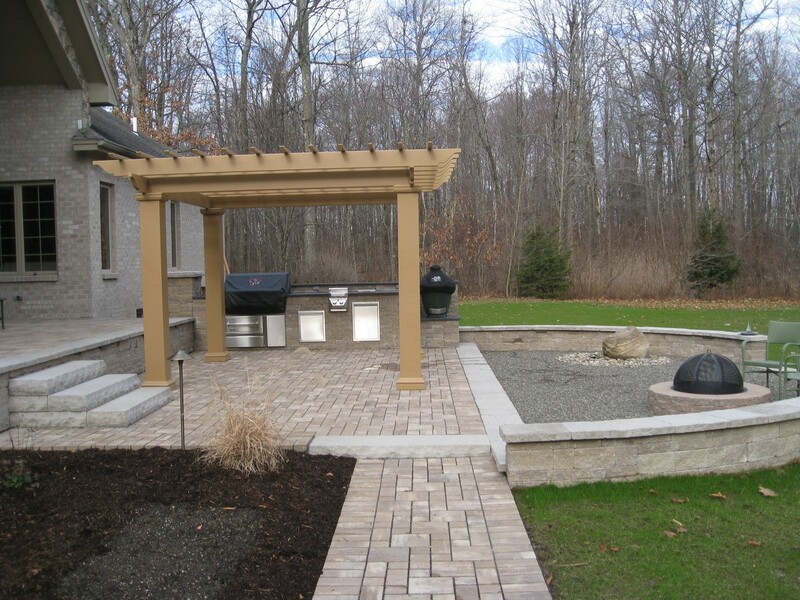 Laura Kelly, who has worked in the kitchen and bath industry for many years, was the lead project manager for this project's outdoor kitchen elements while John managed the plantings, lighting, and hardscape. 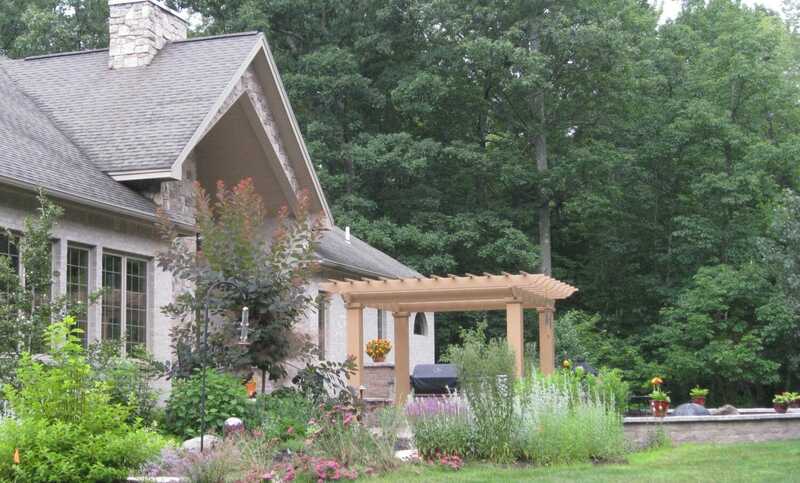 A no maintenance fiberglass pergola provides a break from the sun but still permits views out from the house. 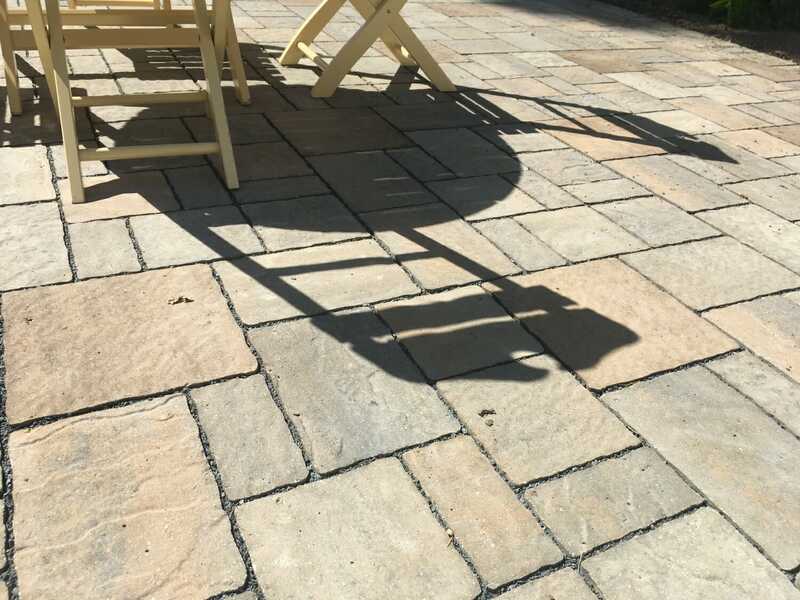 Situated in a heavy clay soil, we decided to use a permeable paving system which allows water through the joints between the paving units where it is captured by an extensive drainage system and piped away. 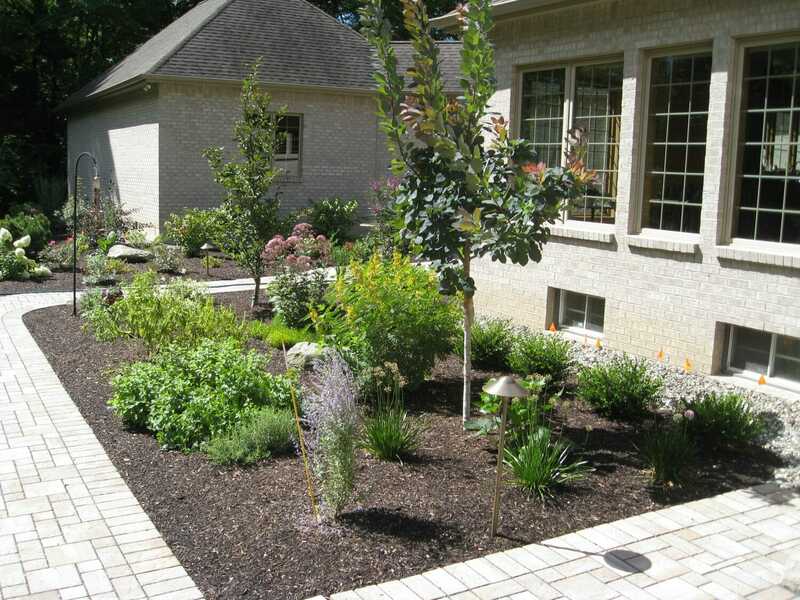 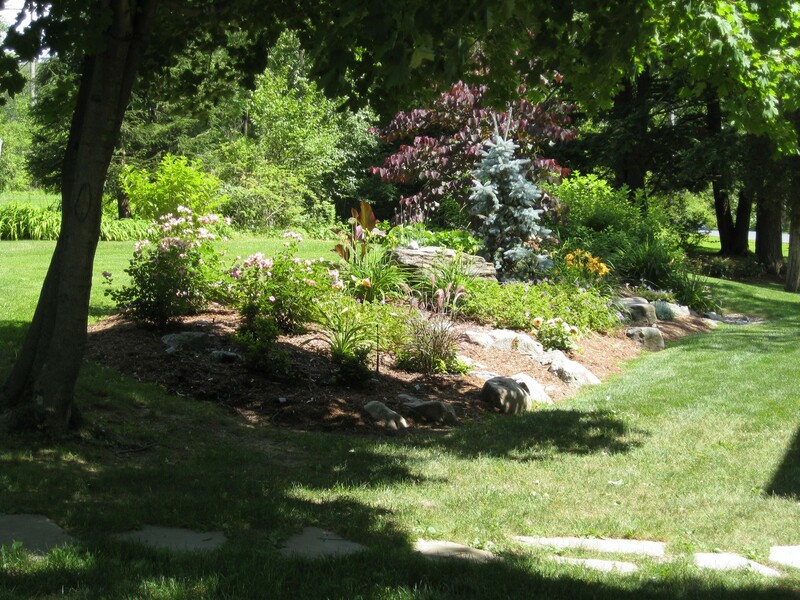 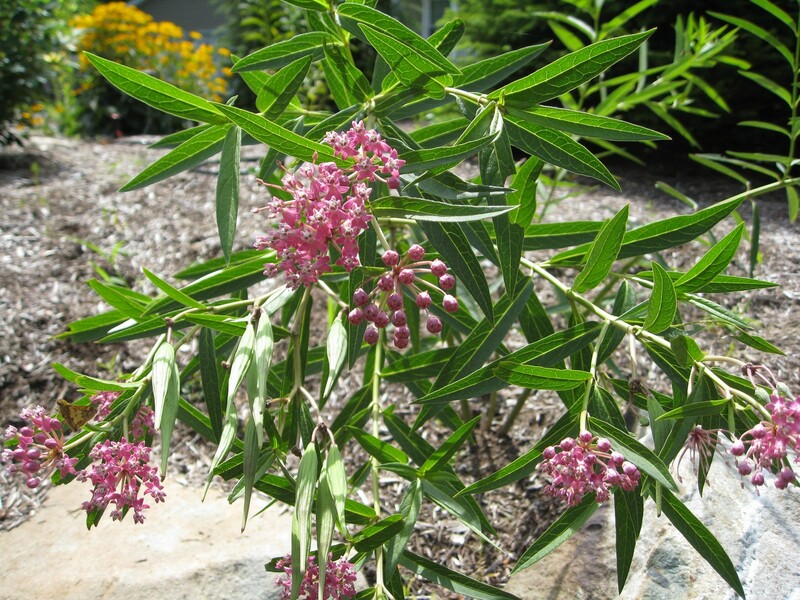 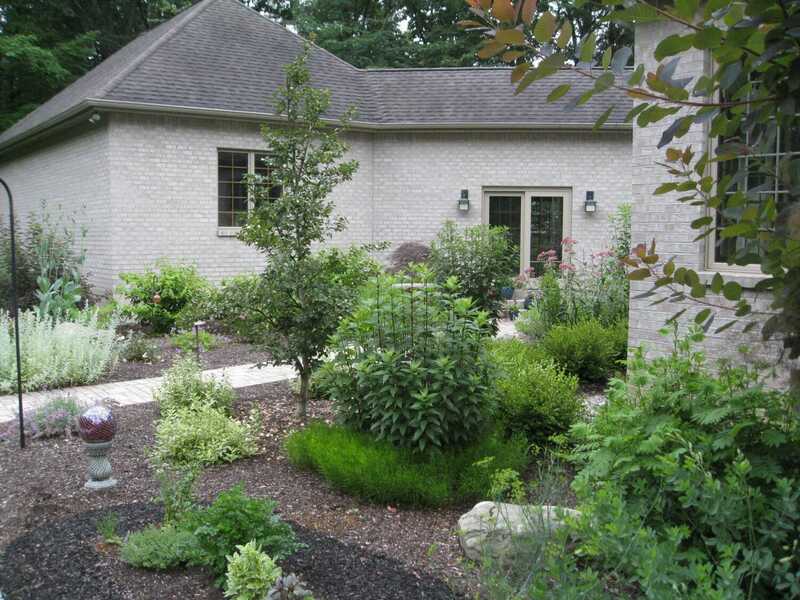 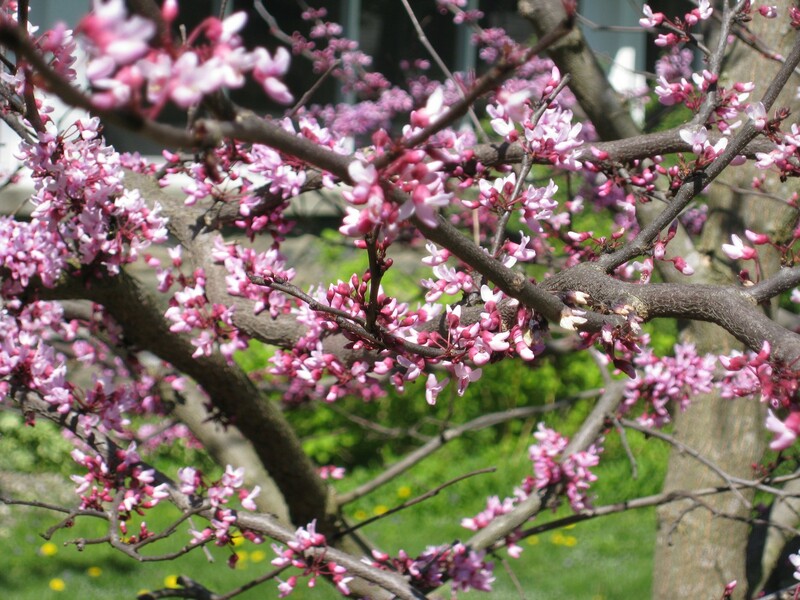 Plantings focused heavily on native and bird friendly perennials, shrubs, and trees. 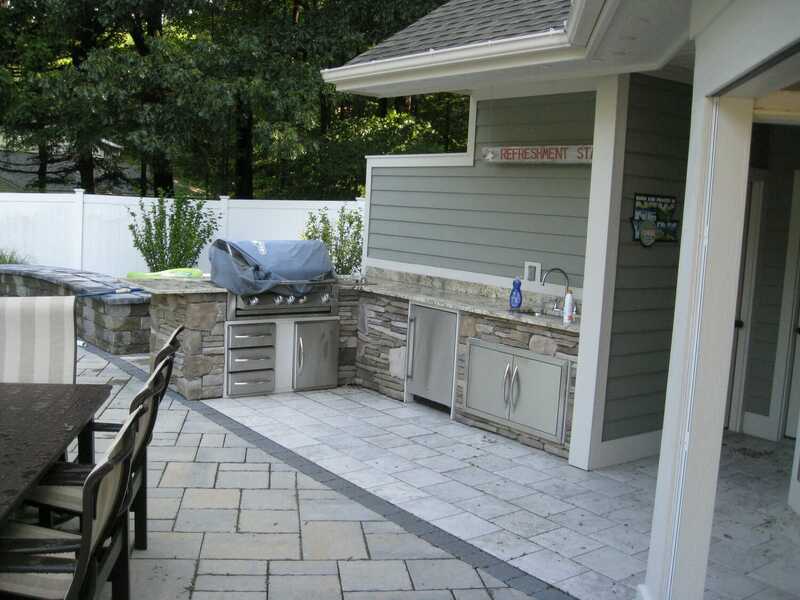 Outdoor kitchen design is much more than just setting a grill on your patio. 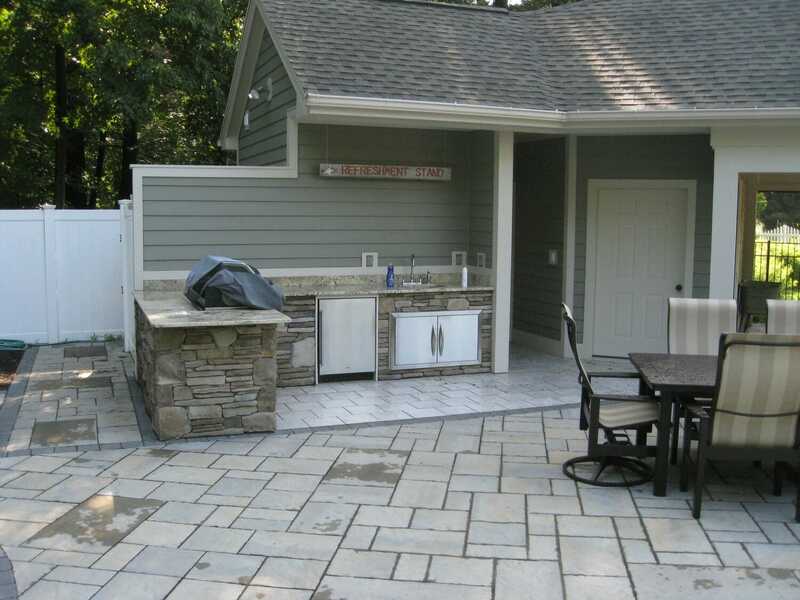 A professional kitchen designer should be used to maximize your investment if doing this kind of project. 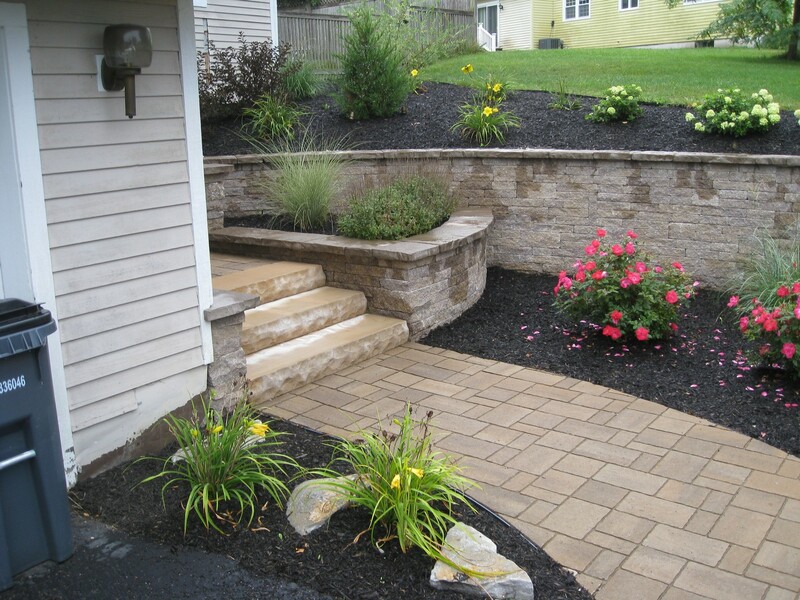 This is a great example of how the planting softens the hardscape and they complement each other, creating true outdoor "rooms". 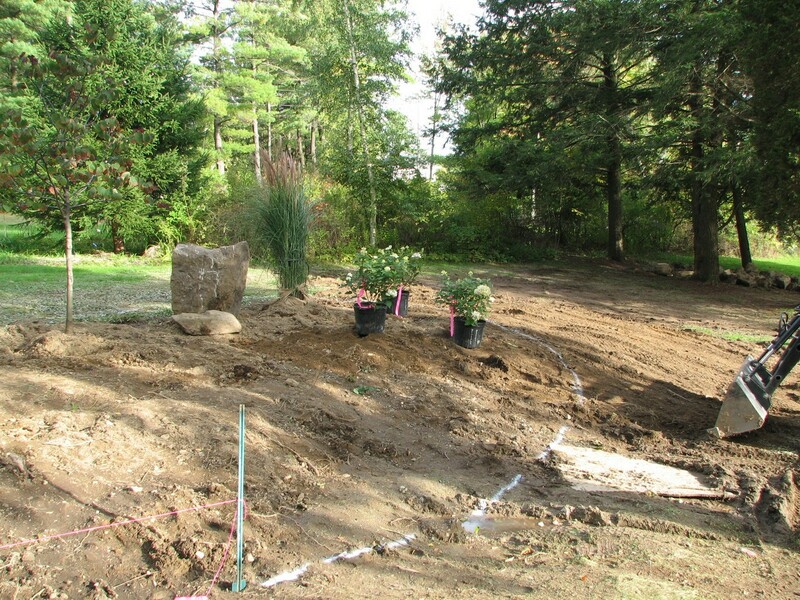 Another phase of a landscape master plan managed project in Latham, NY at the Shaker Bay property in Albany County, this vegetable garden had to be located in the only sunny area, right next to the drive. 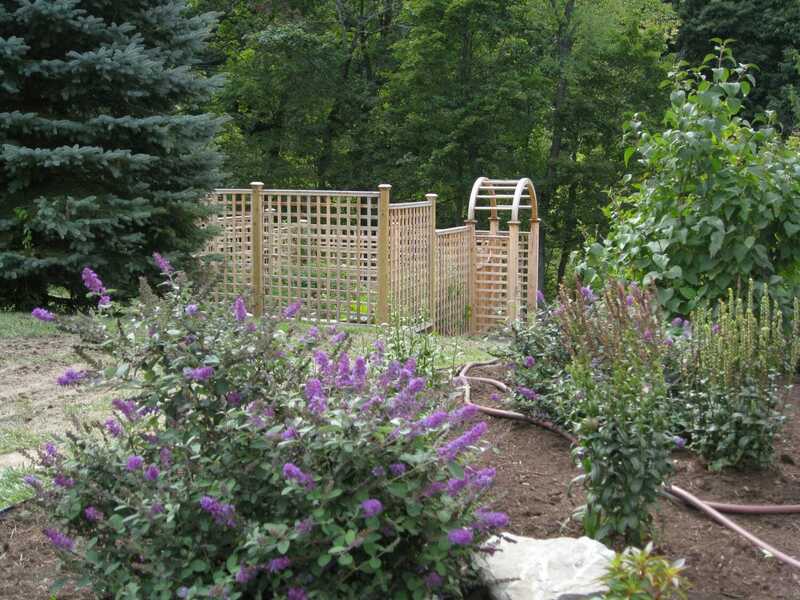 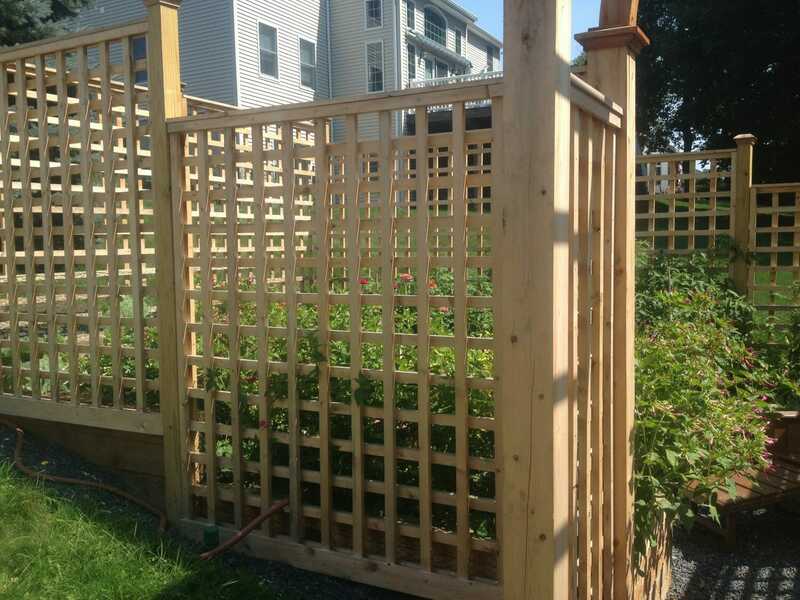 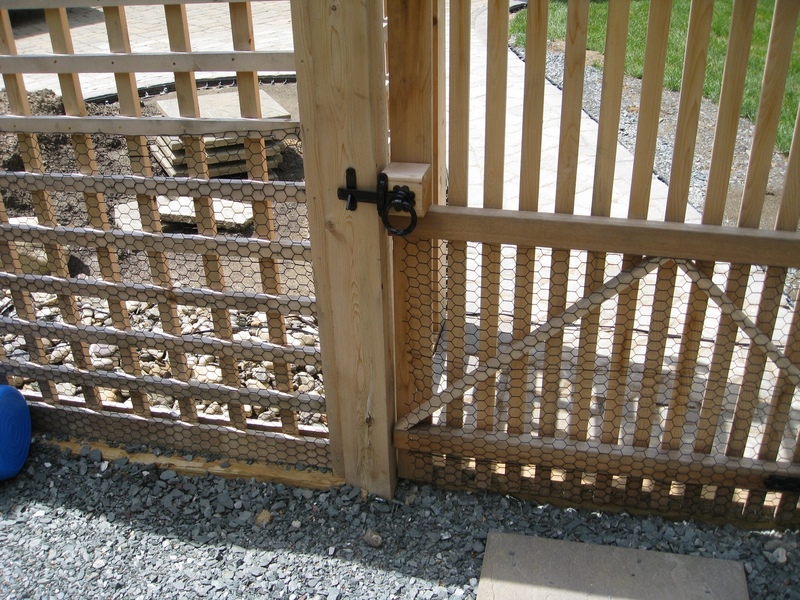 A cedar fence turns the garden into a focal point while protecting it from animals. 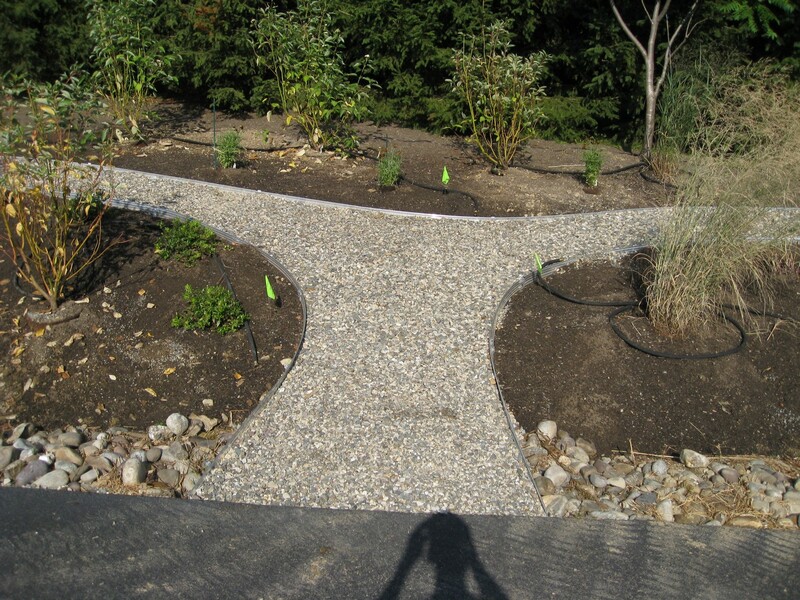 A new walkway was integrated into the existing paver apron and a cutting garden was installed between the garden and drive. 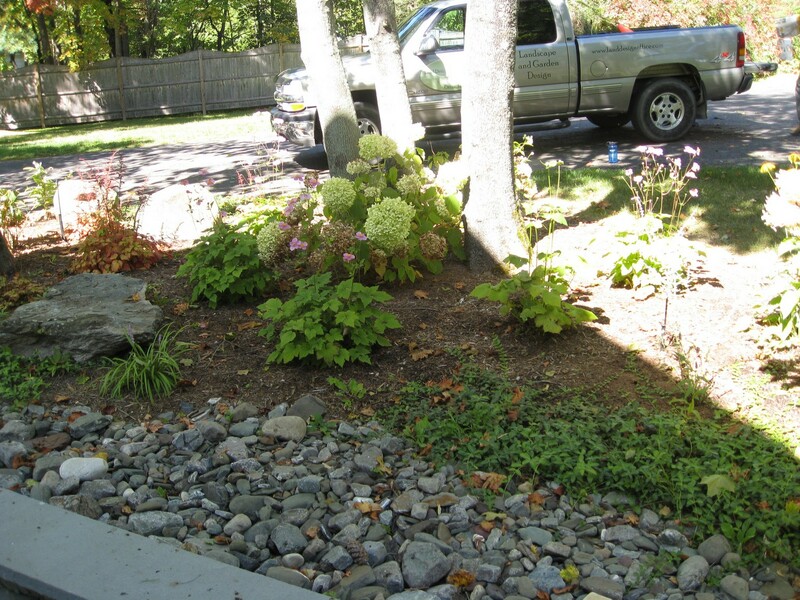 This also has a dual purpose; it provides a colorful border to soften the structure form the drive views and acts a buffer in winter to allow plowed snow to sit and melt in the area and dissipate to the nearby drain. 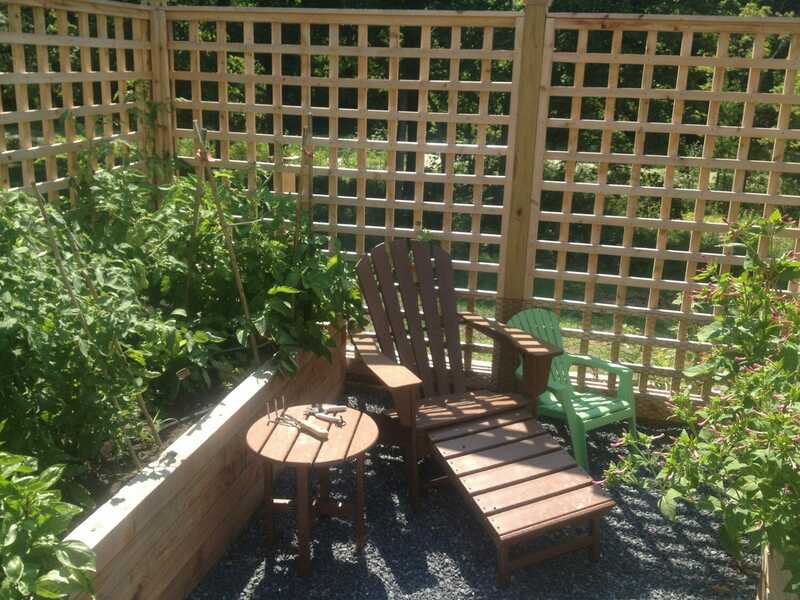 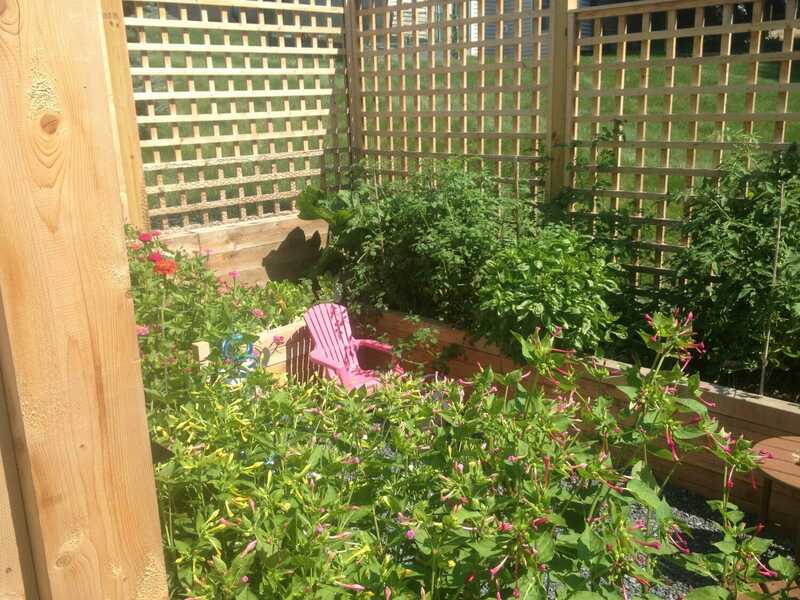 Cedar was also used for the raised beds and they are a generous seat height. 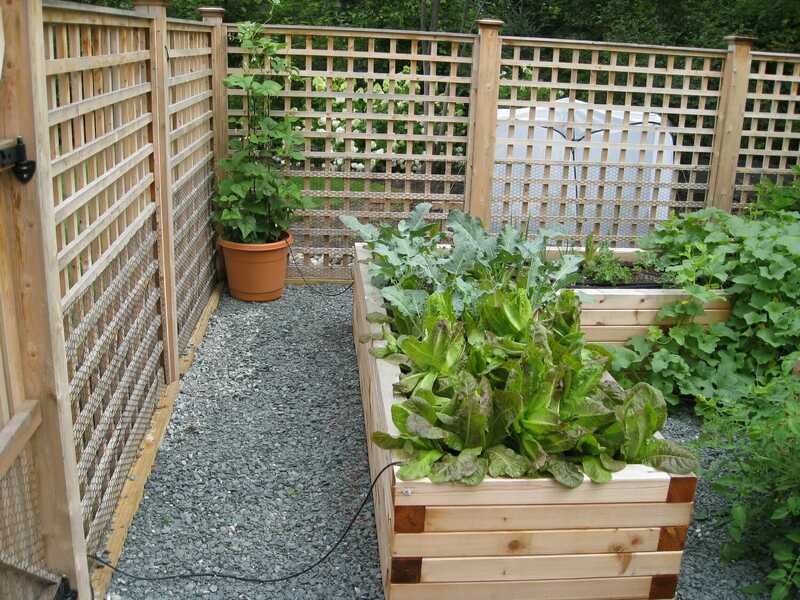 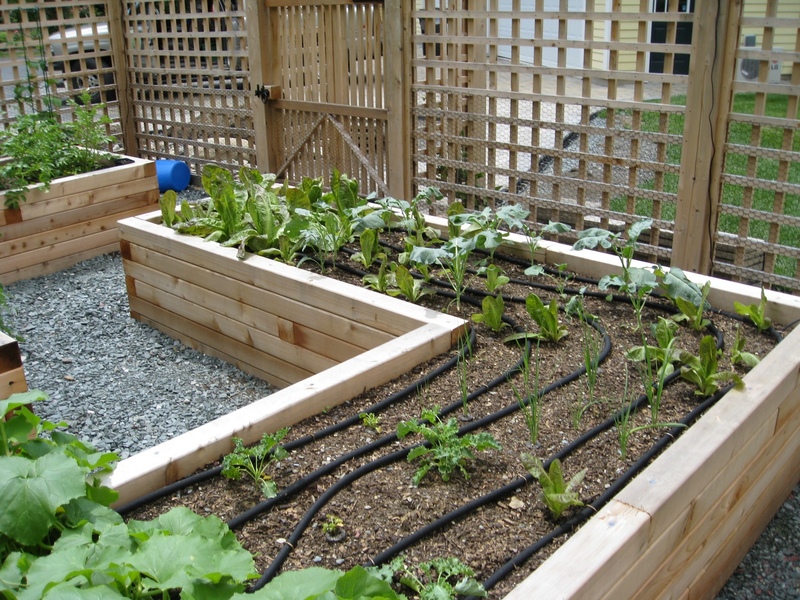 Automated drip irrigation waters the garden without watering the fence, which could lead to premature failure. 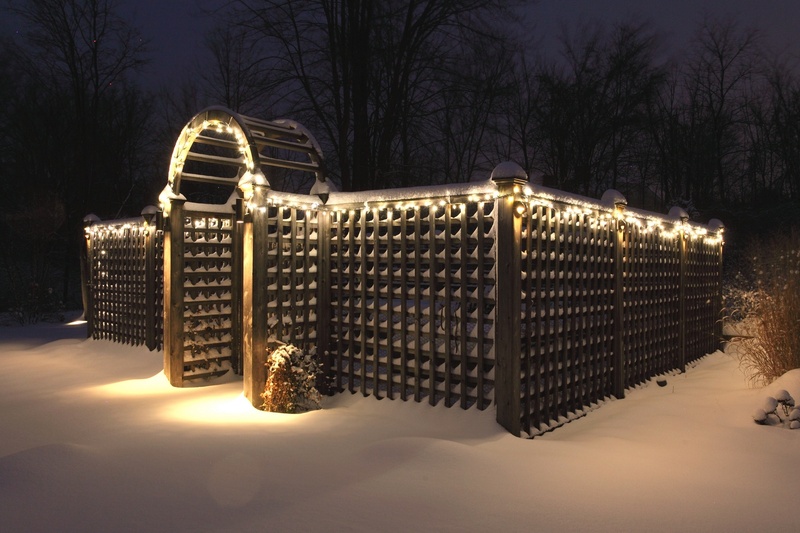 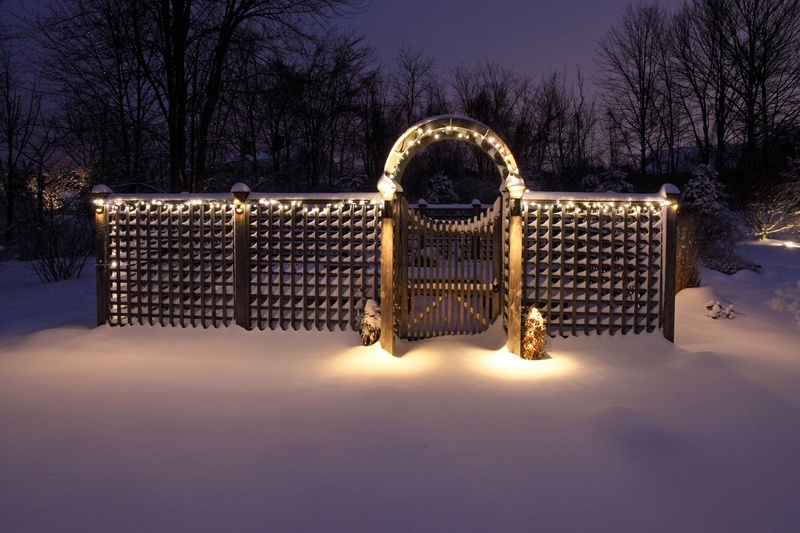 LED post and arbor lighting create drama at night and simple holiday light strings are added for the winter season. 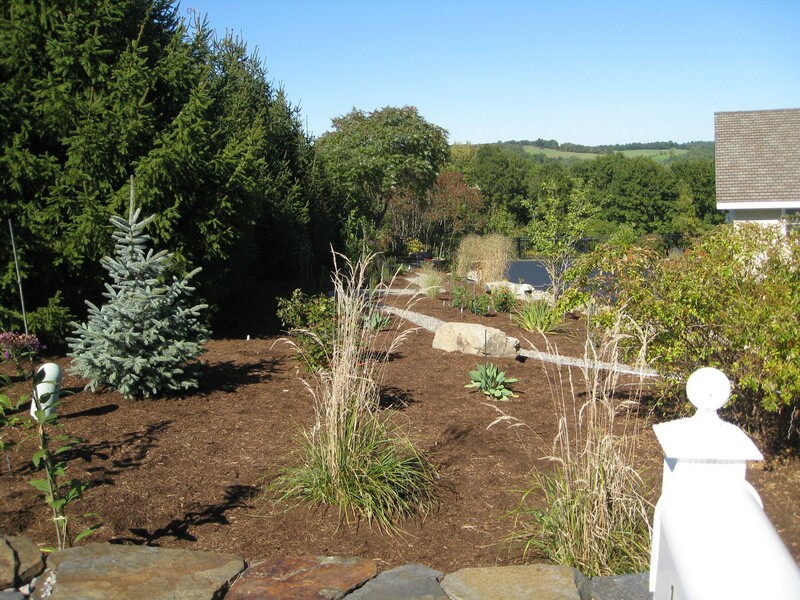 This landscape garden design in Averill Park, NY involved the renovation of an abandoned border garden viewed from the client’s office and screened porch. 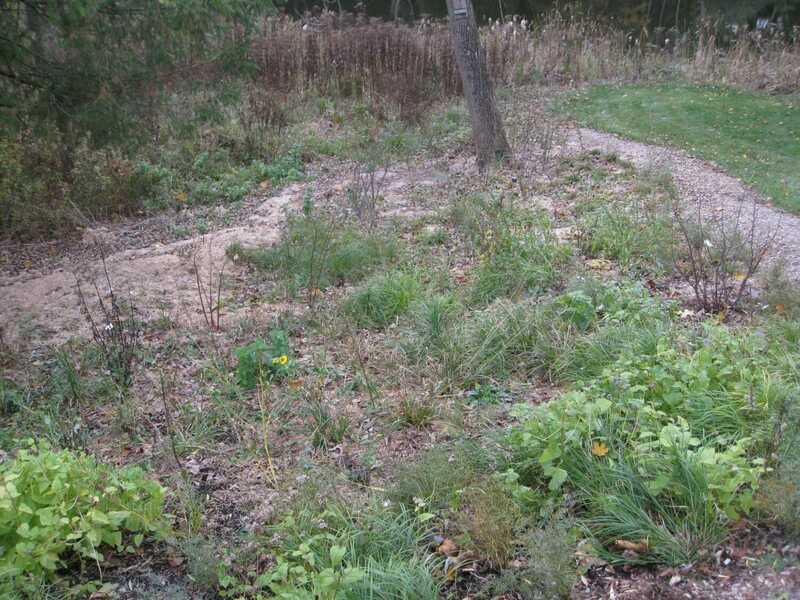 The area had to be completely stripped since wild raspberries had taken over. 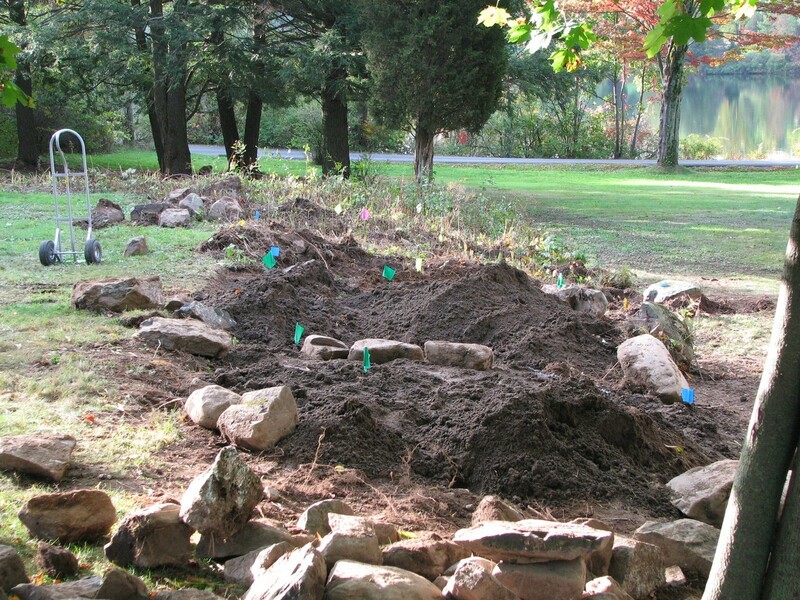 Numerous stones were found and reused. 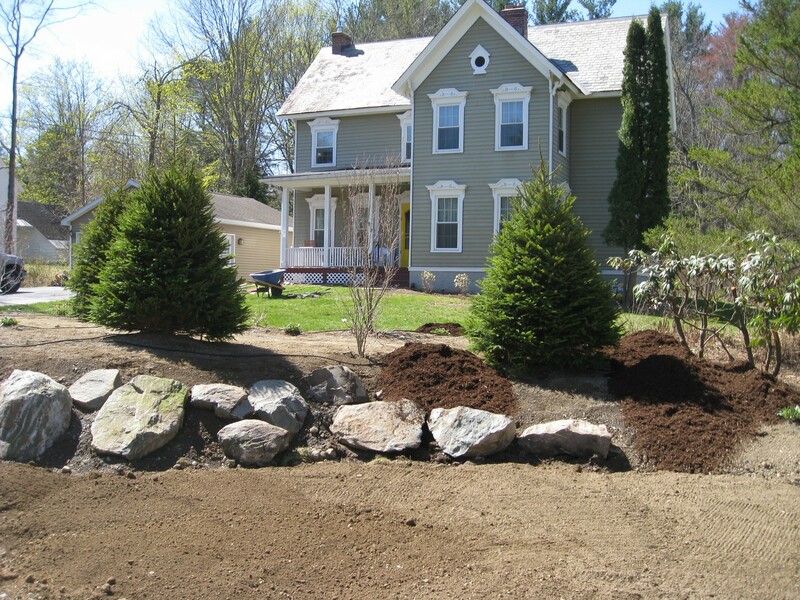 Several new boulders were brought in to add size variety. 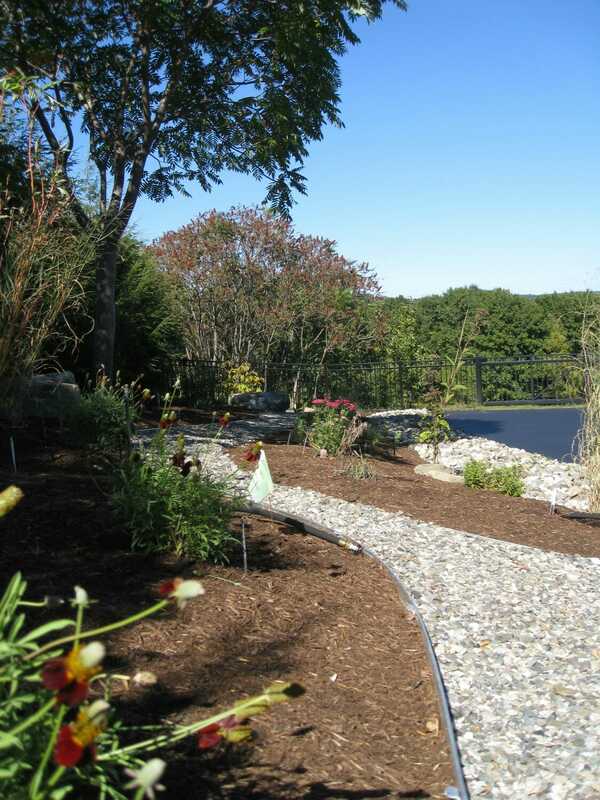 The planting focuses on providing constant color and interest for the summer months while the client enjoy the lake across the road. 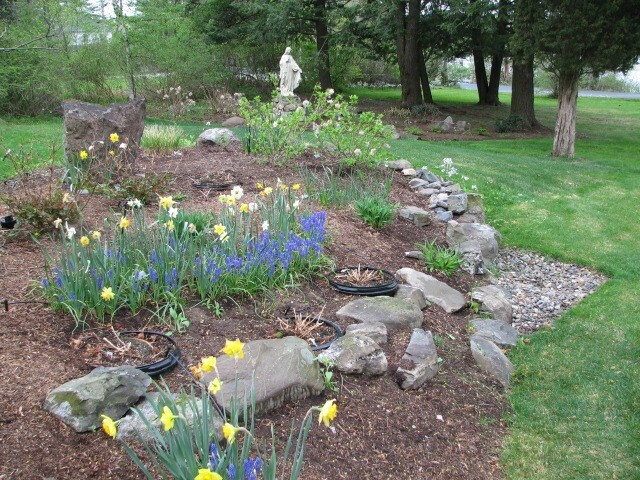 The show starts early with spring bulbs, transitions into summer perennials, and ends with hydrangeas and a massive Graziella ornamental grass. 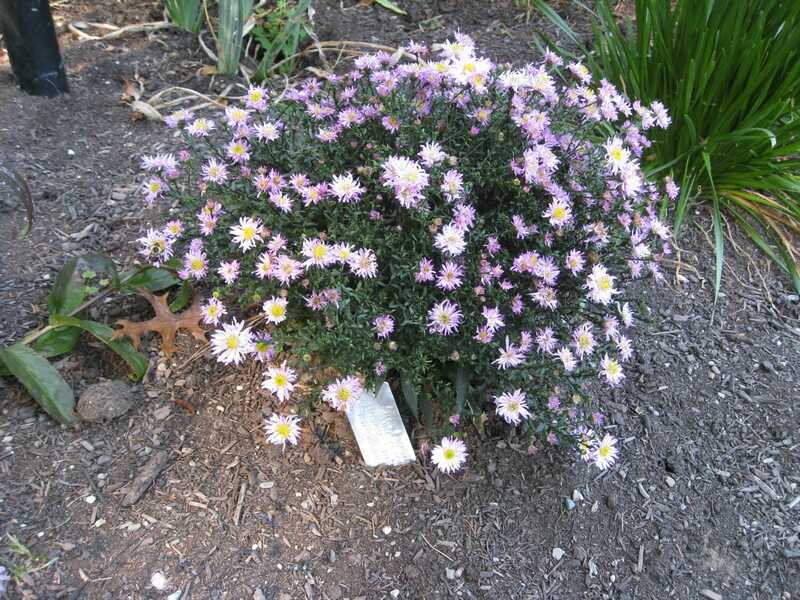 Annuals and then mums are inserted every year into buried pots to provide as much color as possible. 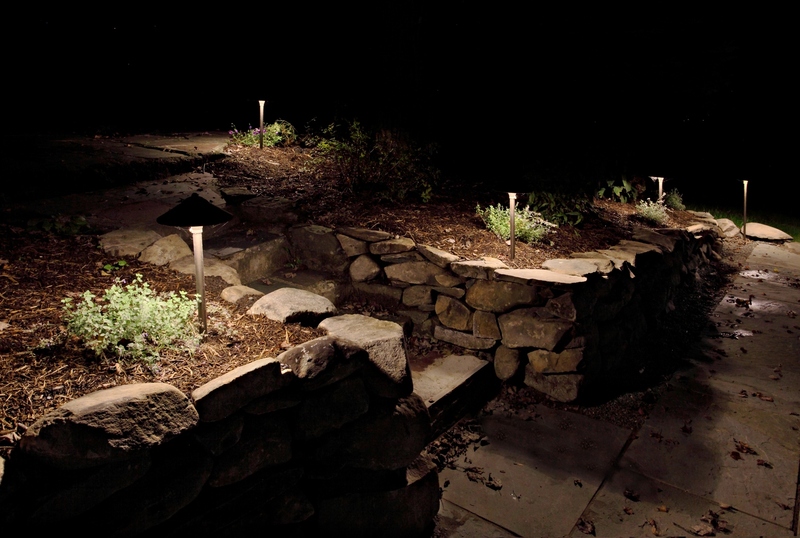 A drip irrigation system keeps the garden vibrant and lighting provides a dramatic night view of the garden and nearby Madonna grotto. 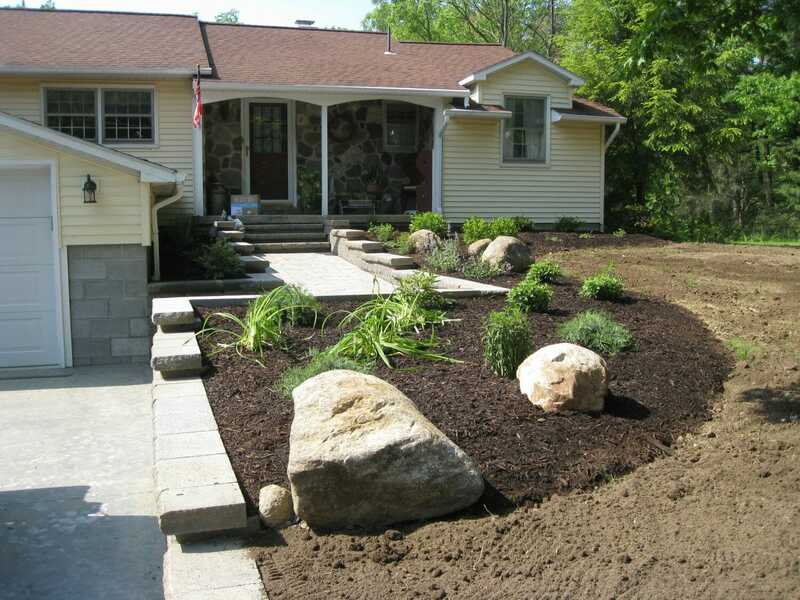 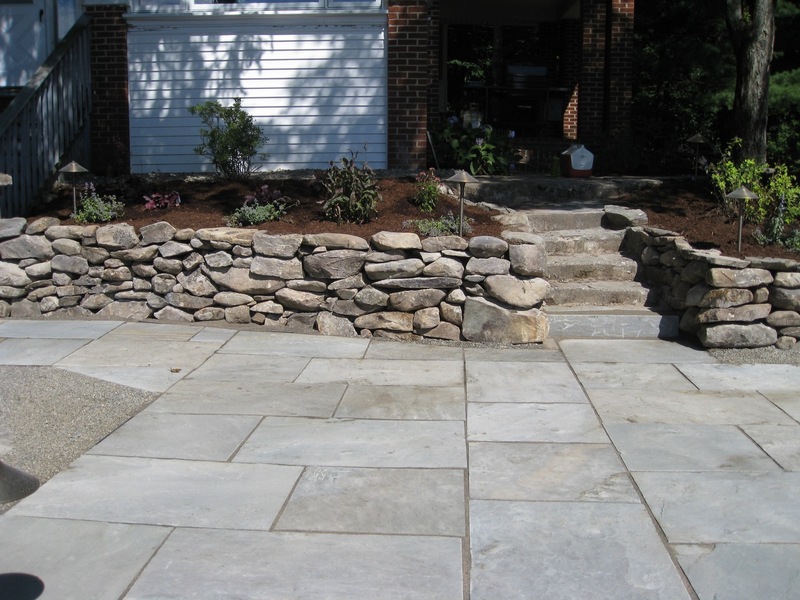 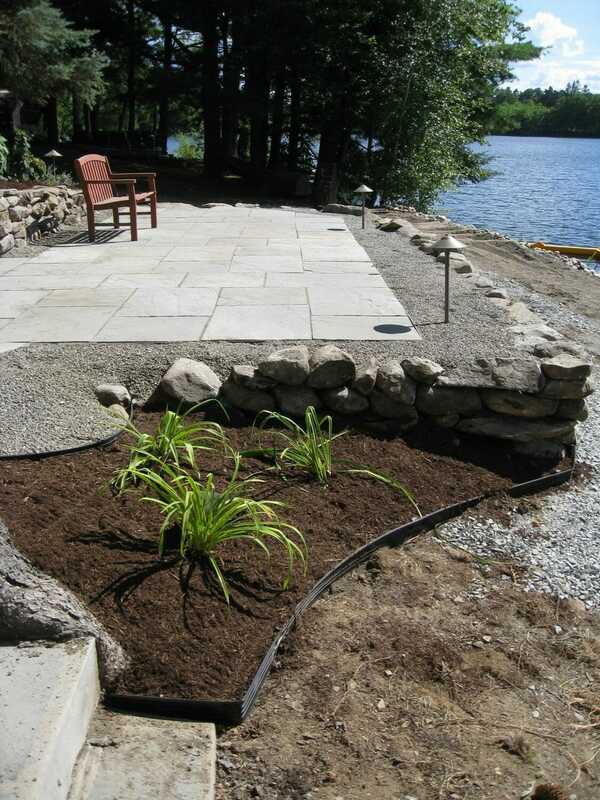 This landscape design project featuring bluestone was for a historic home on Crystal Lake in Averill Park, Ny (Rensselaer County). 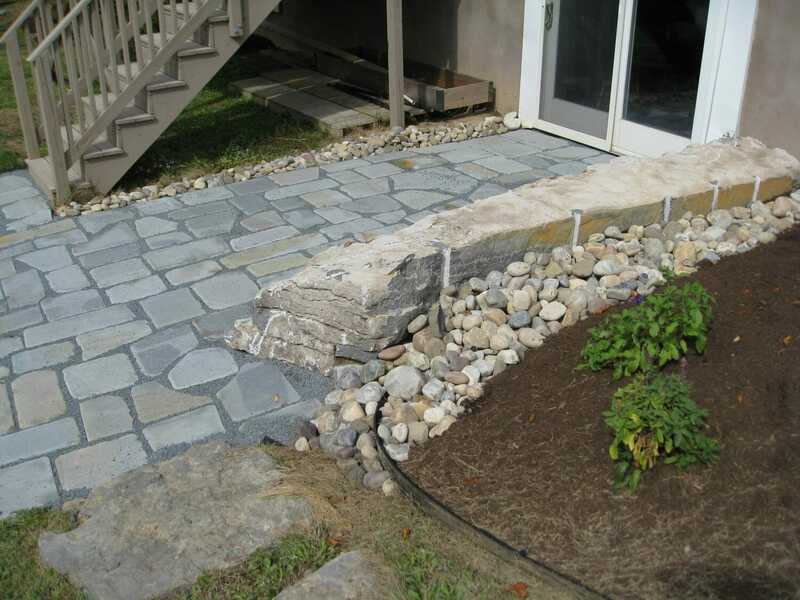 This entry was the primary for both the clients and guests so a courtyard area that allowed entry into the home or onto the screened porch was developed. 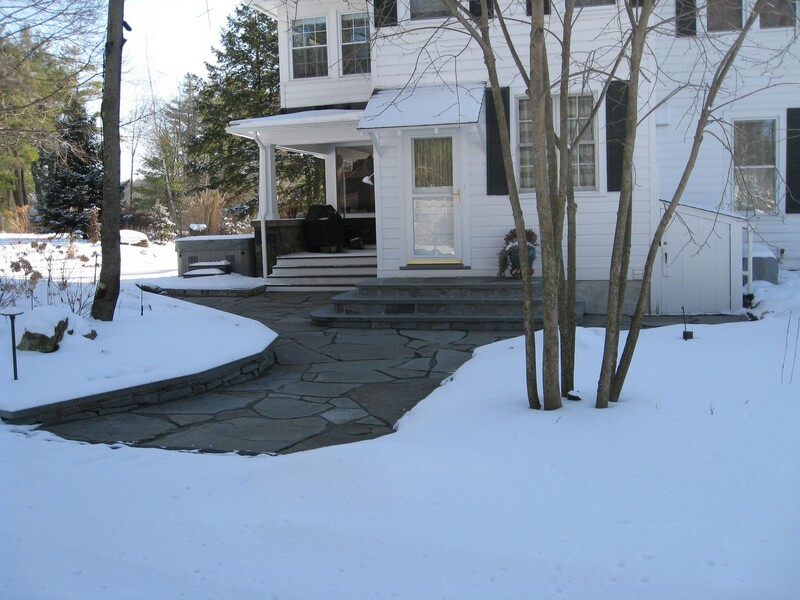 The clients had an existing radiant heat system and a zone was extended under the bluestone walk to keep it snow free in the winter. 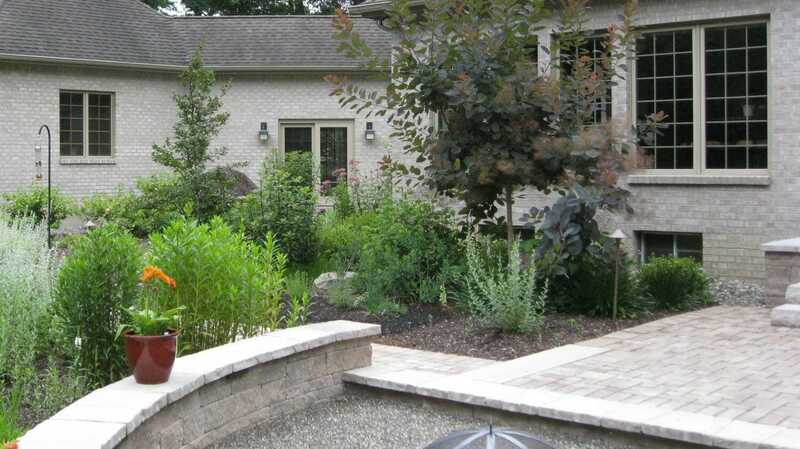 Low walls on either side form planting beds around existing trees and blend into the natural site. 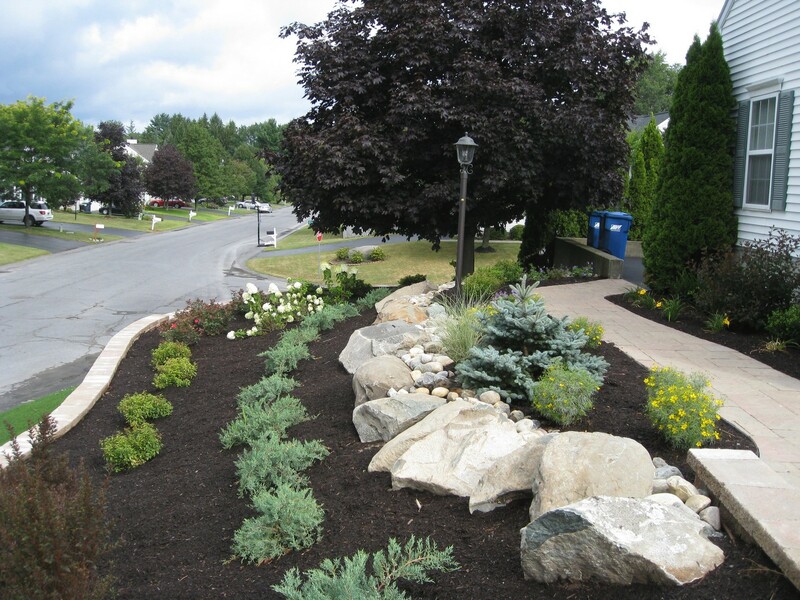 Colorful but natural plantings surround you as you approach. 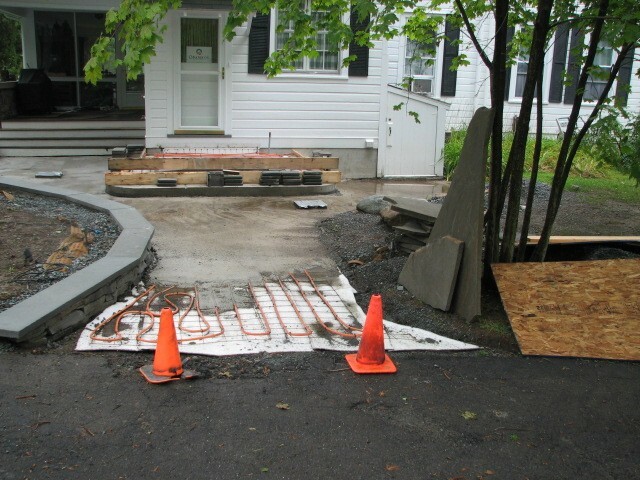 LED lighting under the steps and wall caps safety and direct guests to the entry. 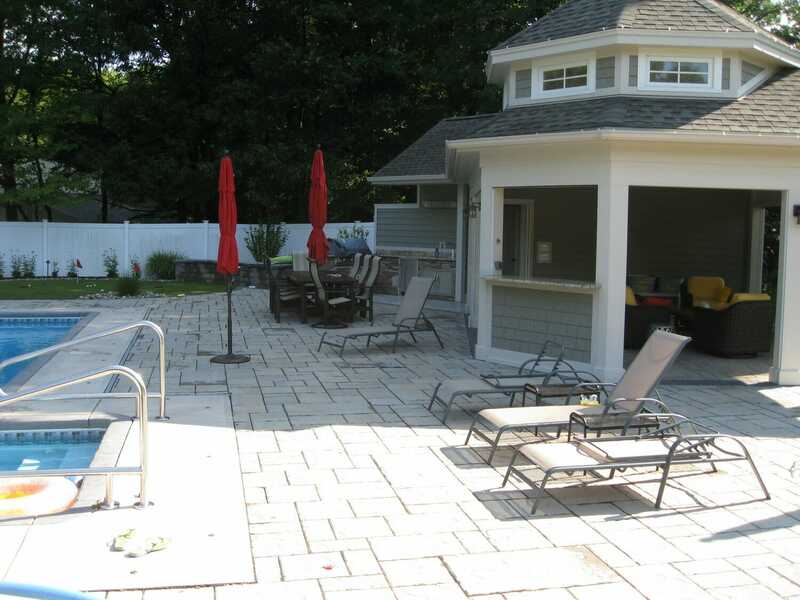 The clients had an existing pool and needed to add a seating area, steps and walkway. 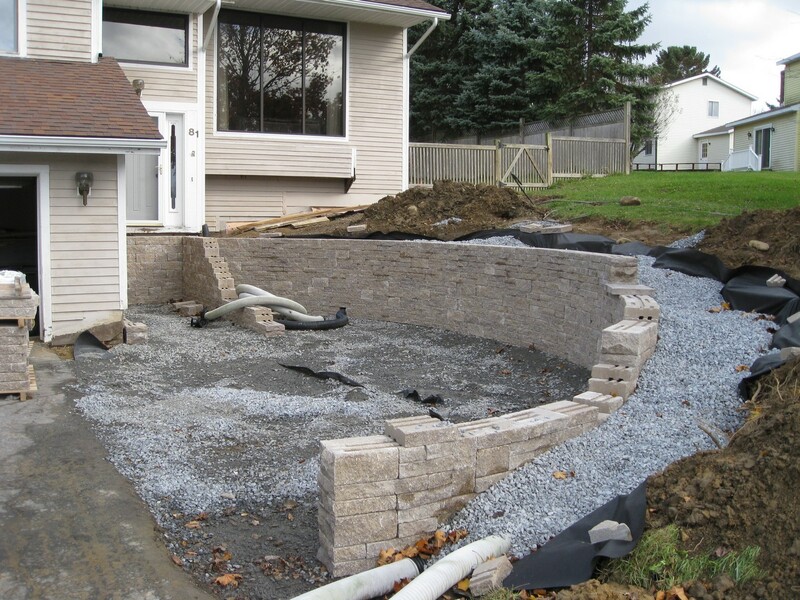 The area on one side of the pool was sloped and had to be retained with a wall. 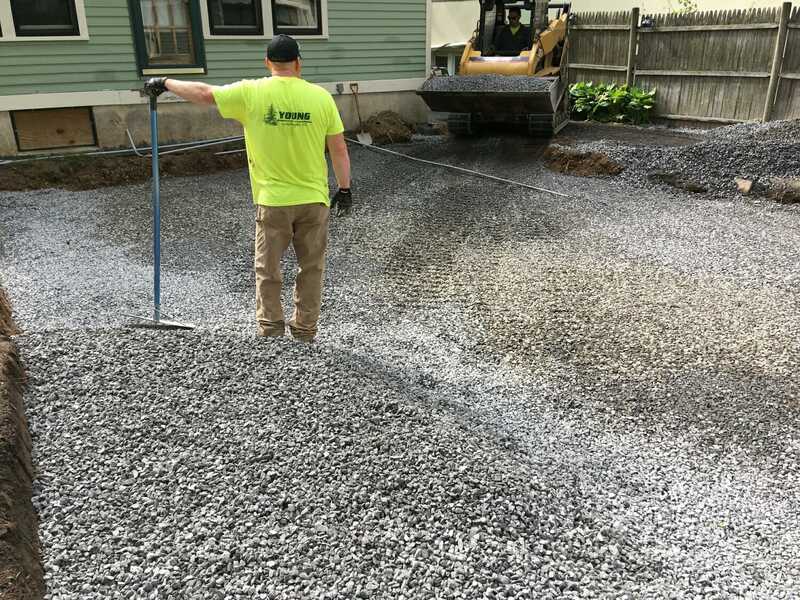 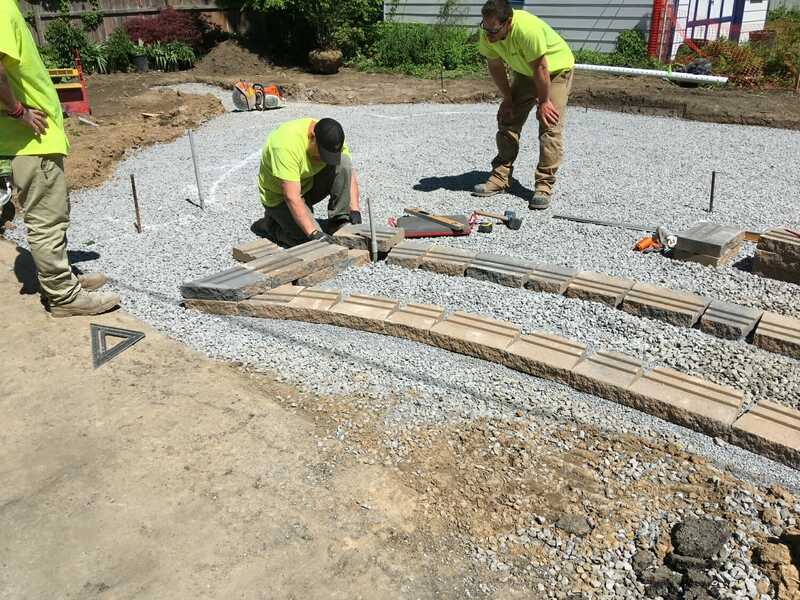 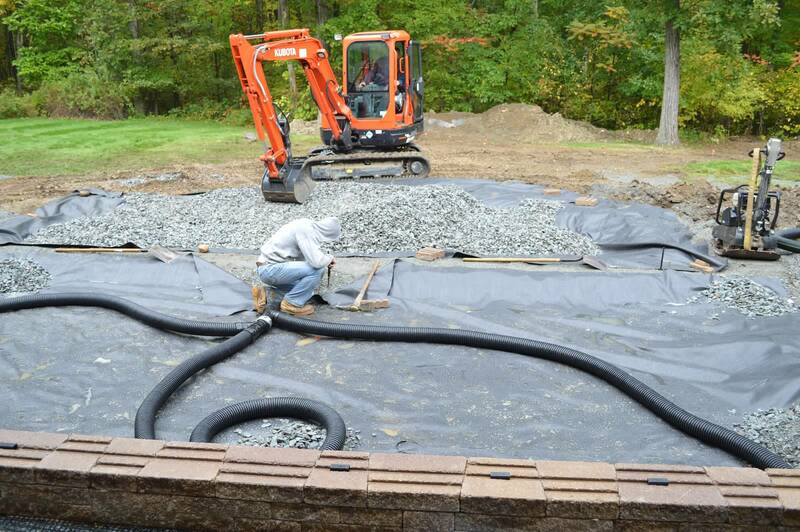 Since the pool is relatively close to the house permeable pavers will ermit the pavers to go up against the house without water infiltration worries. 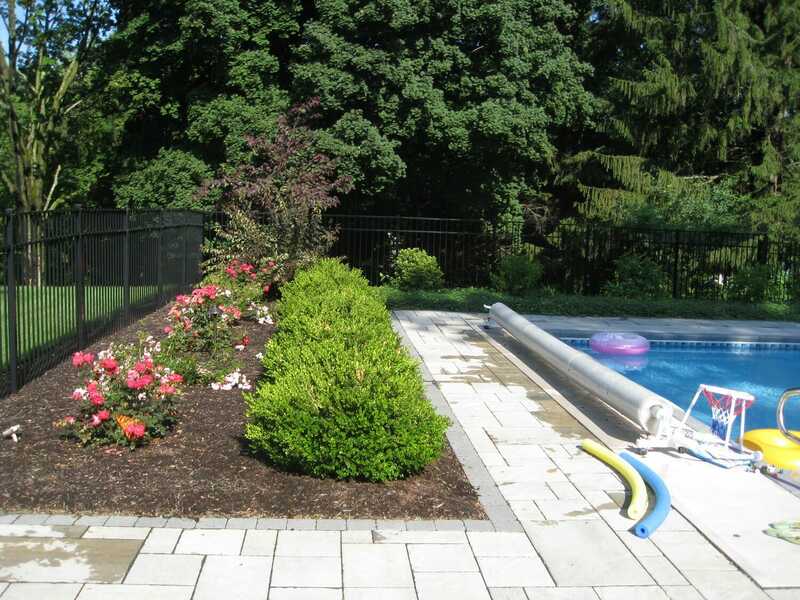 A woodland style planting stretches along the back of the property to screen the house and pool while colorful plantings screen and brighten the inner yard. 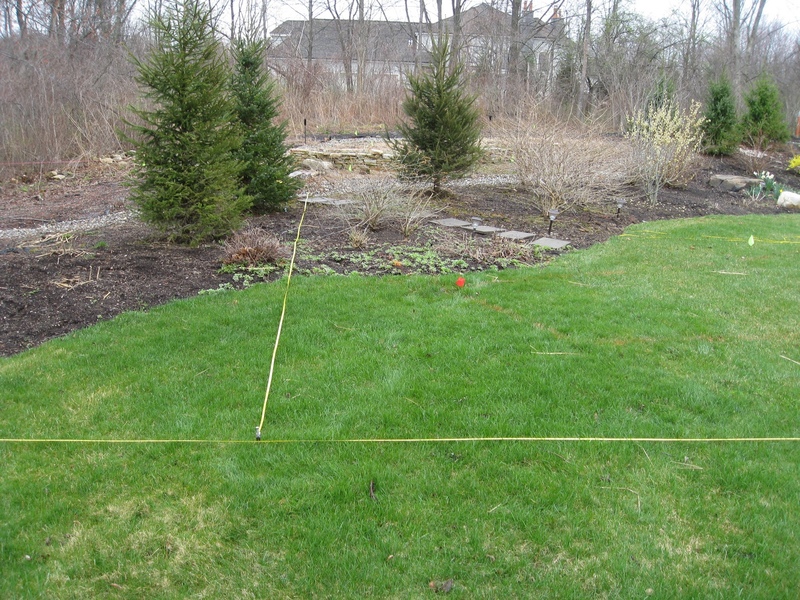 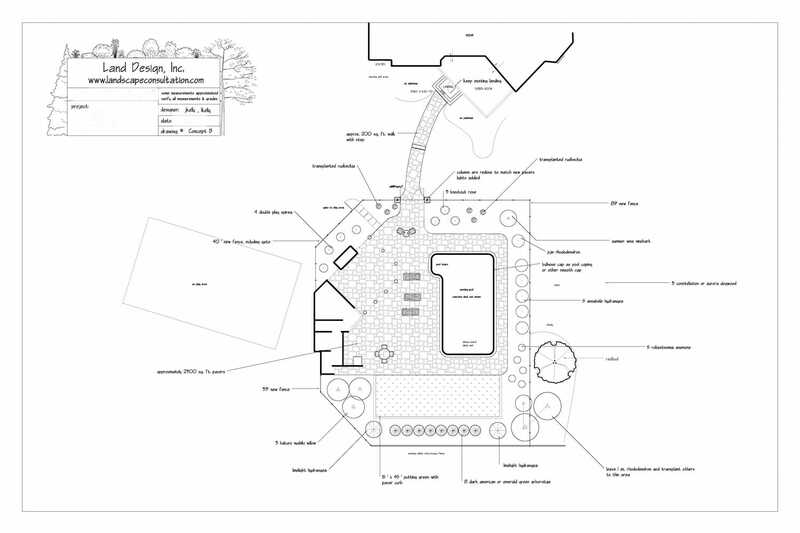 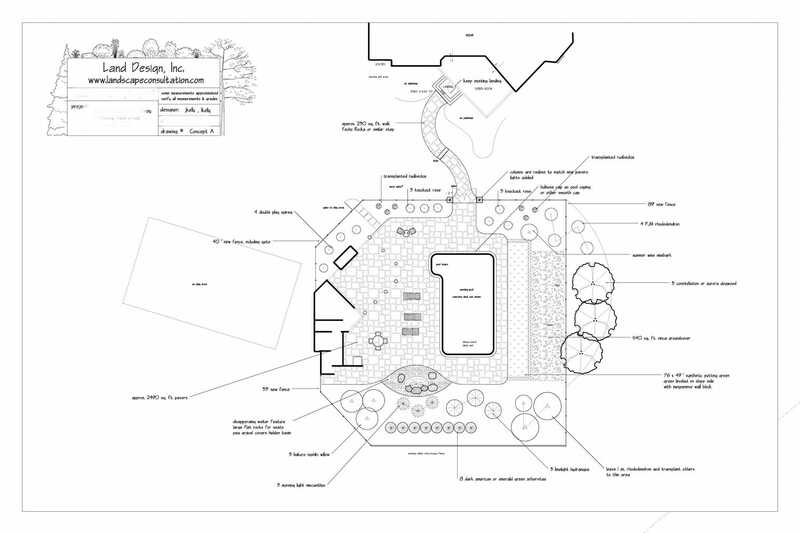 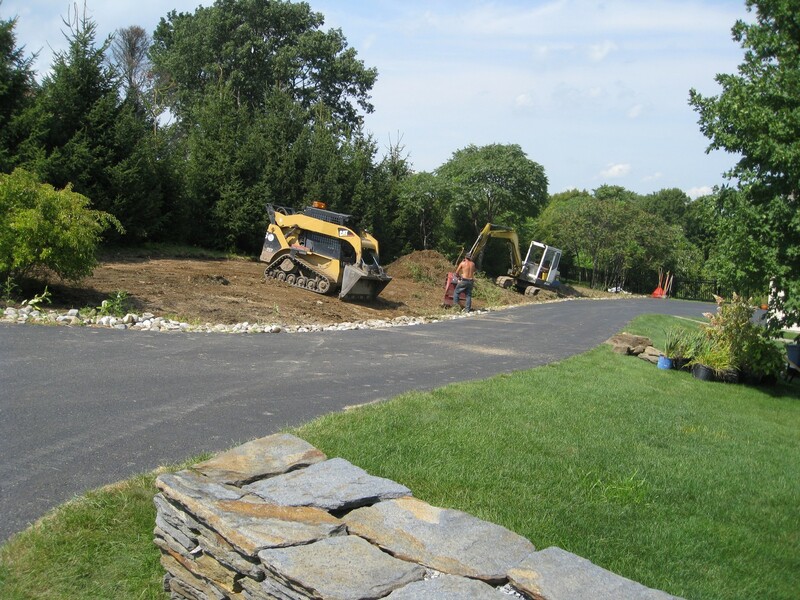 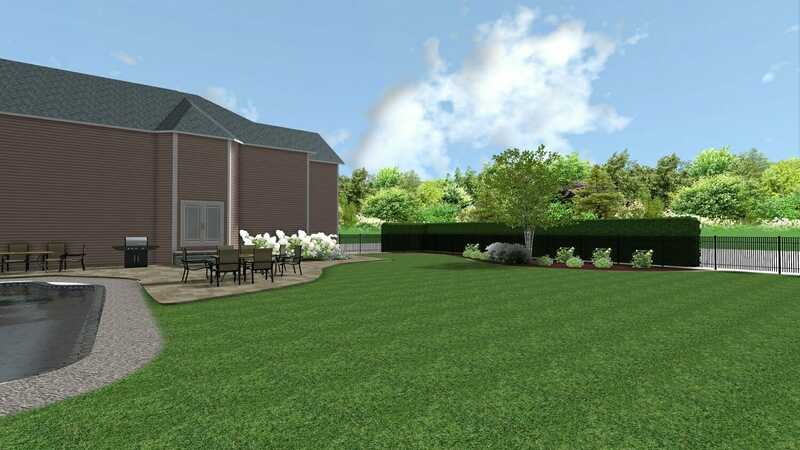 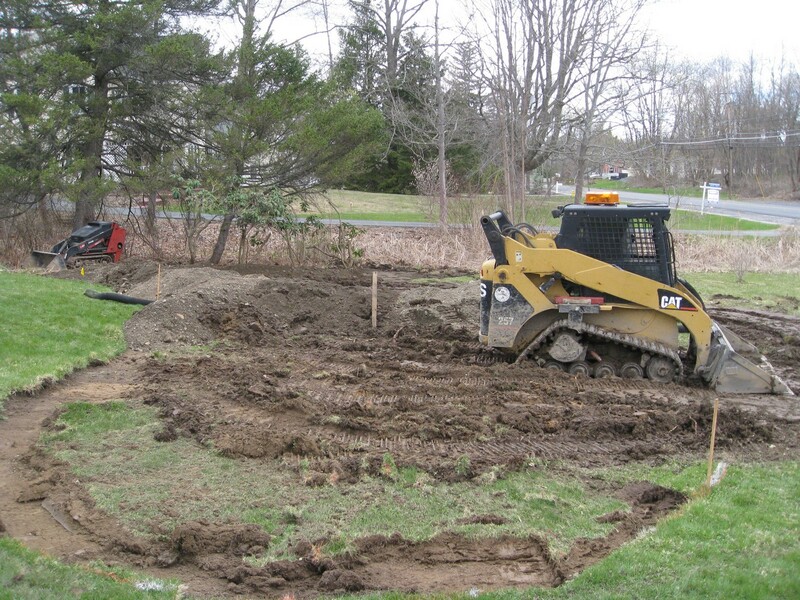 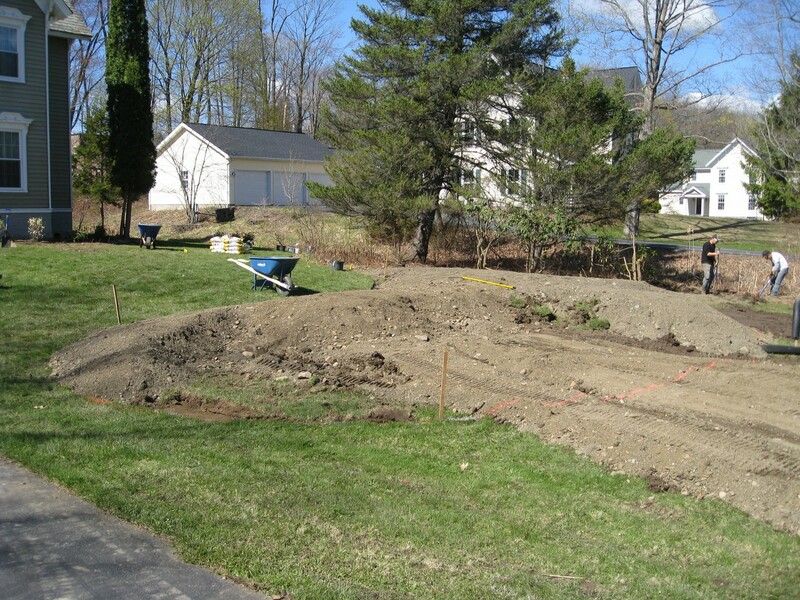 This project is the first phase of a master landscape plan we created for this historic home in Delmar, NY. 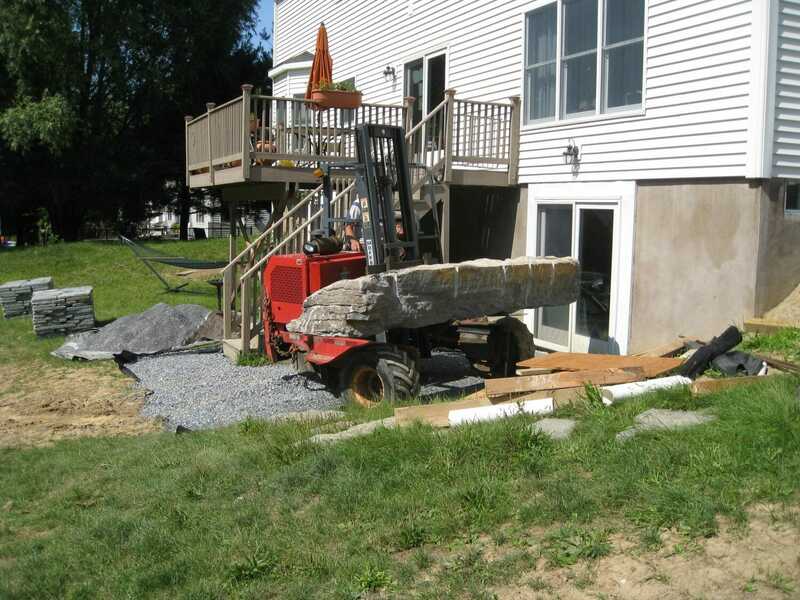 Its location near a busy, noisy road left the owners feeling they were in the street every time they opened their front door. 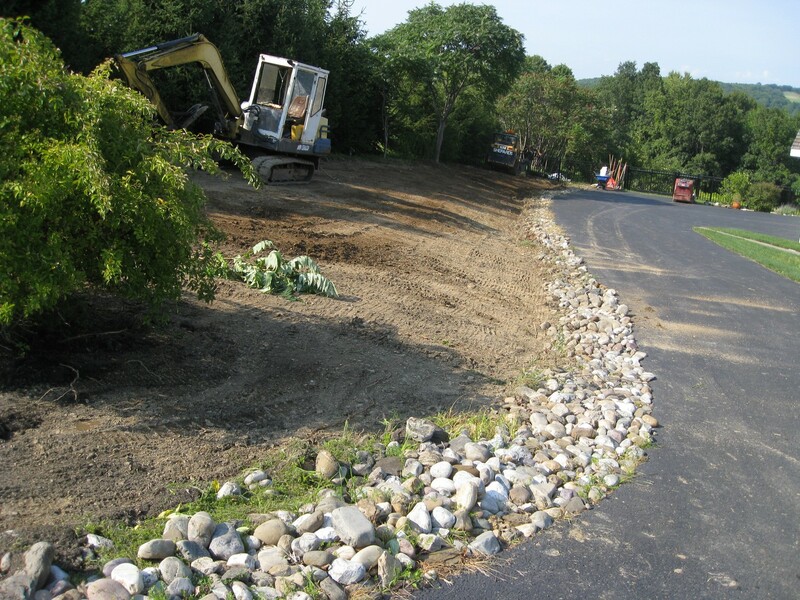 The road level is 3' lower than the elevation of their driveway near the house so we created a natural looking berm over 3' high to visually enclose the front yard. 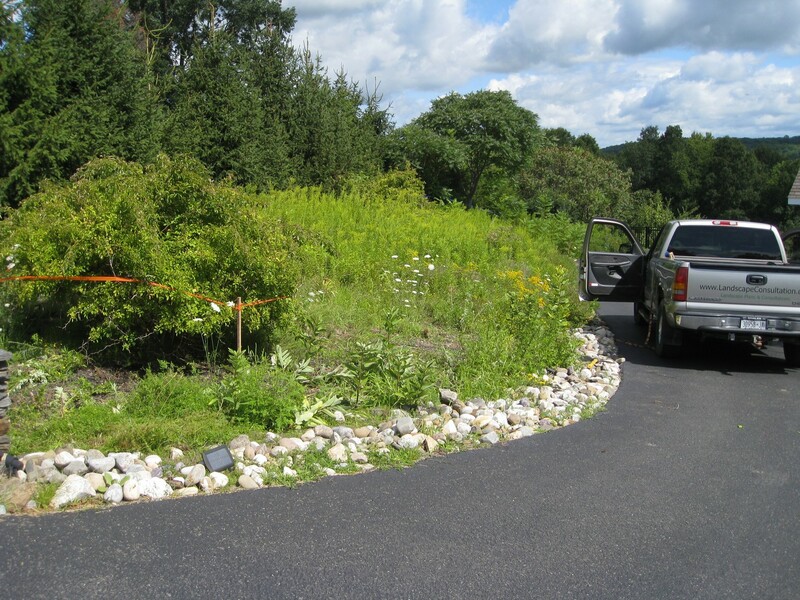 So often berms are constructed too narrow for their height so we made sure it was proportional and seamlessly integrated into the wild areas along their property lines. 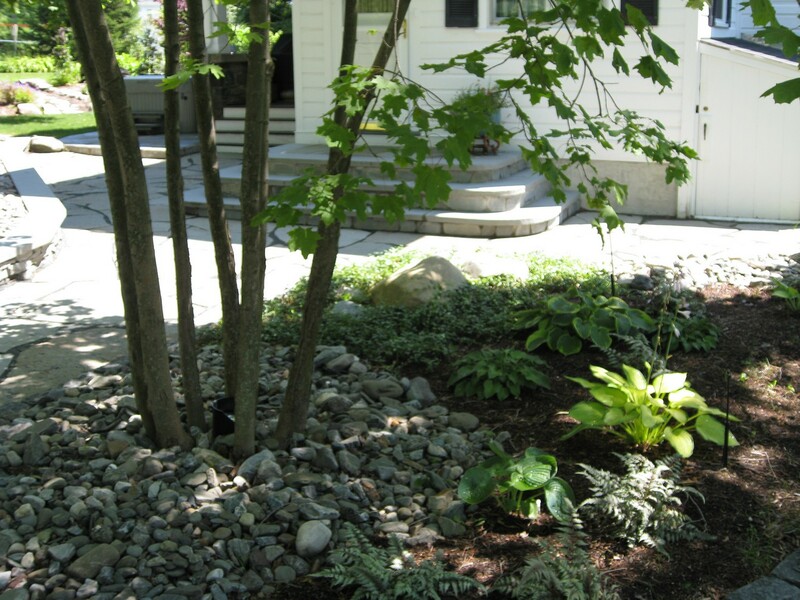 Evergreen and flowering trees will grow and form a barrier in time; responsible landscape design spaces plants far enough apart to allow them to exist together as they mature. 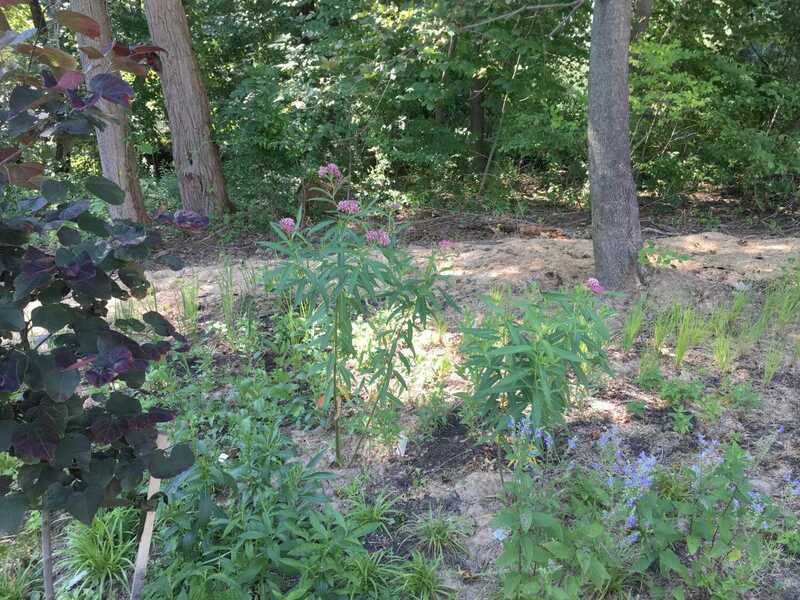 To take up the empty space between the major trees we planted dozens of native perennials which attract butterflies, pollinators, and other wildlife. 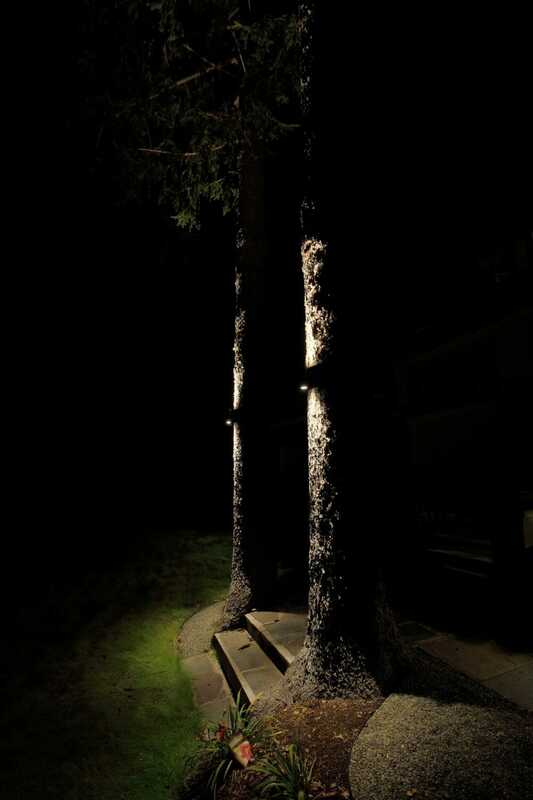 These can easily be removed as space dictates as the trees grow. 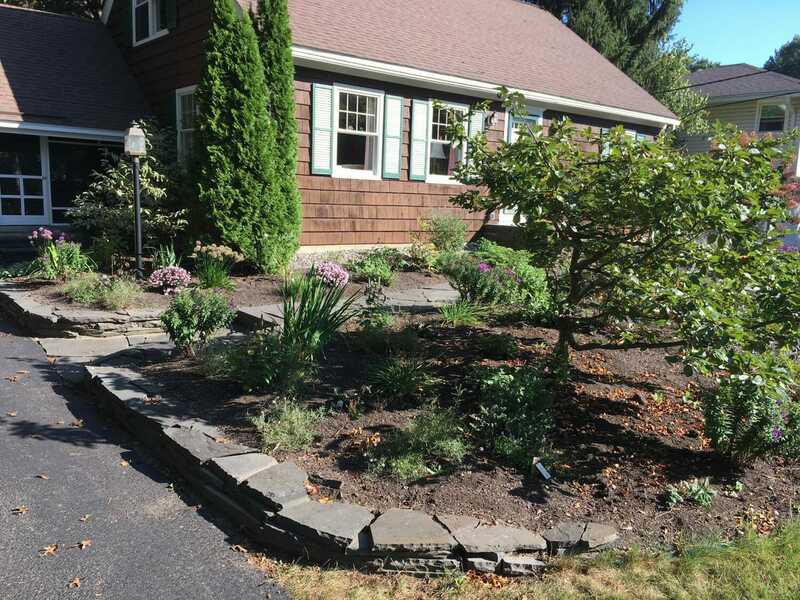 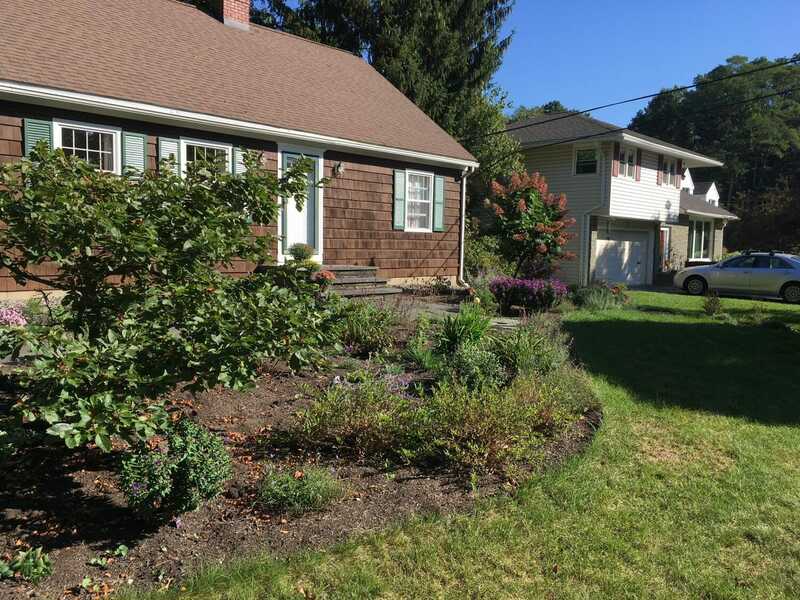 We transplanted the 50+year old rhododendron that were blocking the front windows of the home and a hydrangea tree clinging to life in the lower yard. 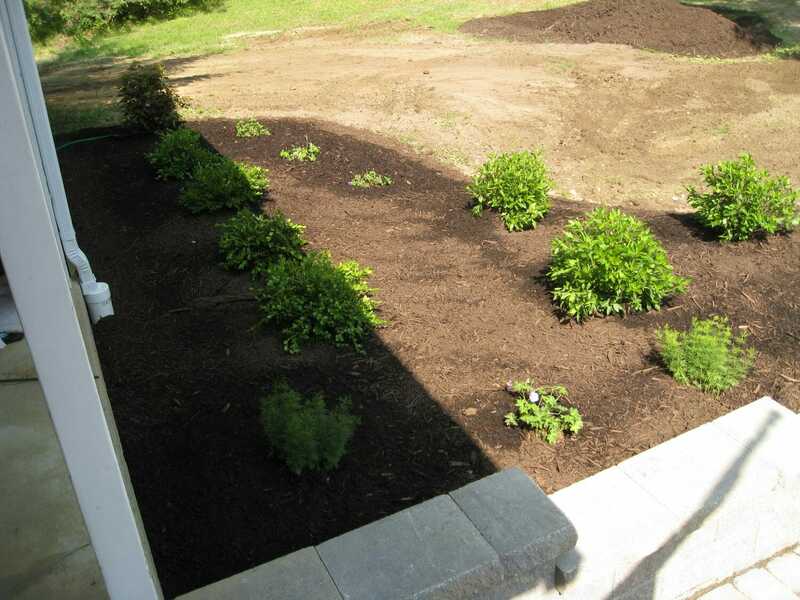 The micorrhizzal fertilizer we use on all plantings reduces transplant shock and ensures establishment. 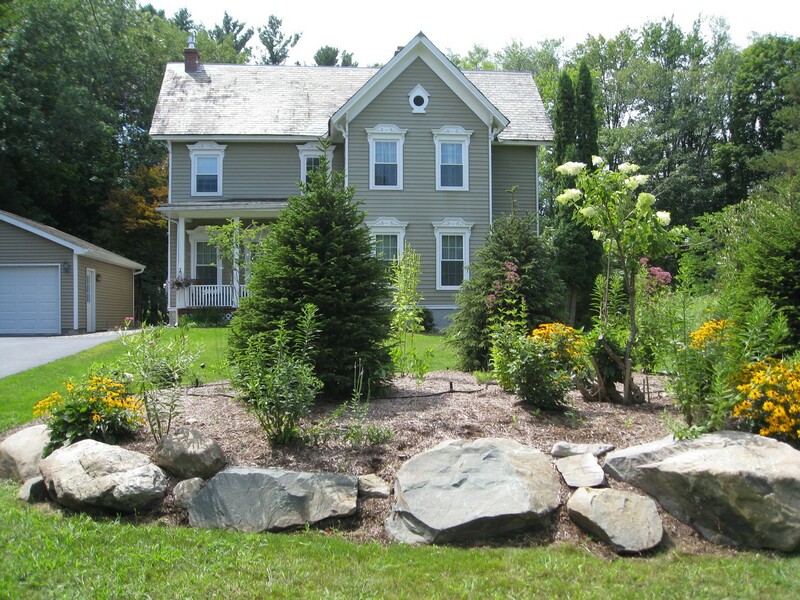 Developing a long term landscape plan for your yard allows you to budget and develop your yard without having to redo and correct mistakes. 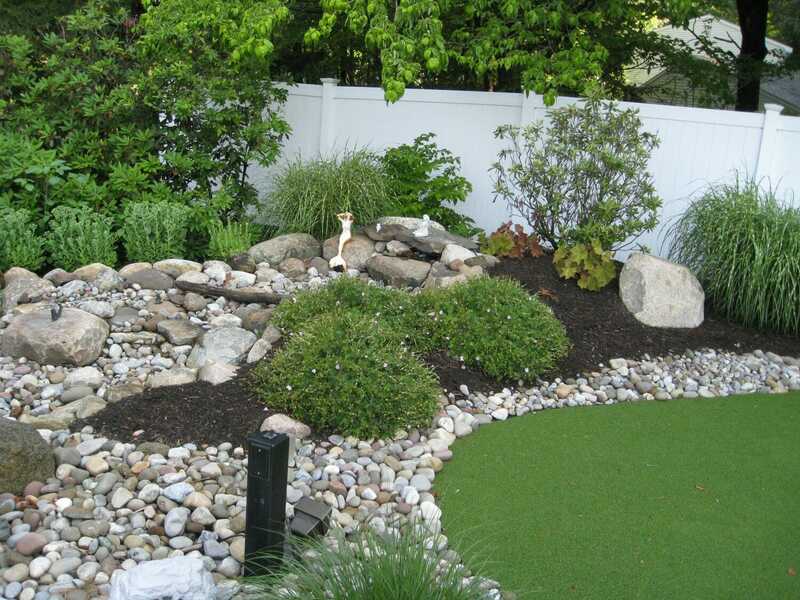 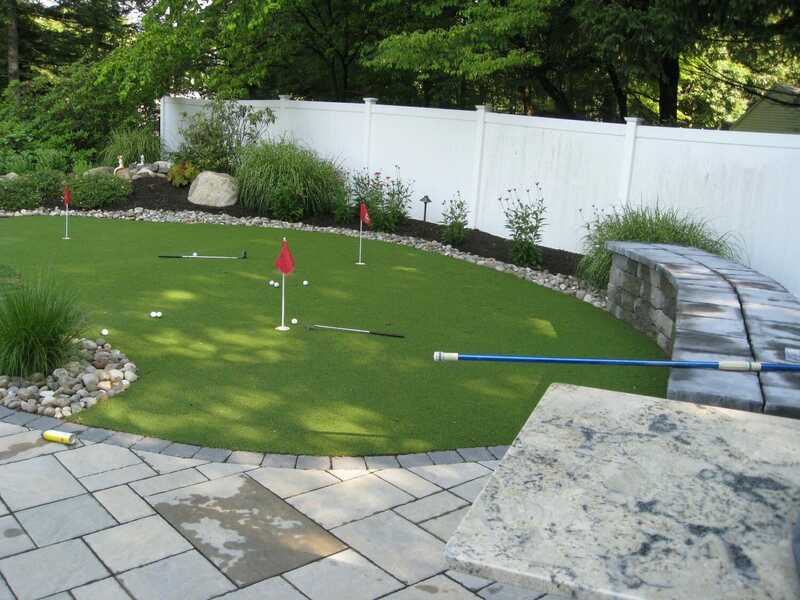 Everyone has a different priority list for their yards – our plans are custom created to your wish list. 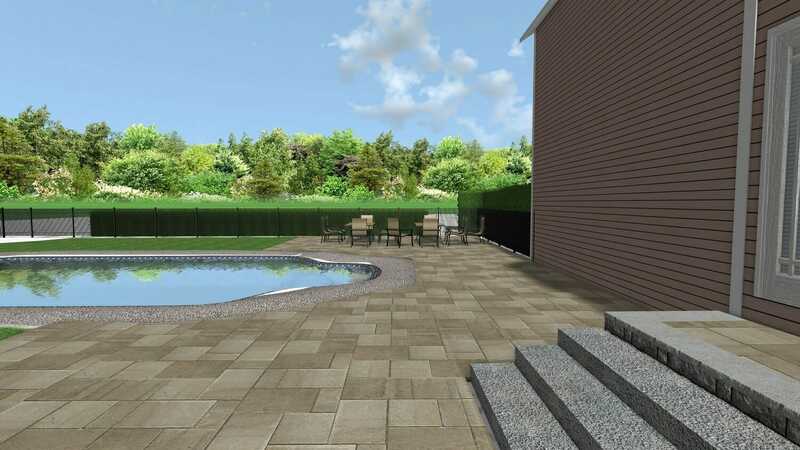 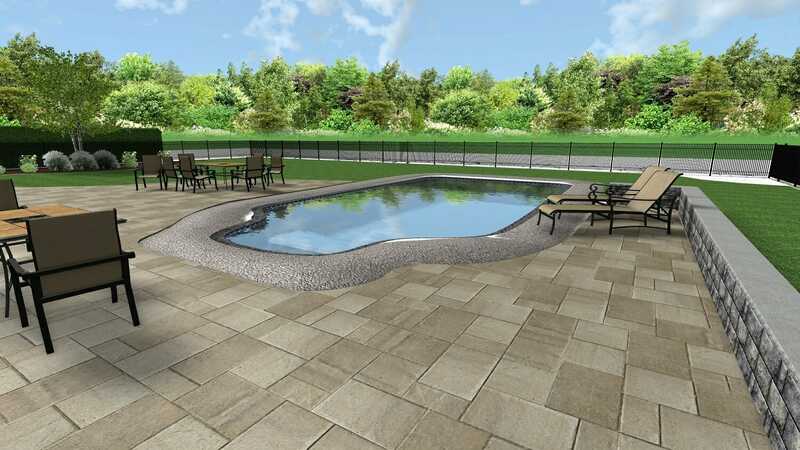 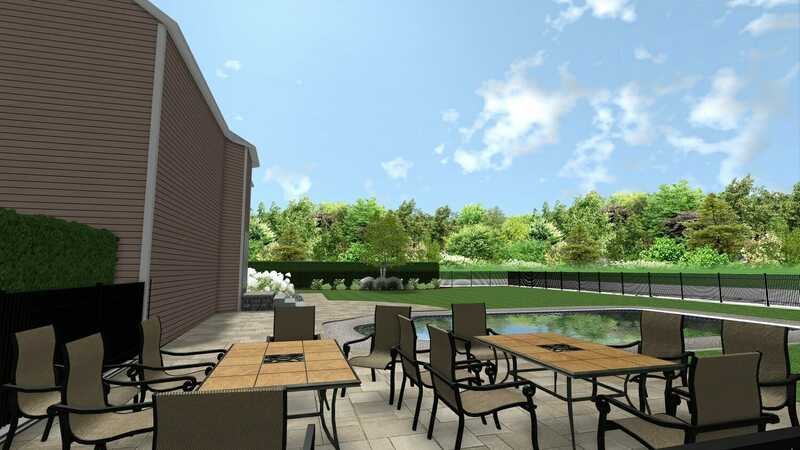 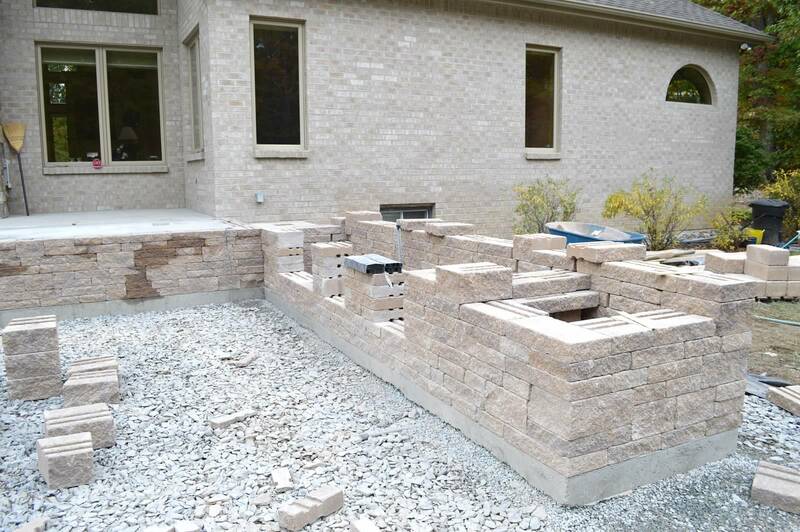 Elements we in our plans include privacy barriers, outdoor kitchens, water features, decks, patios, pools, hot tubs, landscape lighting, and of course, plantings! 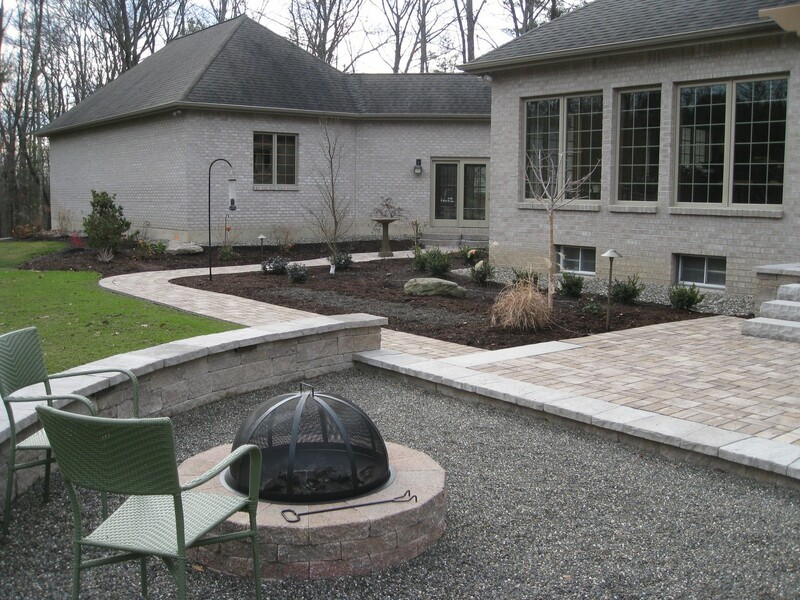 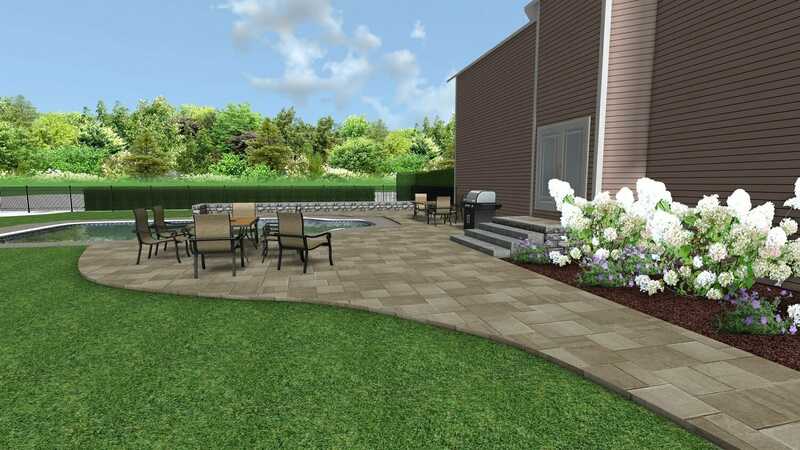 Back yard patio designs are our specialty; we love to do ABC landscape design packages where we create 3 concepts of different backyard design ideas to show you as many possibilities as possible. 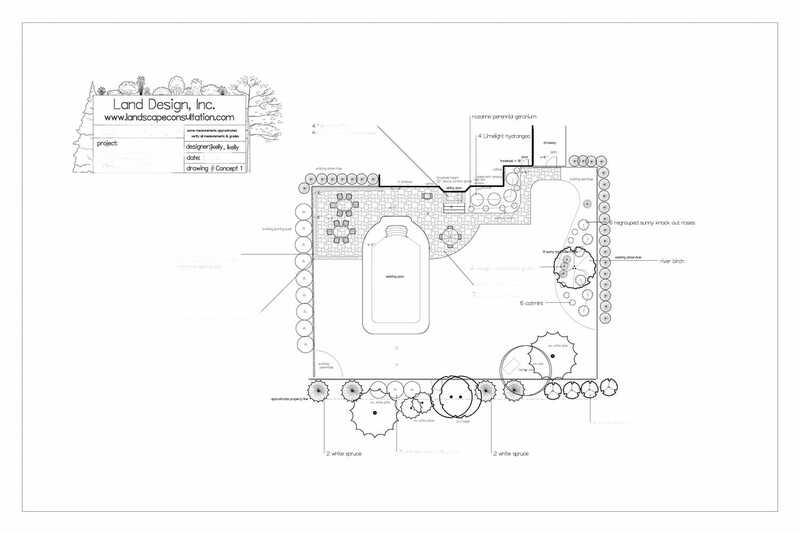 Typically one of these will click with you and perhaps the final plan incorporates a few elements of the other 2 landscape plans. 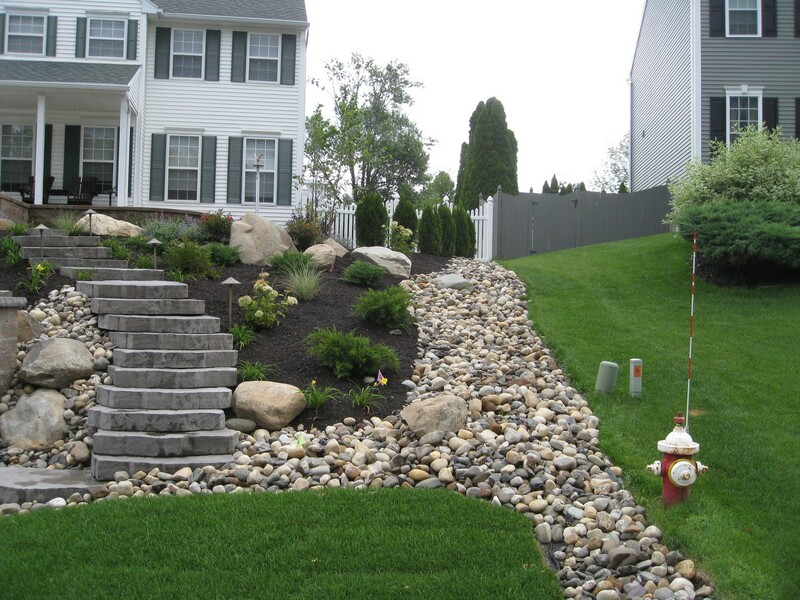 Low maintenance landscaping is always a bonus when planning your landscape. 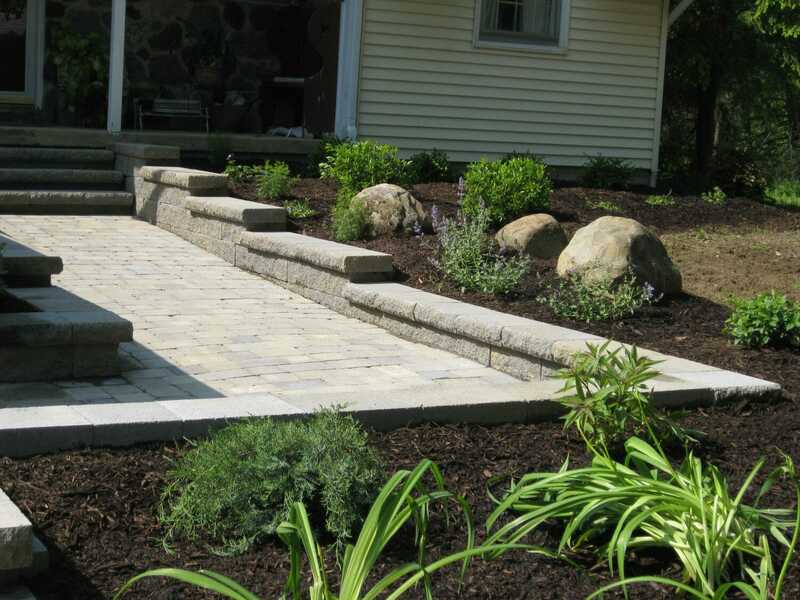 Using the right plant in the right place, using proven plant varieties, and using lower maintenance materials for patios contribute to an easy care landscape. 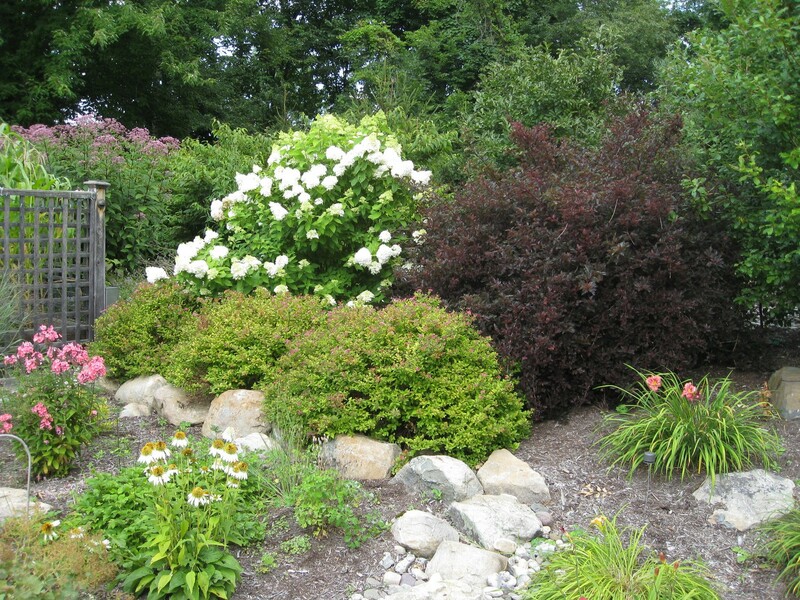 Native and native-derived plants are often good solutions for low maintenance settings. 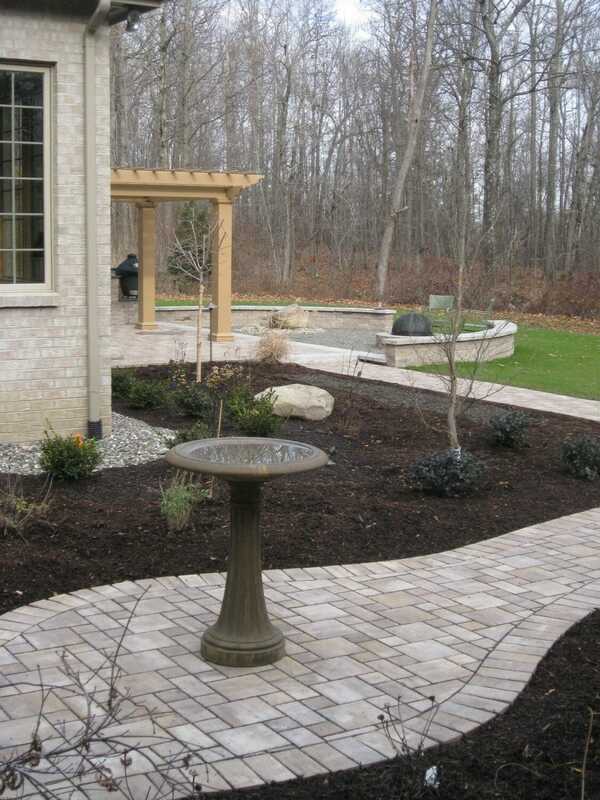 What does the term “hardscape design” mean in landscape plans? 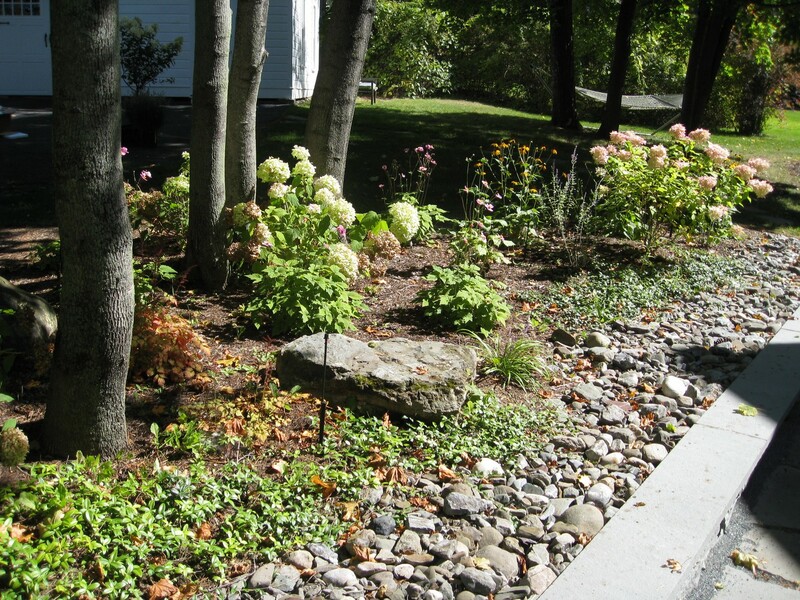 We refer to the non living parts of our landscapes as “hardscapes”. 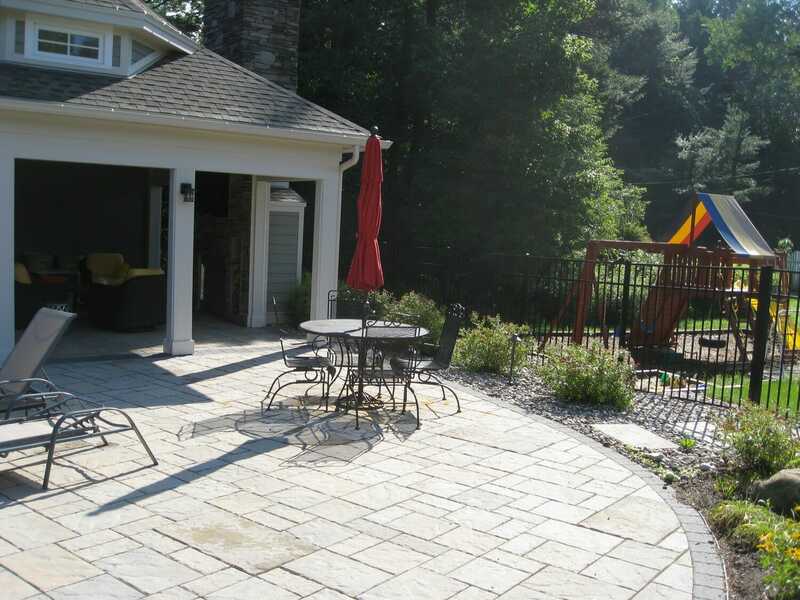 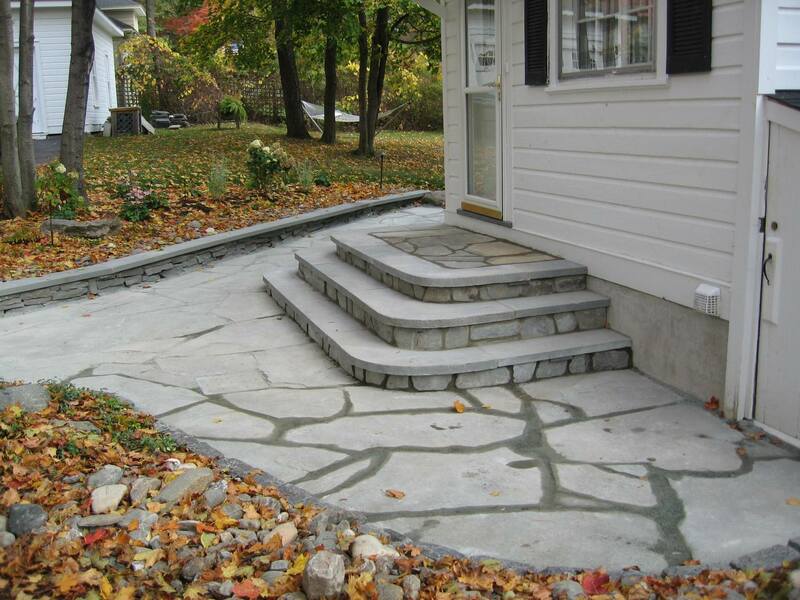 Walkways, retaining walls, decks, patios; they are the floors and furniture of our outdoor rooms. 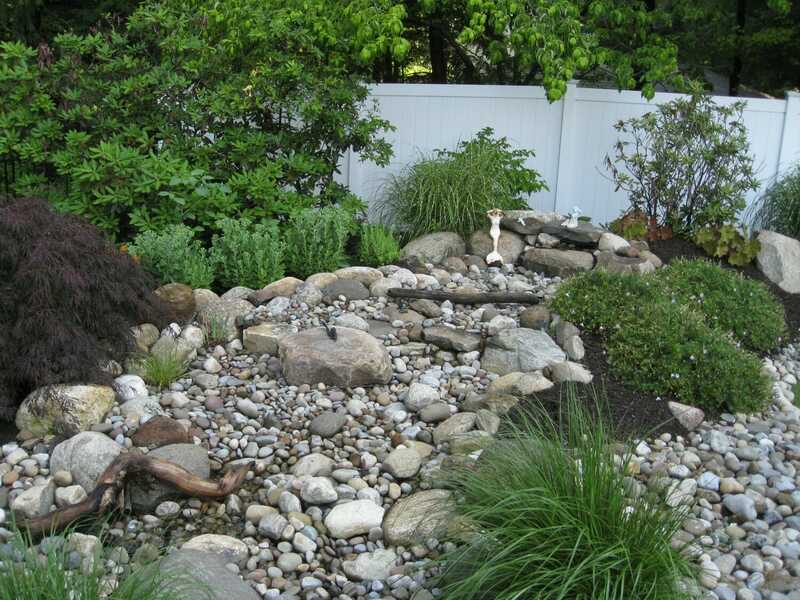 They can be made of natural or man made products. 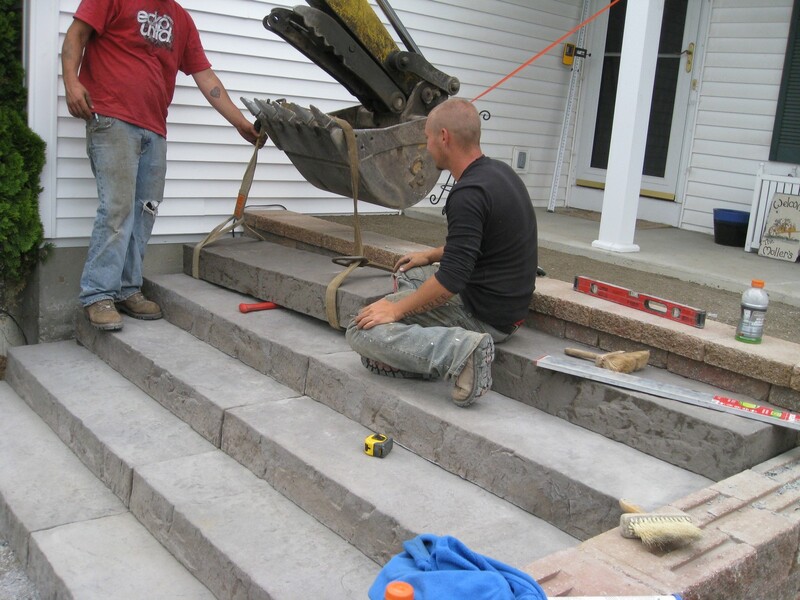 Decks typically now use composite decking with pressure treated structure. 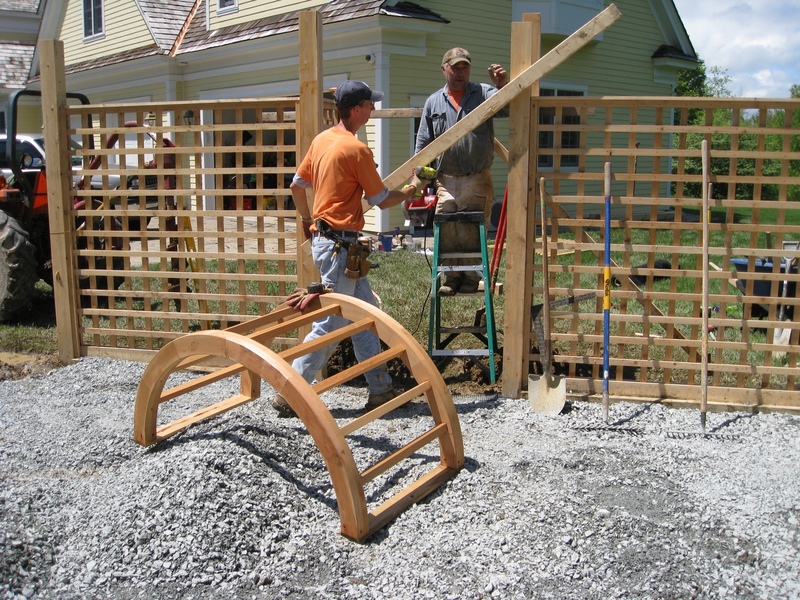 Pergolas (shade structures) are available in natural or composite materials also. 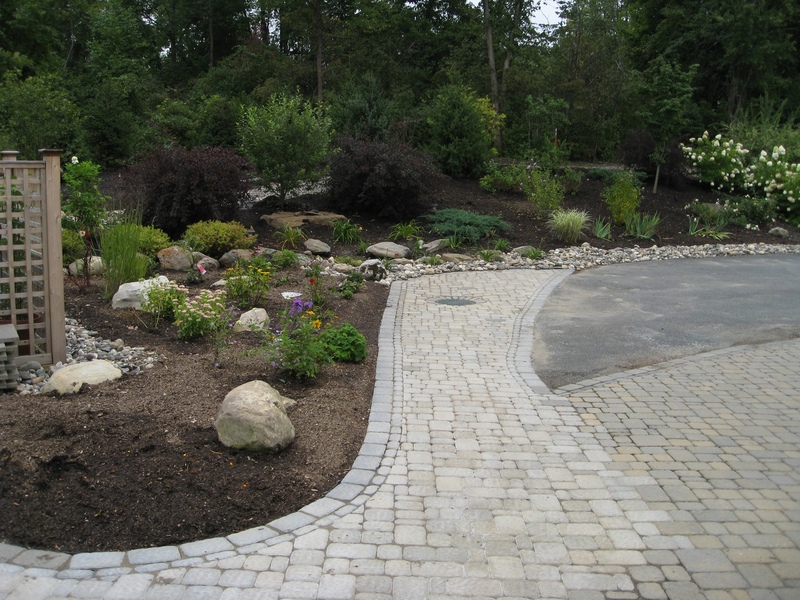 Combined with the “softscape”, the plantings, they make our yards safe, attractive, and functional. 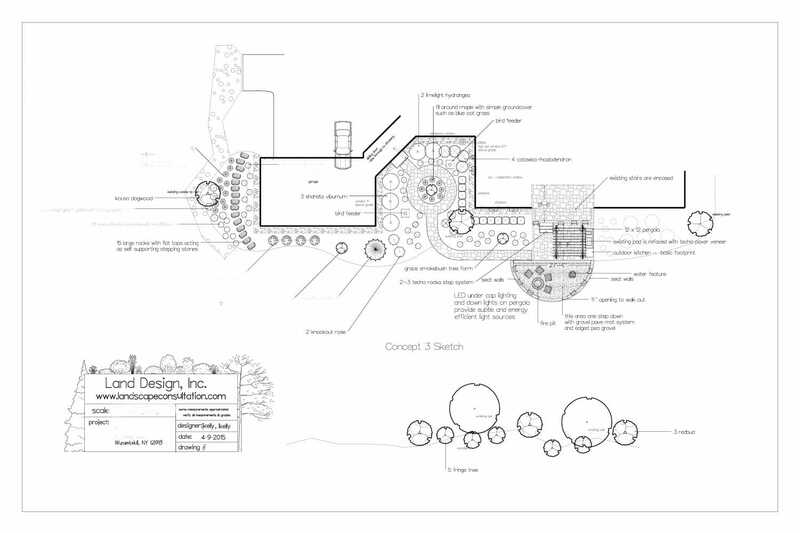 Sometimes in a landscape design the stars are the plants themselves. 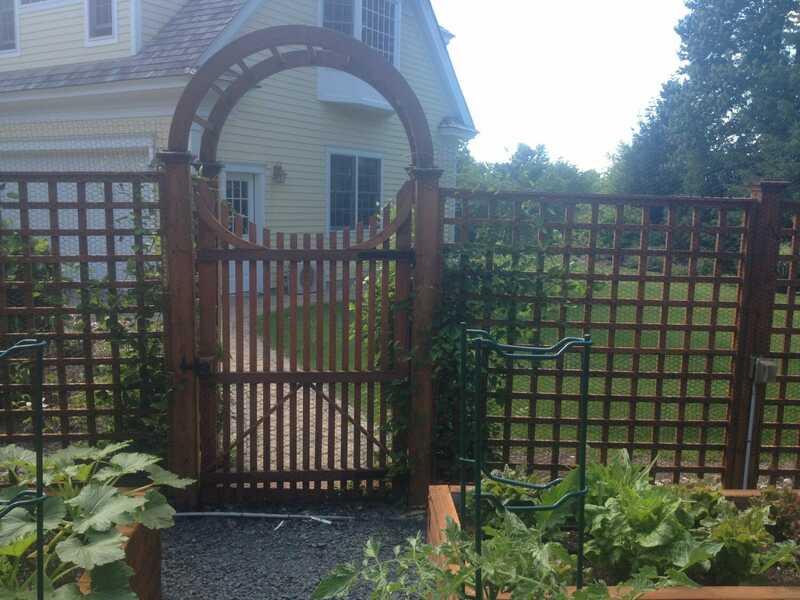 Here in the United States we often refer to vegetable gardens as “gardens”. 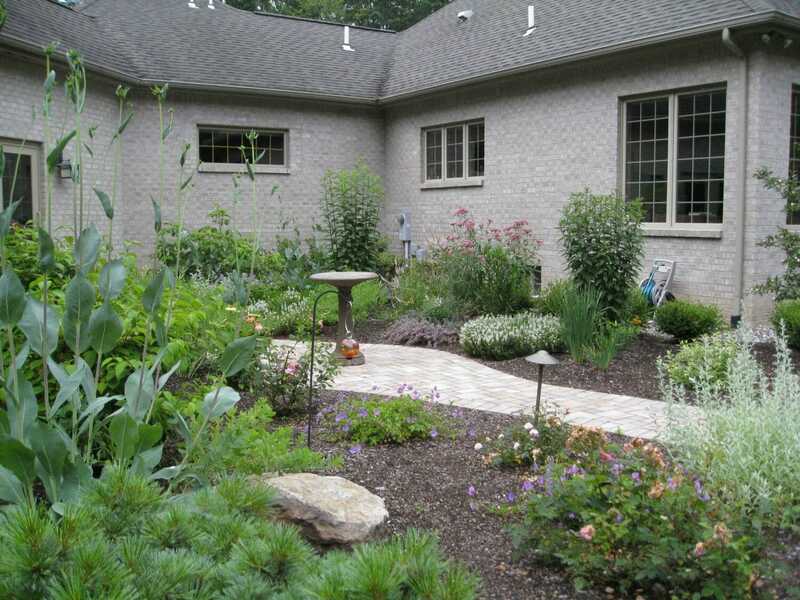 We like to refer to landscape plans that focus primarily on the enjoyment of the plants as garden designs. 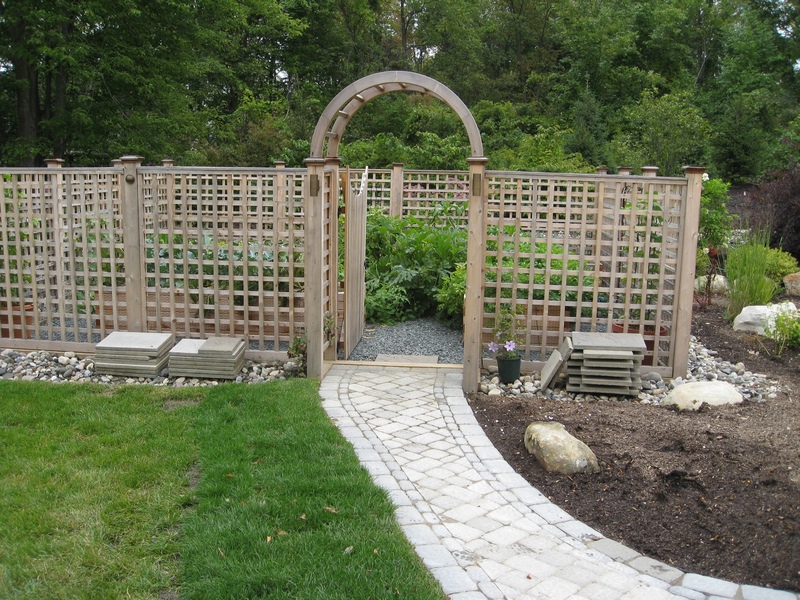 It can be creating a colorful border planting to enjoy from a certain view, adding a greeting bed to welcome visitors as they enter your drive, or building a functional vegetable garden that serves as a decorative focal point. 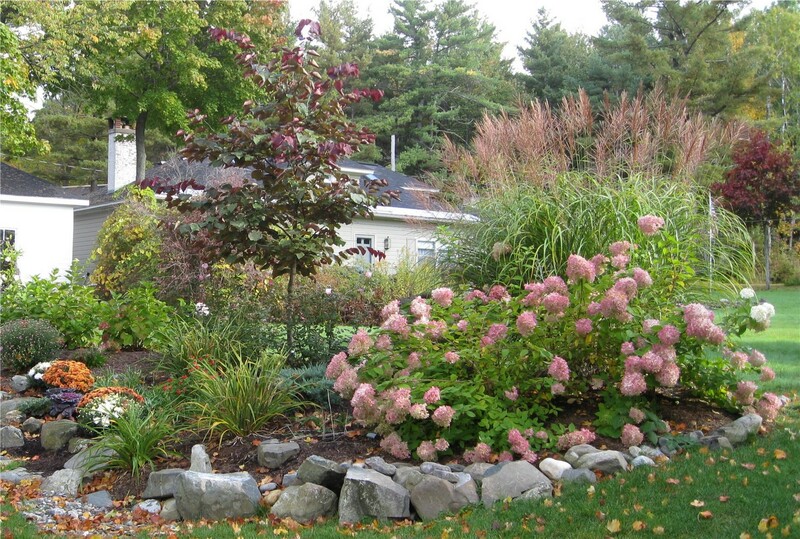 We’ve all seen gardens that were designed and planted using plants that all were peak at a certain time in the season. 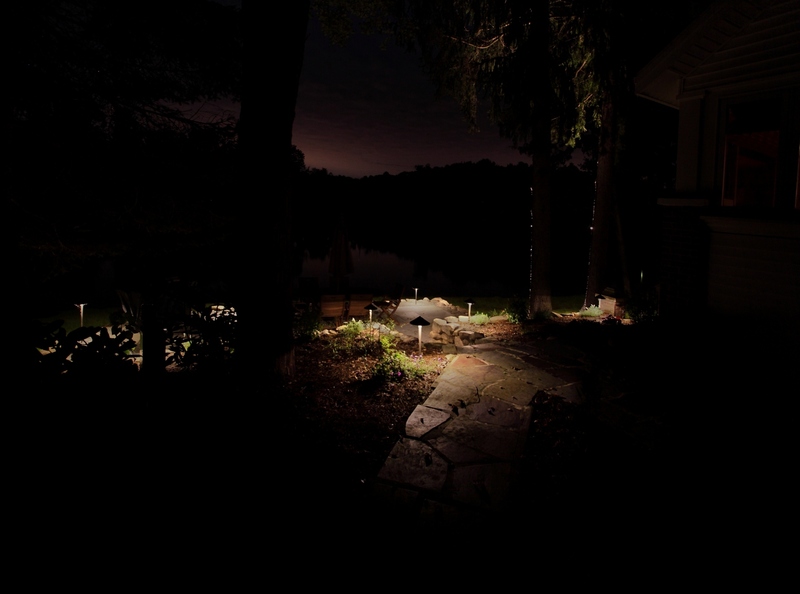 It looks great for a short duration of time but blah at other times. 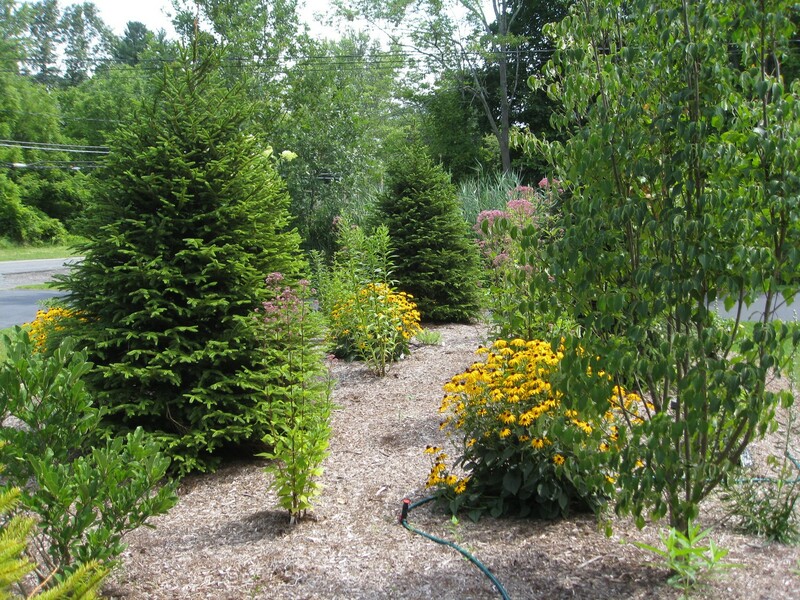 Typically we want to have a succession of bloom throughout the season from early Spring through Fall. 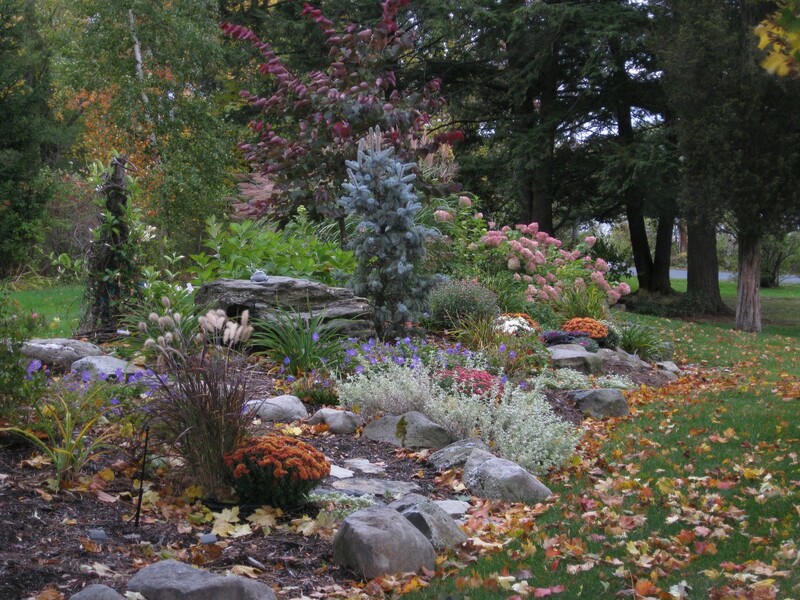 Perennials are balanced by selective use of shrubs and small trees that provide structure, focal points, and Winter interest. 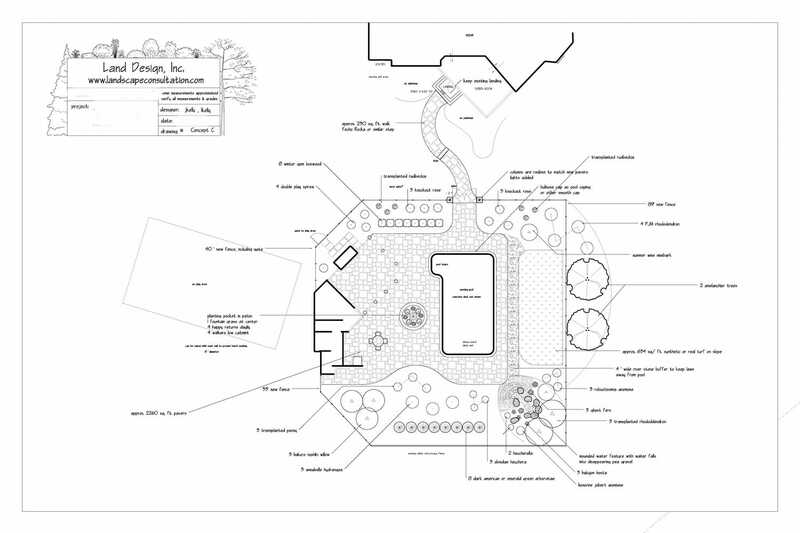 Some of our projects don’t involve a massive overhaul of existing landscapes; very often we are replacing plants within a defined space that is not changing. 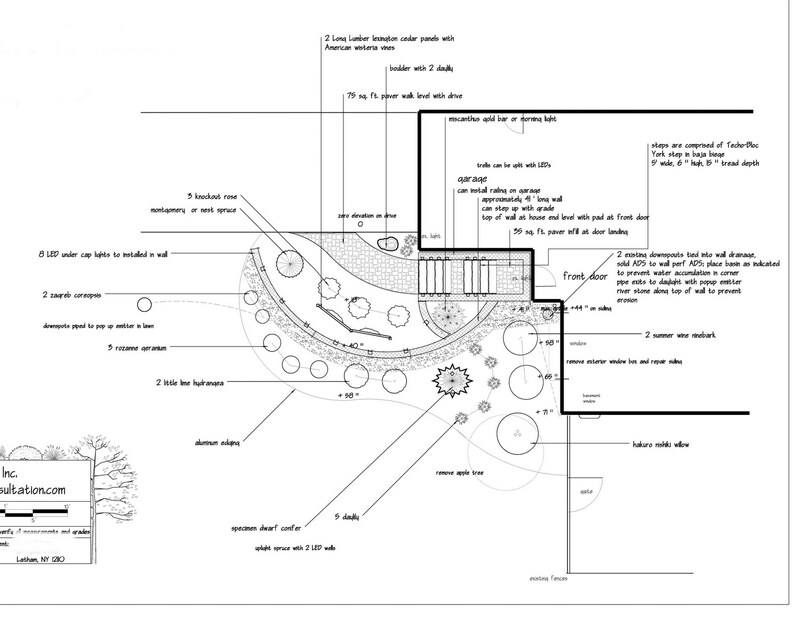 Often these planting installations emanate from a simple 2 hour landscape consultation. 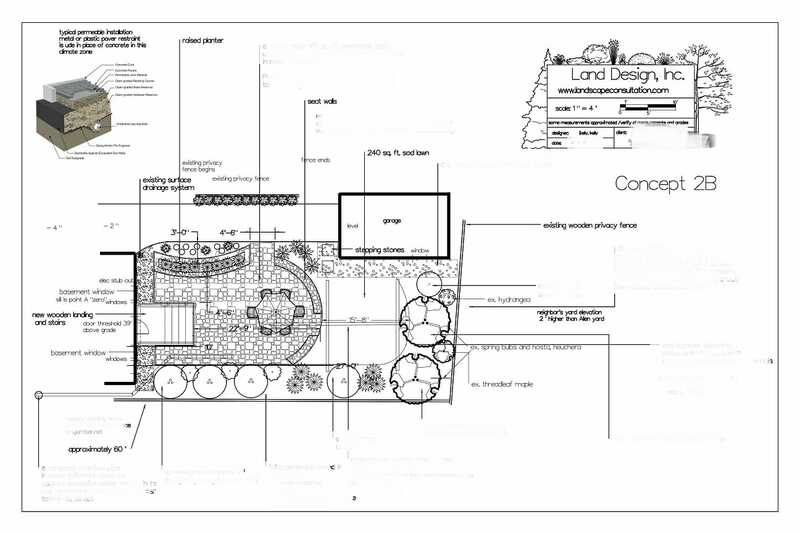 I Want to Design my Landscape!